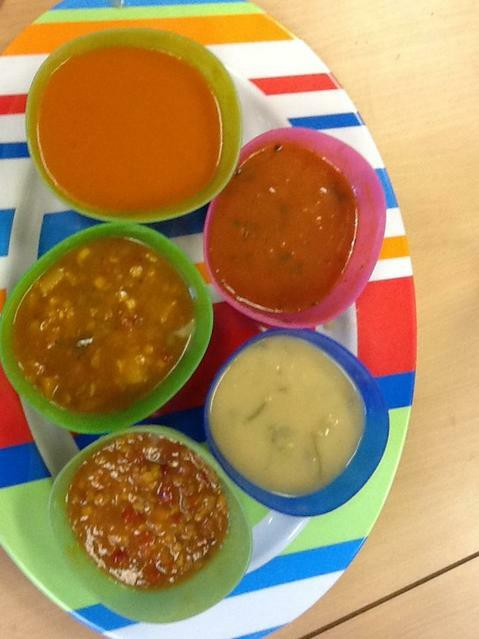 Today we blind tasted a variety of soups! 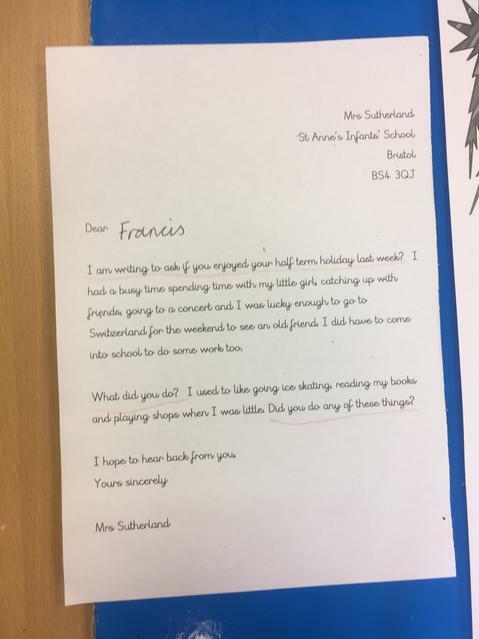 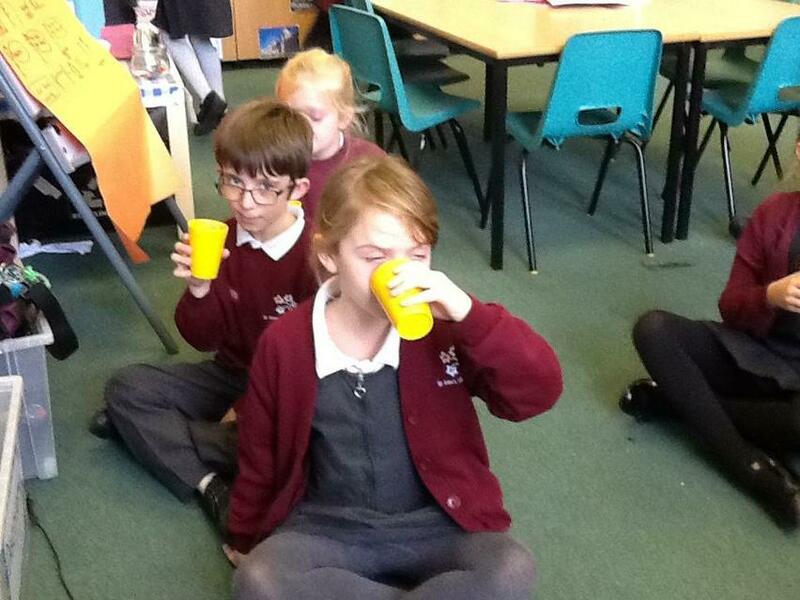 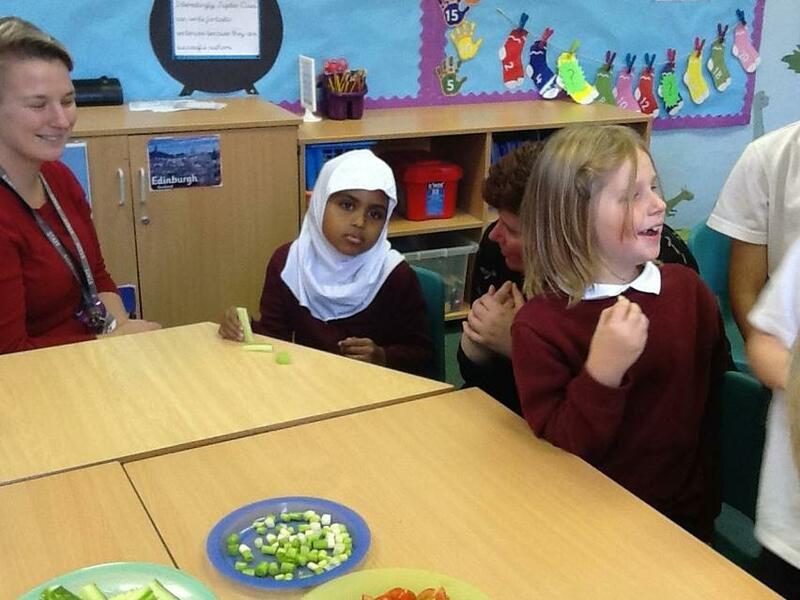 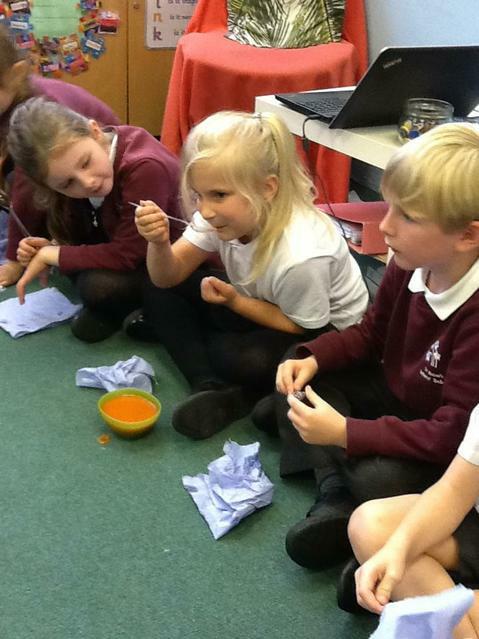 We had to be very adventurous because it made us feel nervous to try food without knowing the flavour. 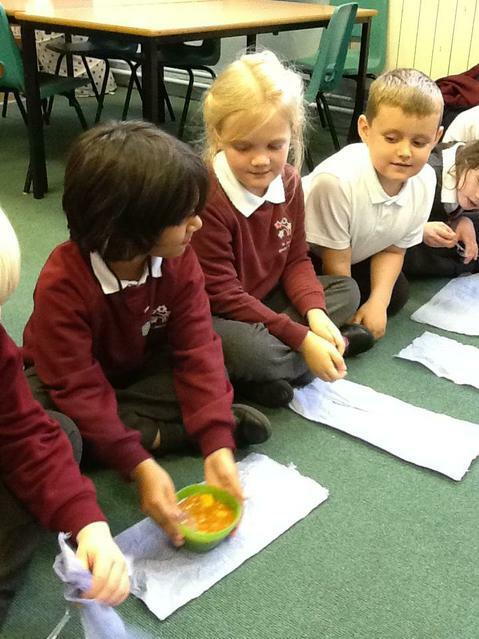 We explored that soup is healthy because it is packed with lots of vegetables! 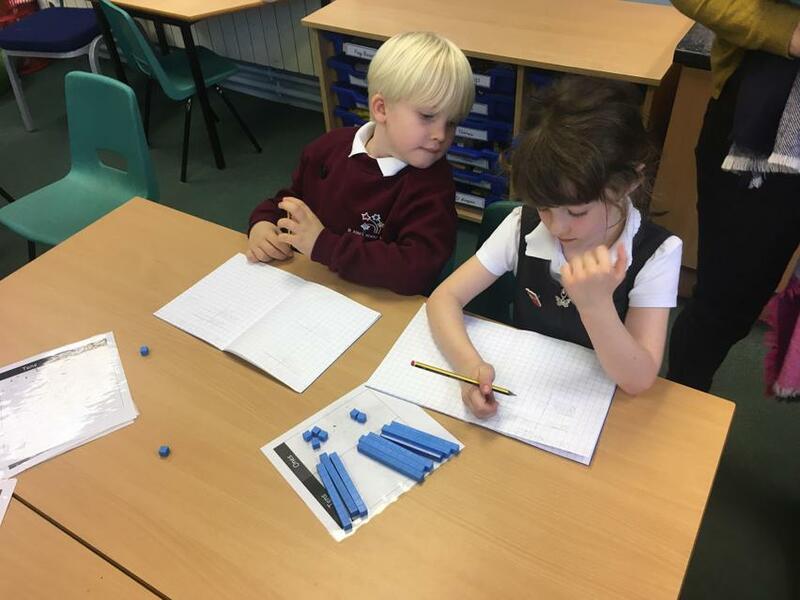 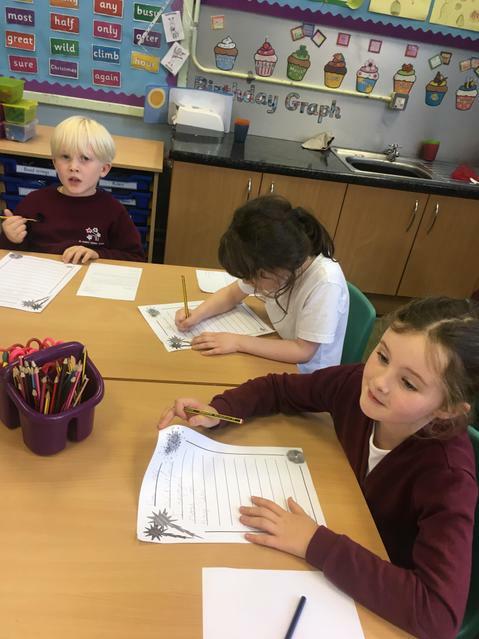 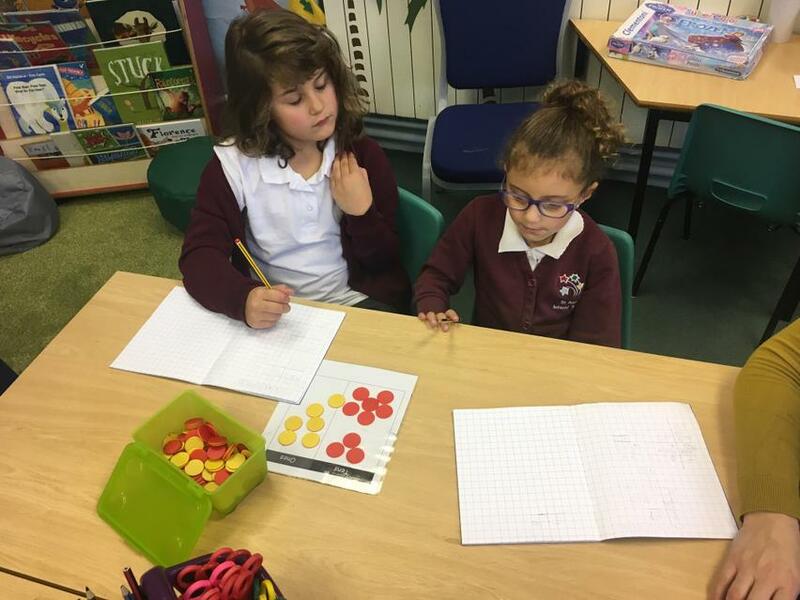 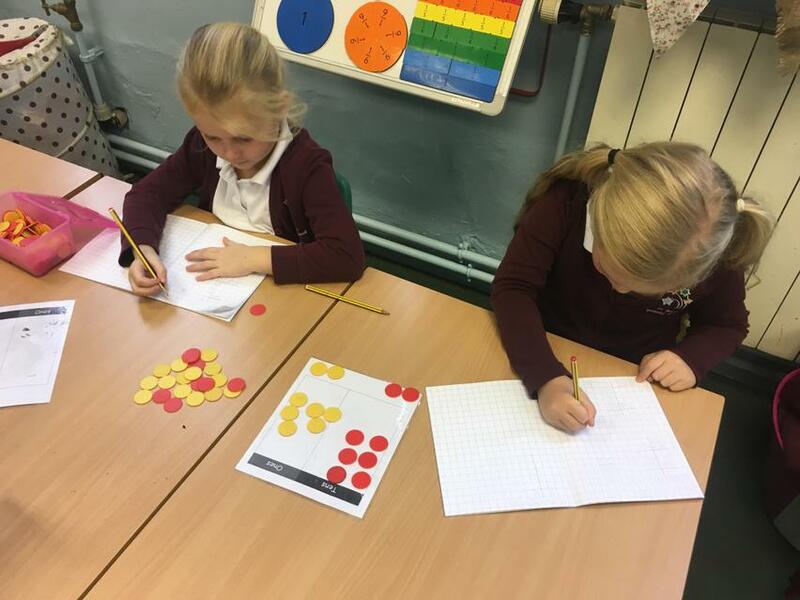 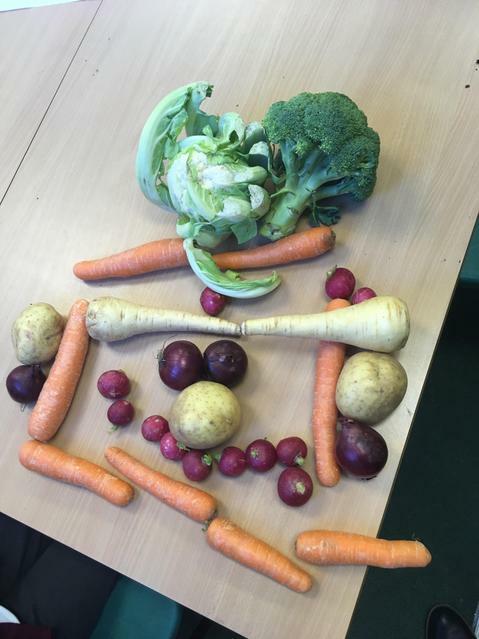 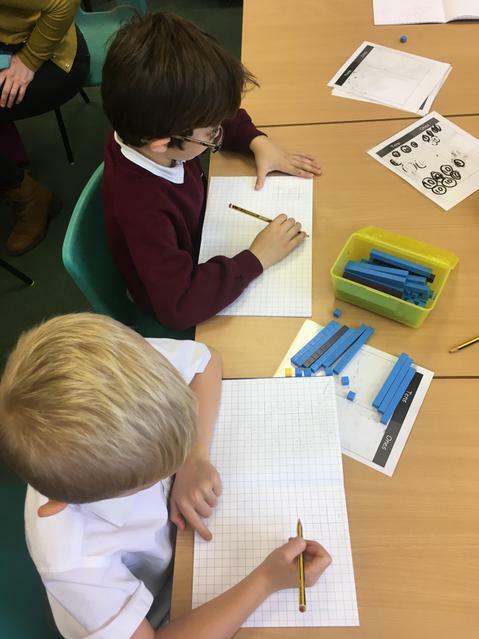 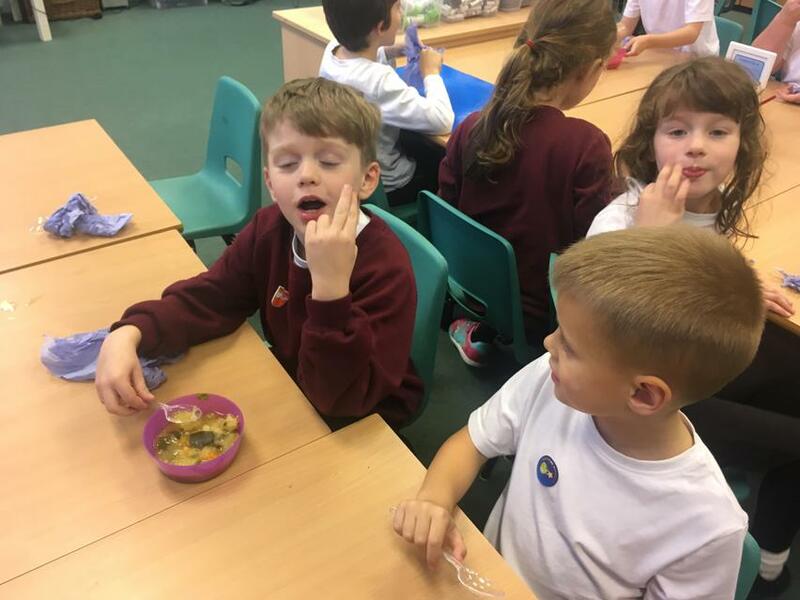 We tasted various vegetables today and as mathematicians we created a tally chart to find the most popular and the least favorite vegetable in Jupiter Class. 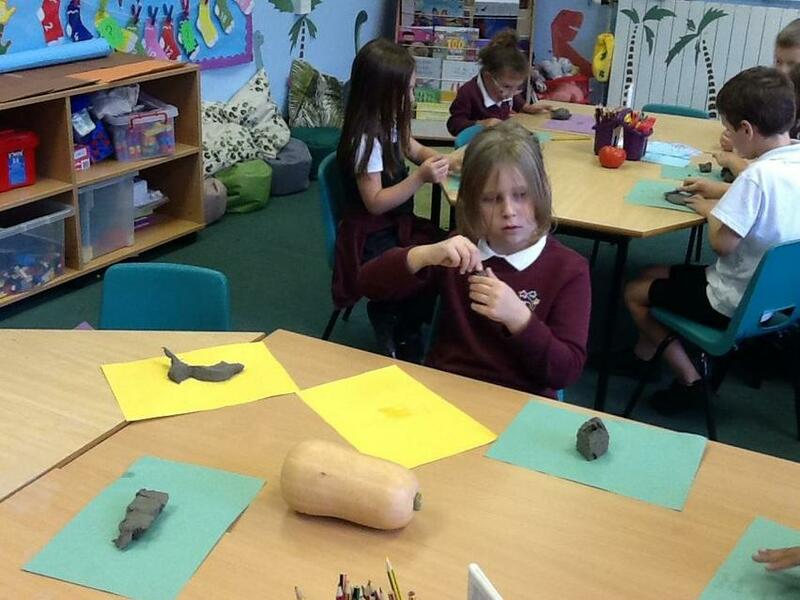 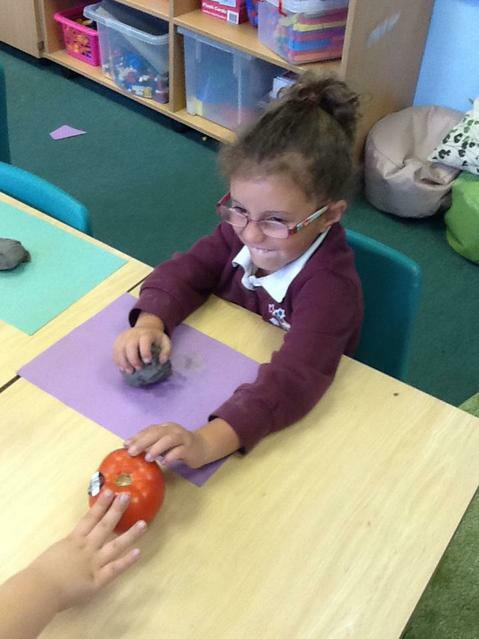 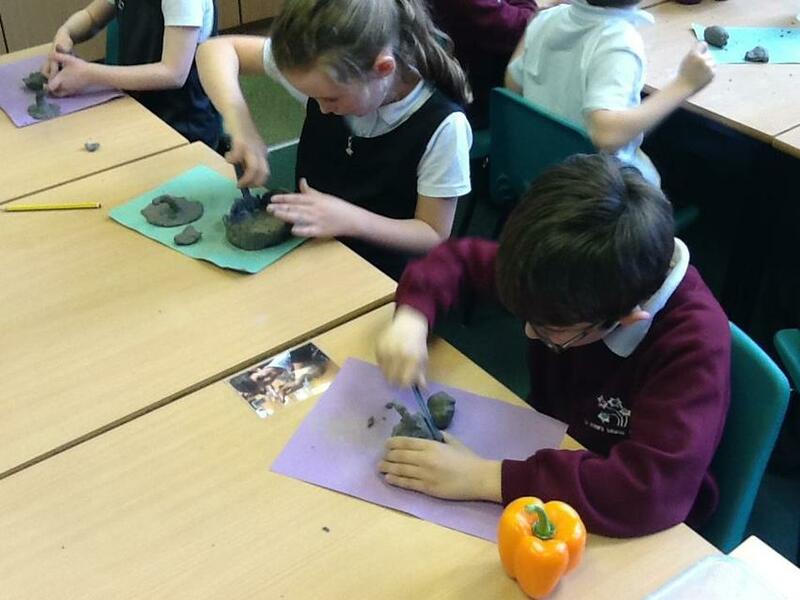 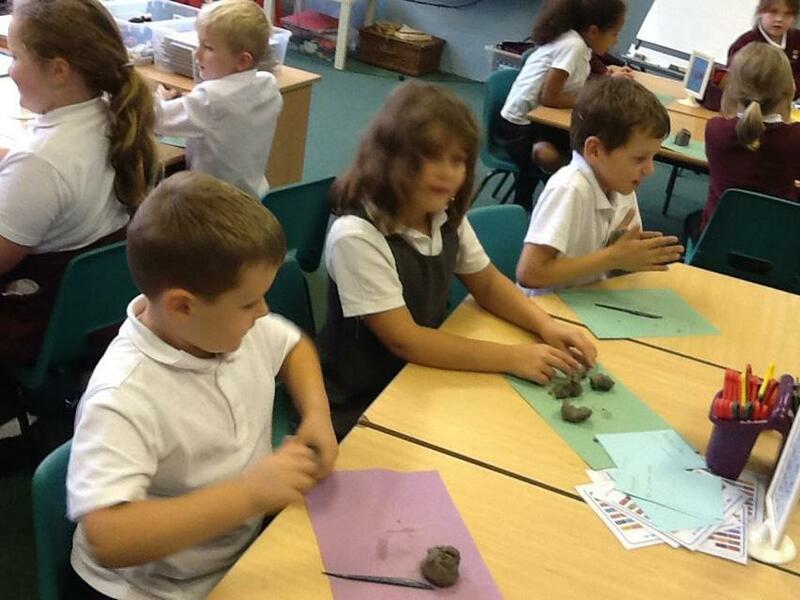 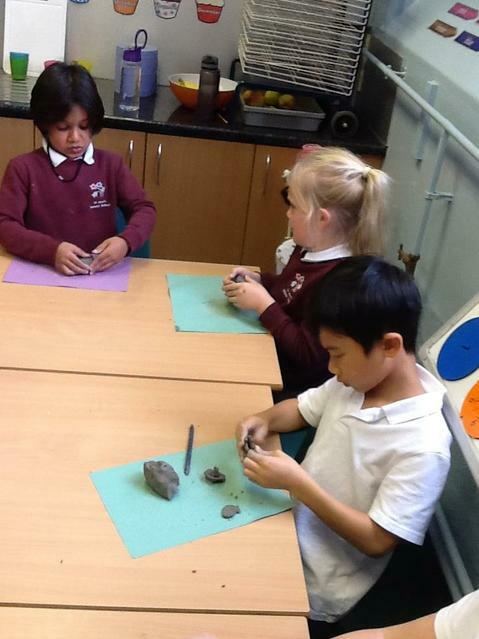 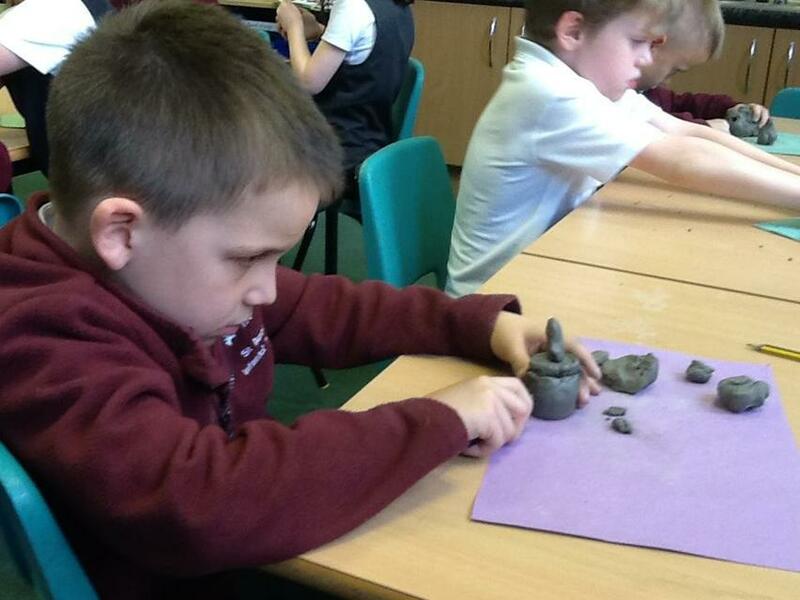 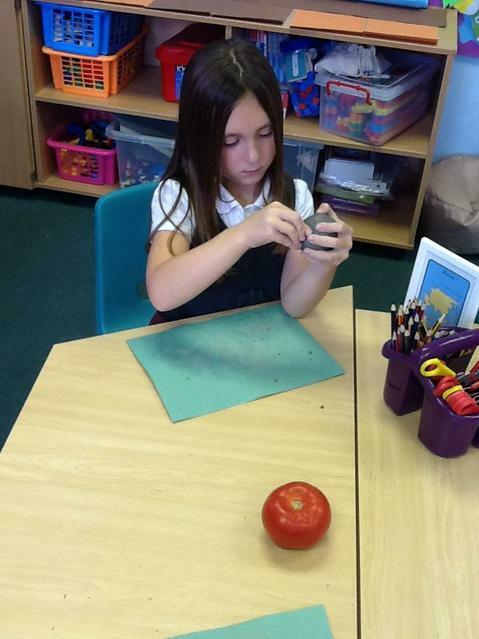 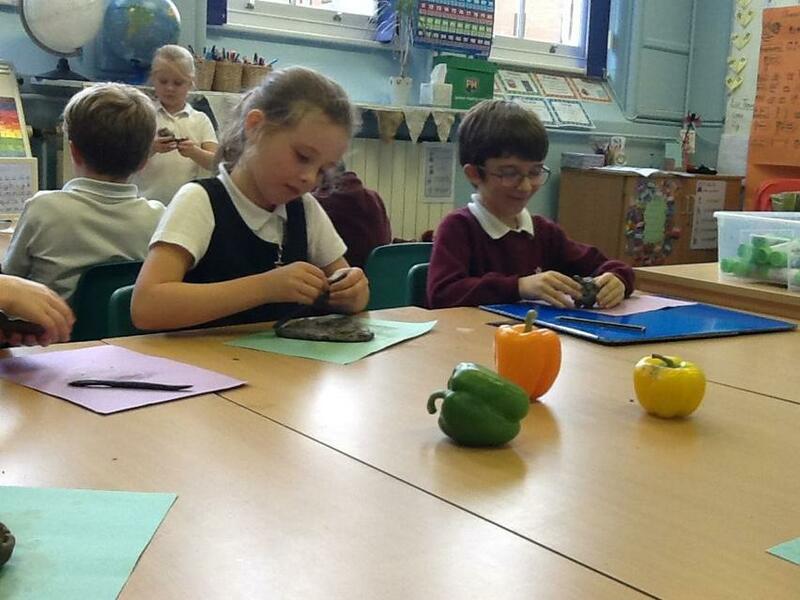 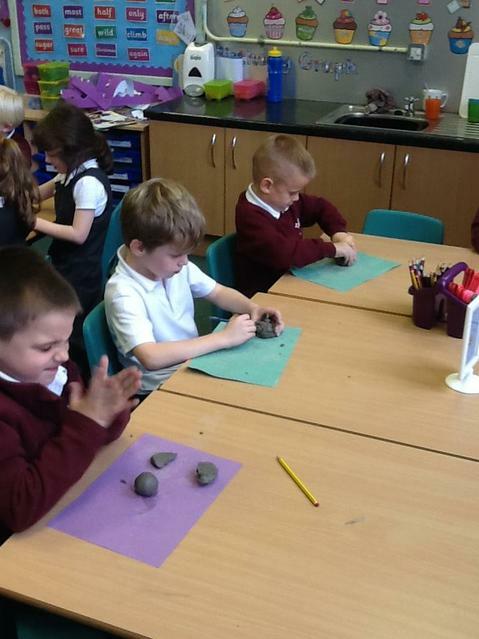 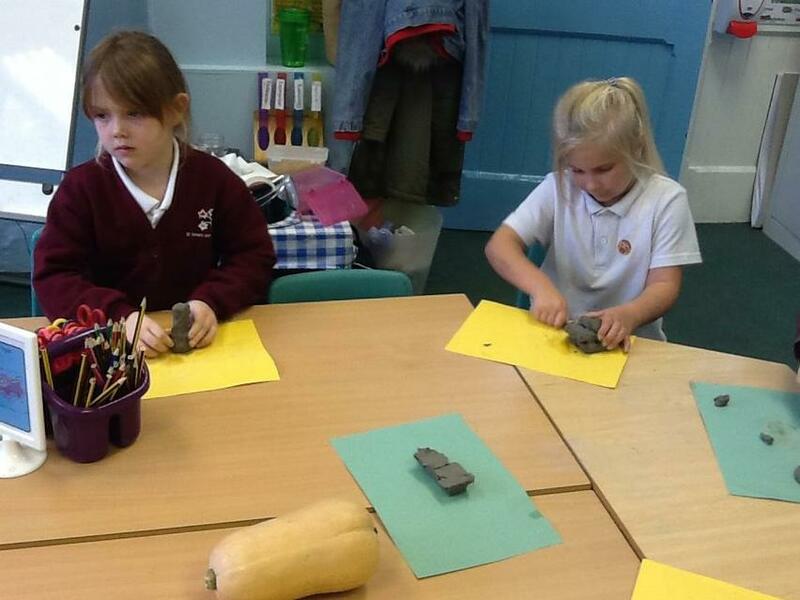 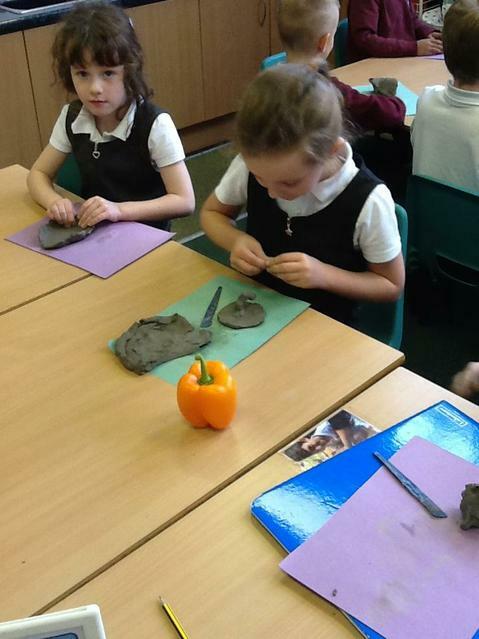 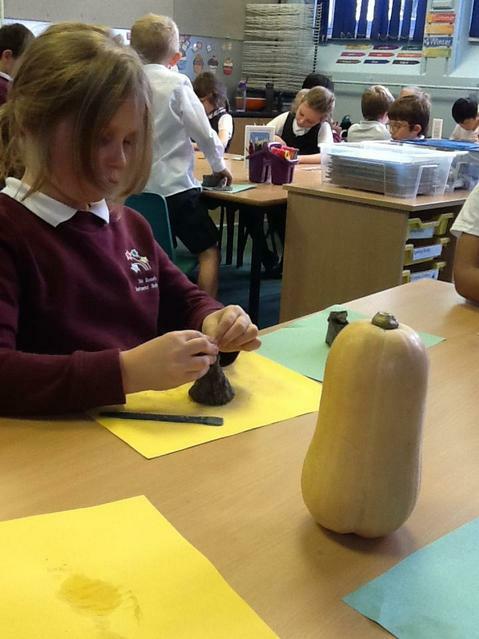 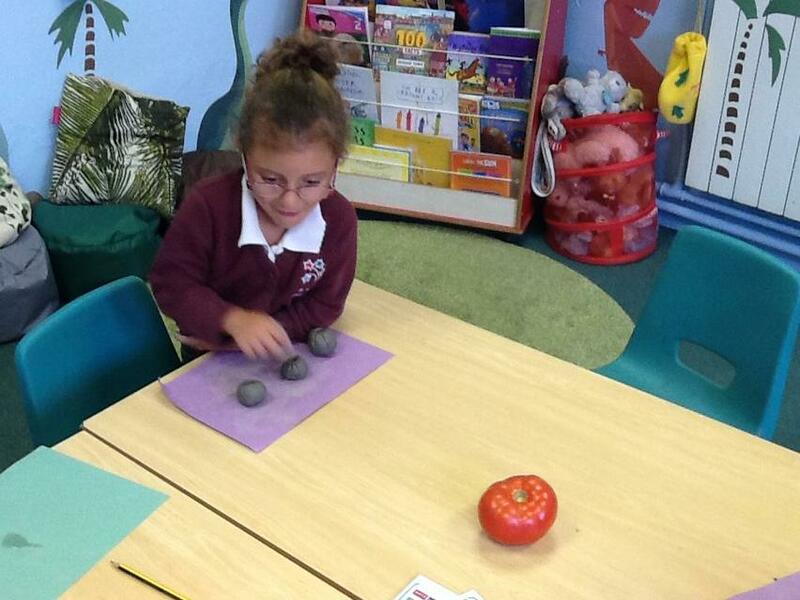 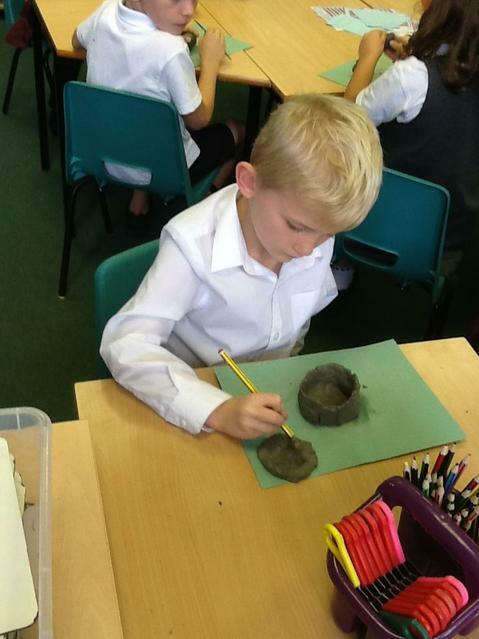 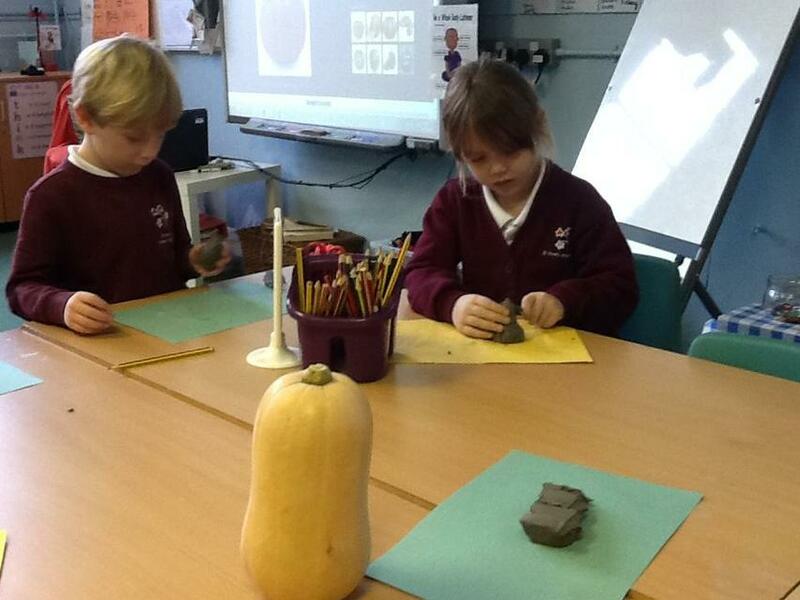 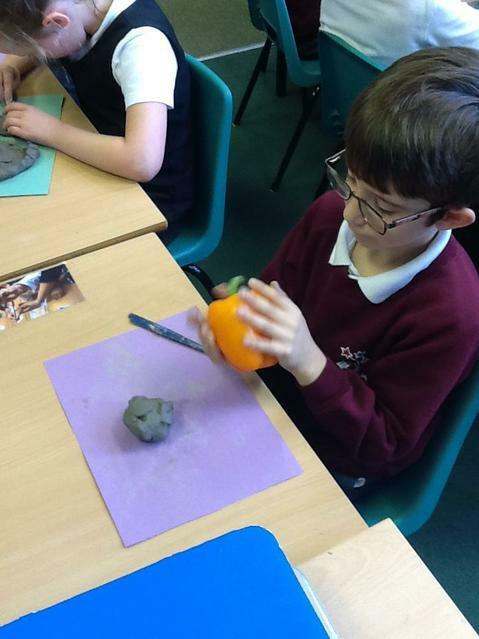 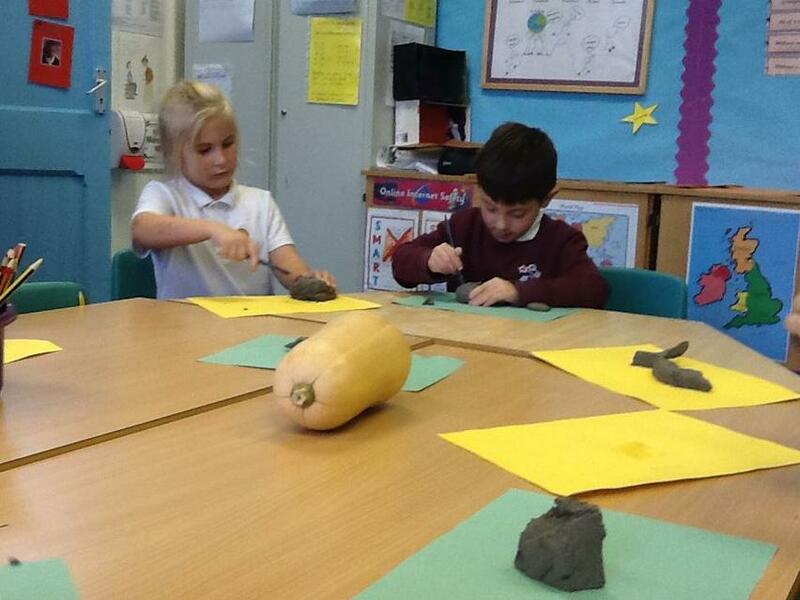 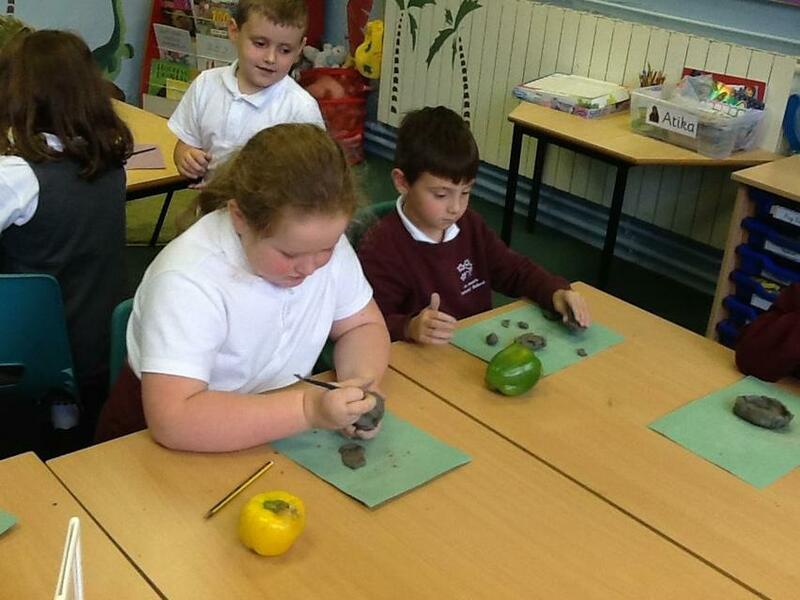 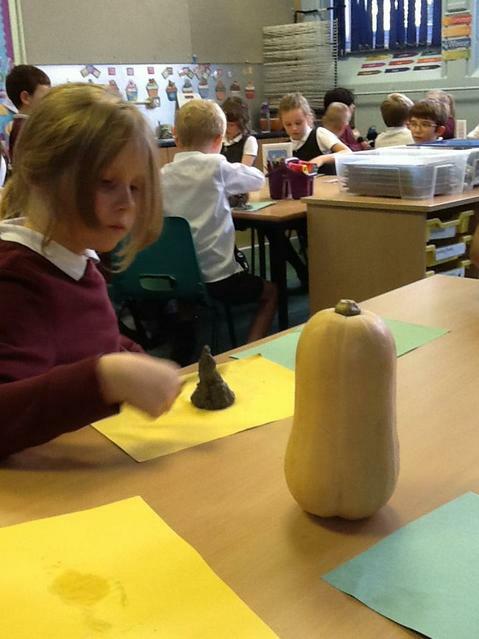 We have been artists today, sculpting vegetables out of clay. 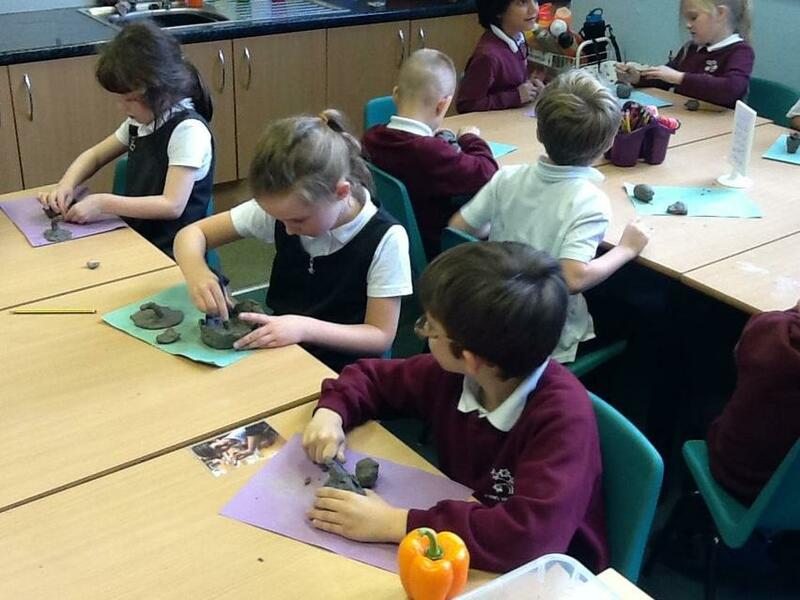 We explored the artist Kate Malone and made sculptures inspired by her! 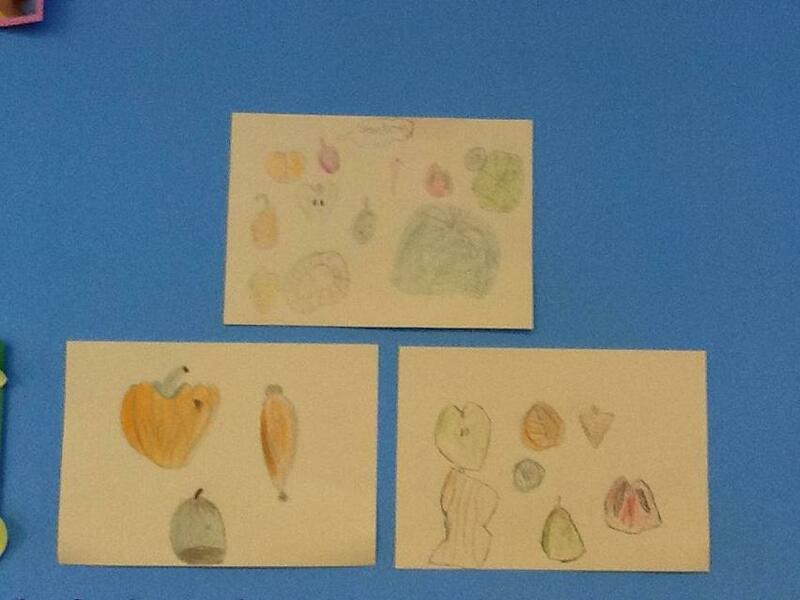 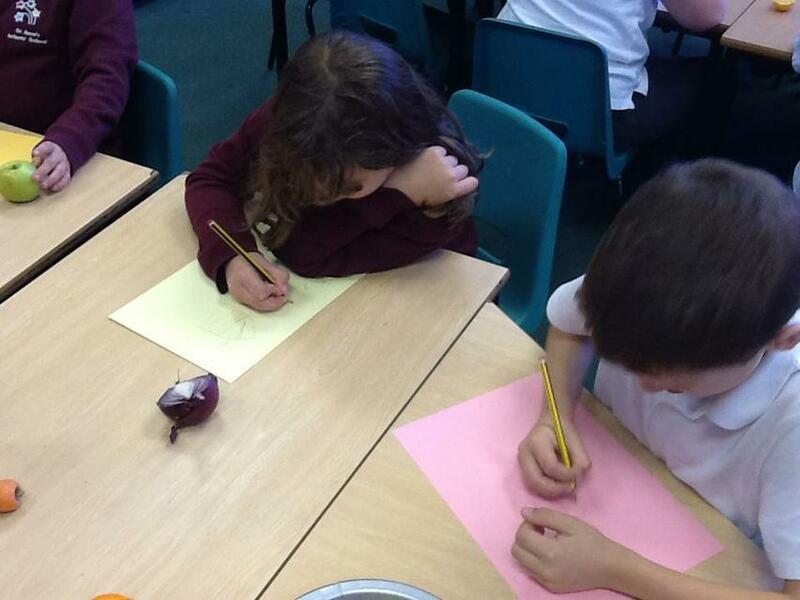 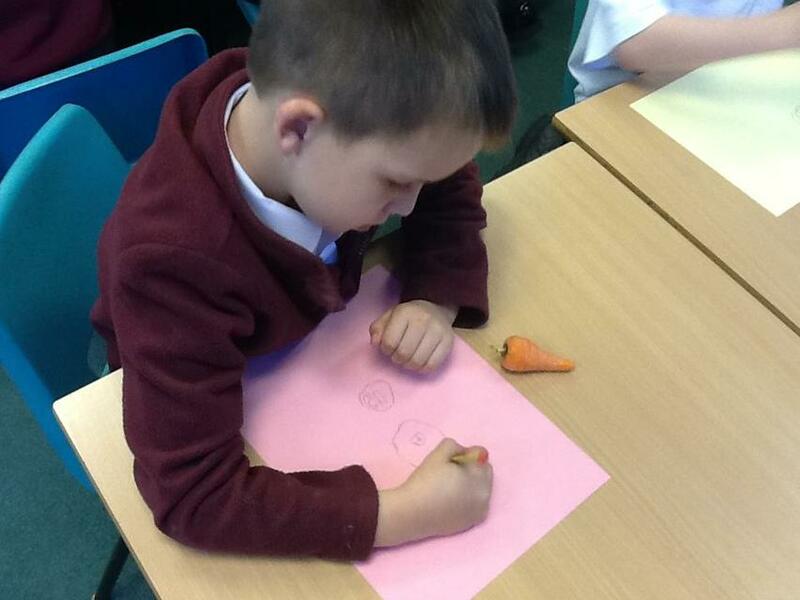 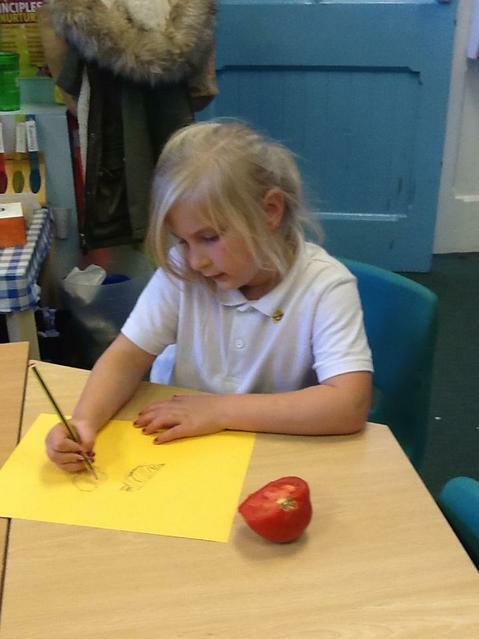 We have been developing our skills as artists today, learning how to use our pencils to sketch! 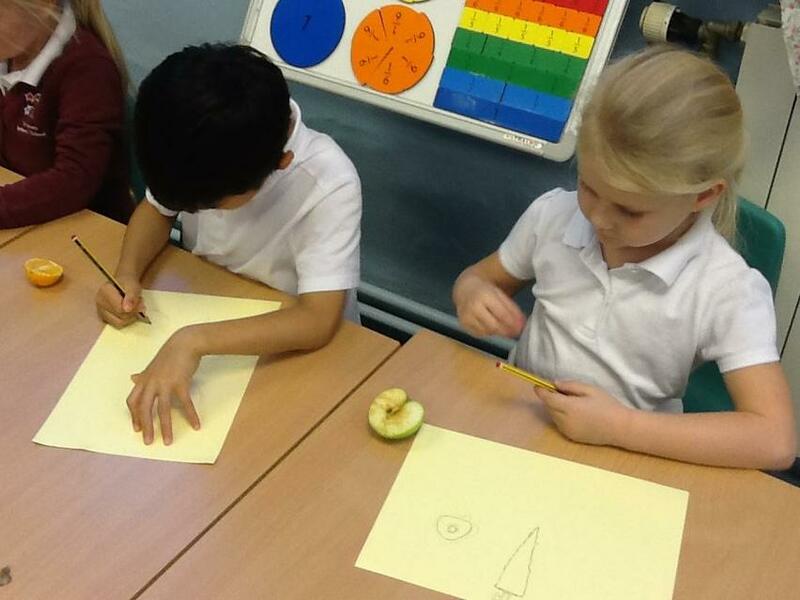 We looked closely for light and shade to try and make our drawings as realistic as possible. 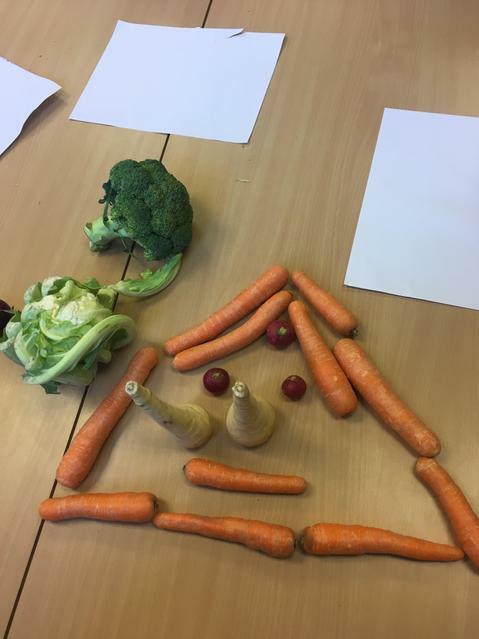 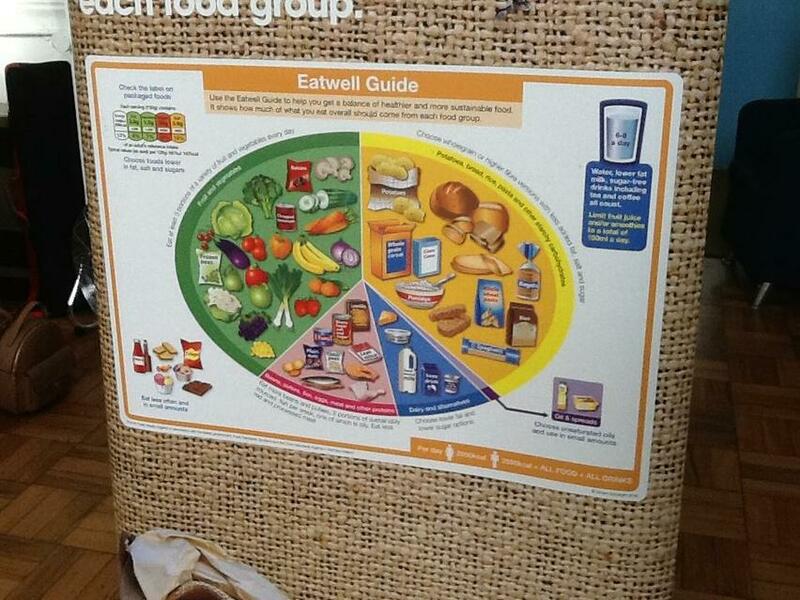 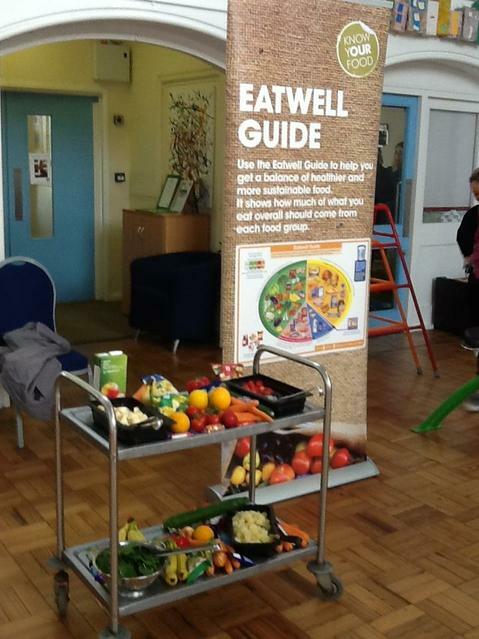 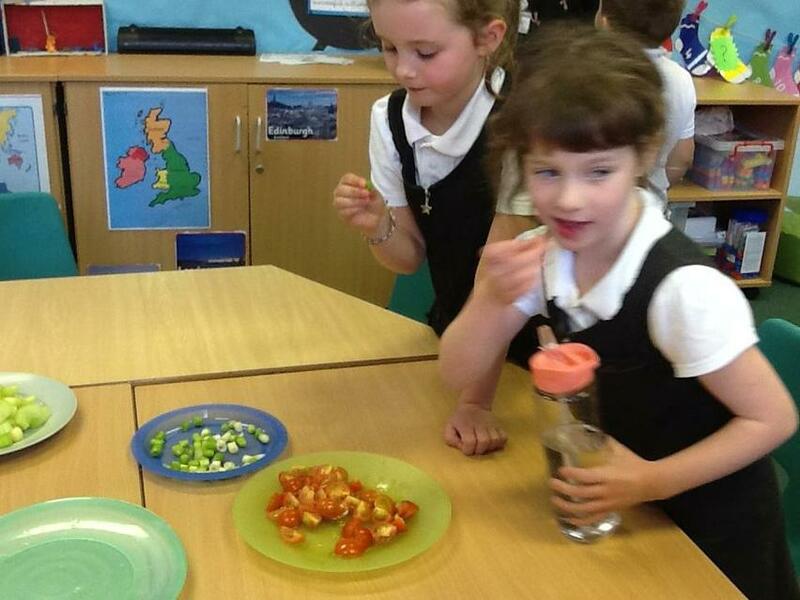 Today we had Chartwells in who taught us about a balanced diet. 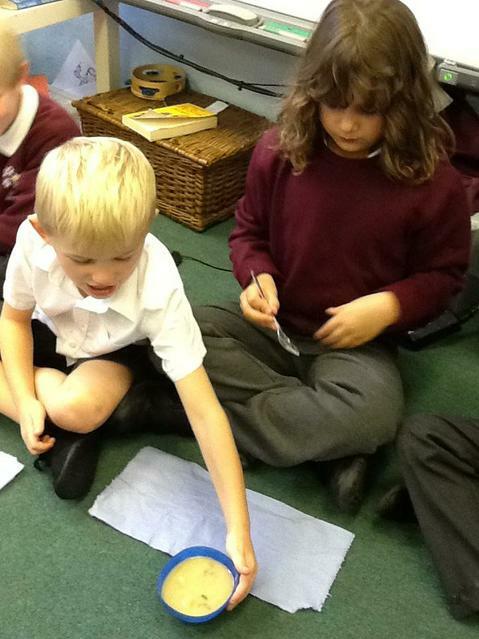 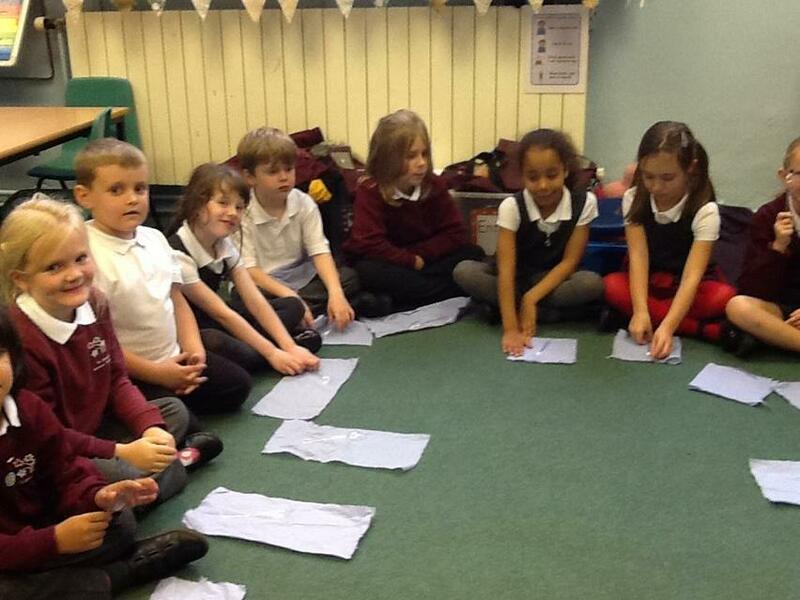 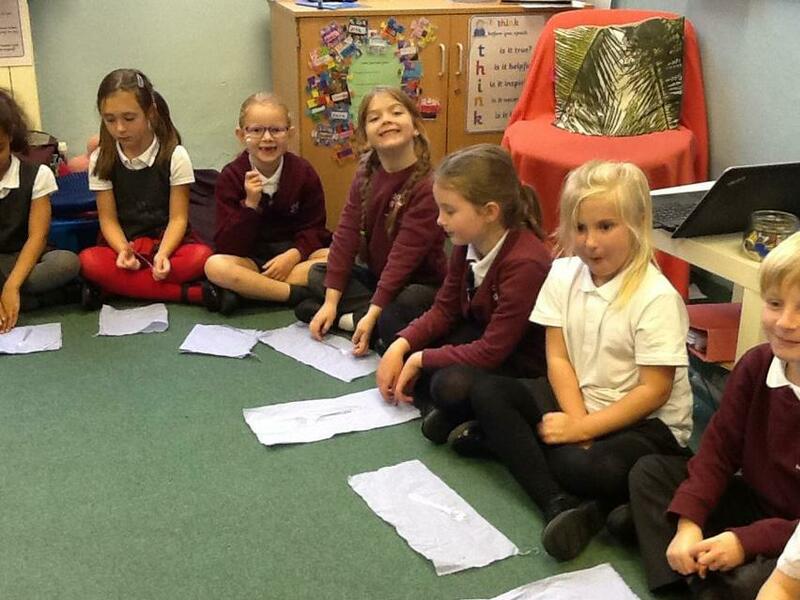 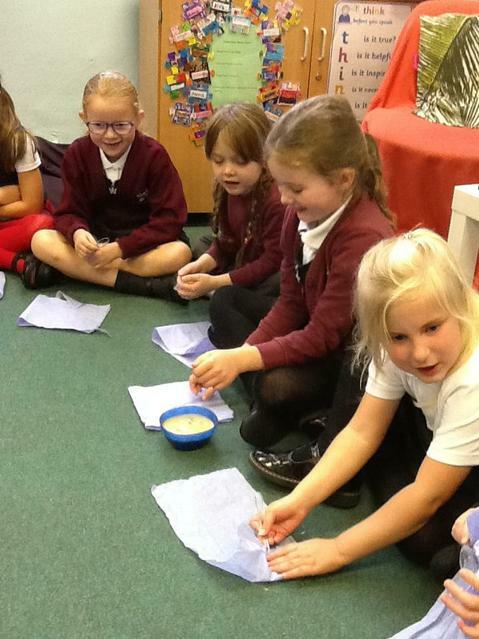 We explored the 'eat well plate' and what would happen to our bodies if we had too much sugar or salt. 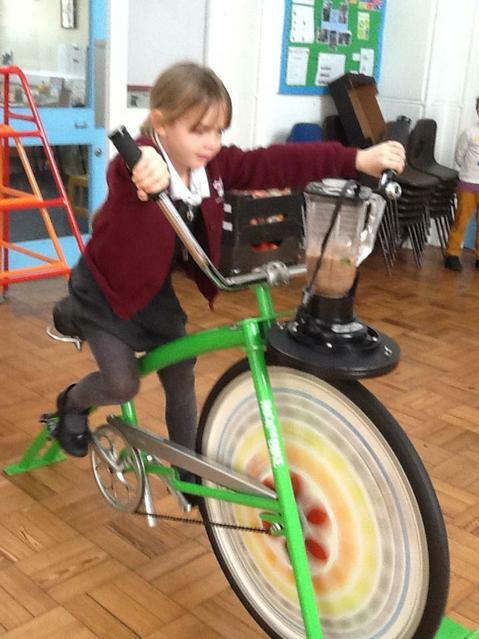 After that we completed a rainbow relay to make a smoothie. 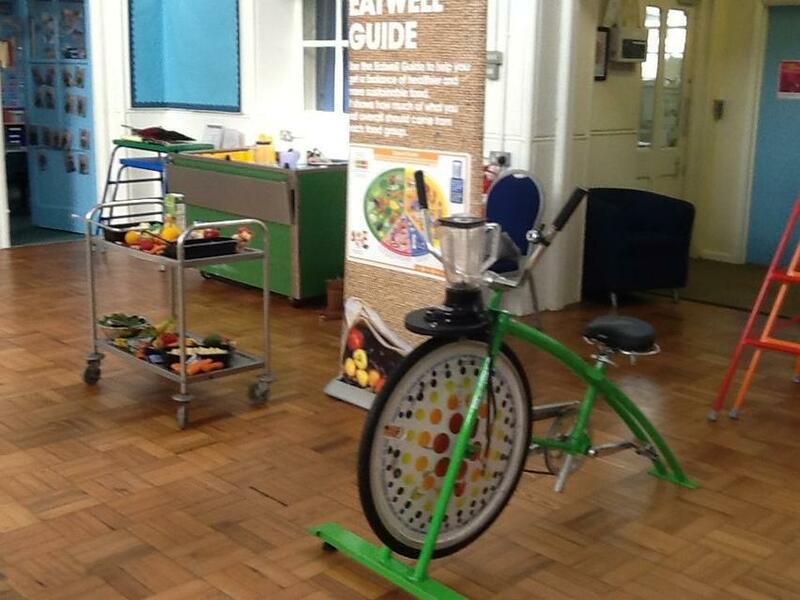 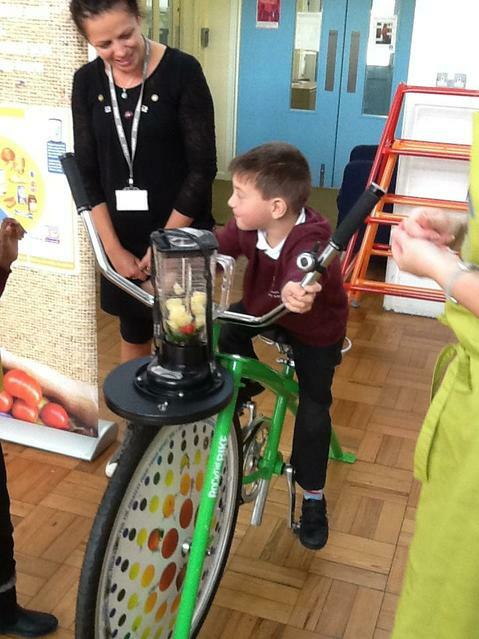 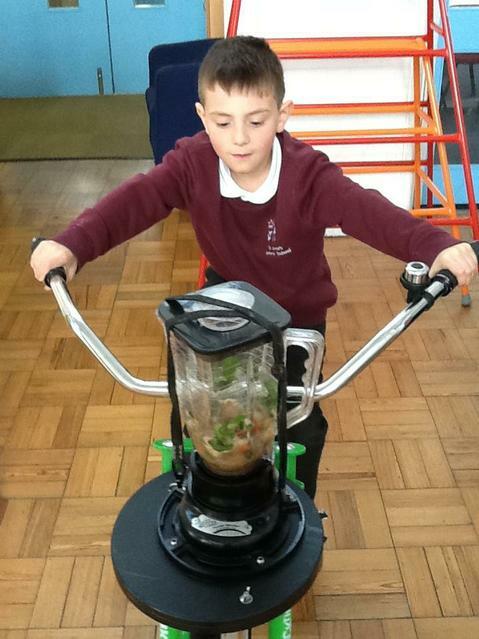 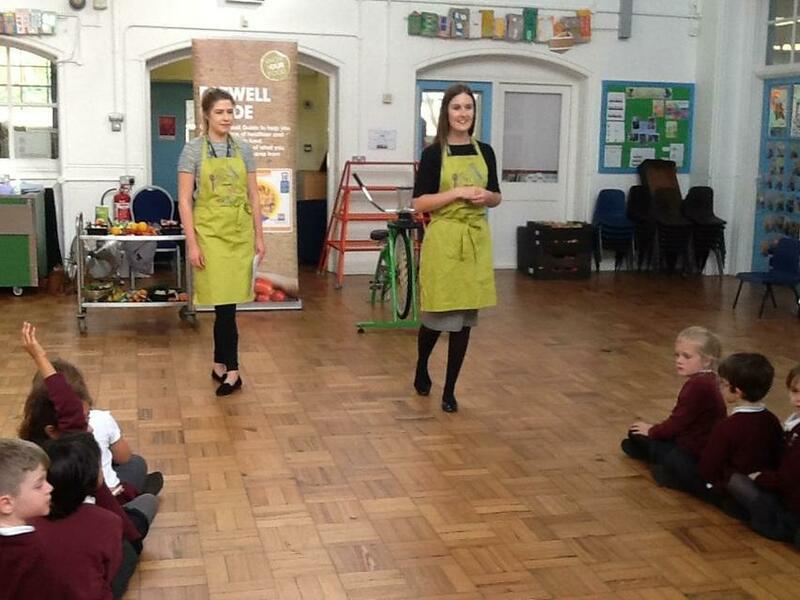 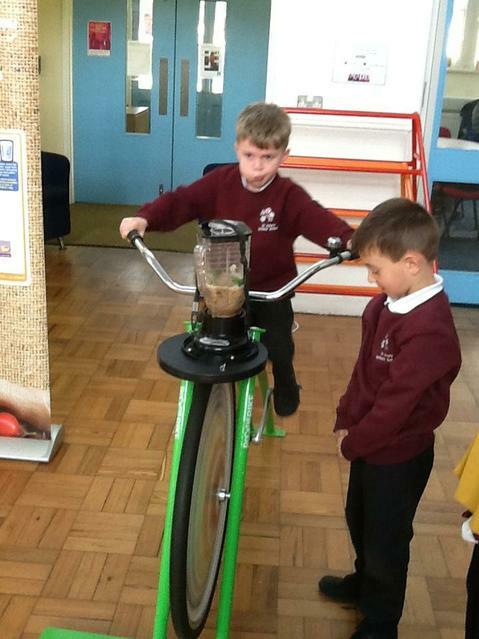 Some of us got to ride the smoothie bike which blended the smoothie. 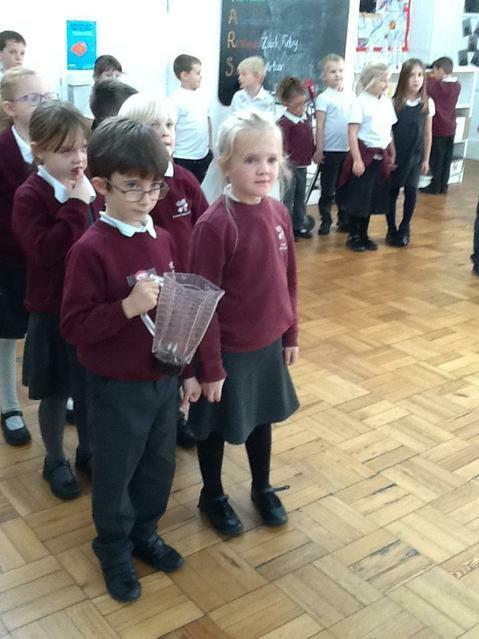 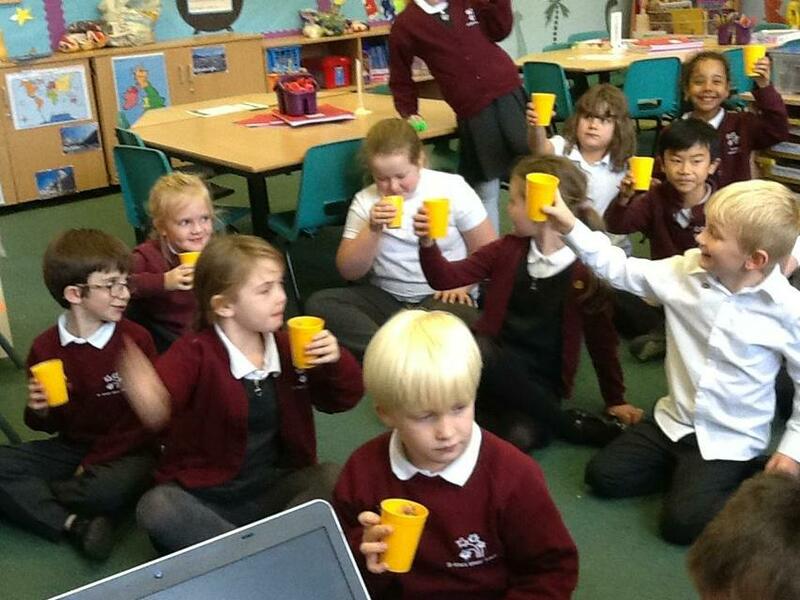 We all tasted the smoothie after, it was delicious! 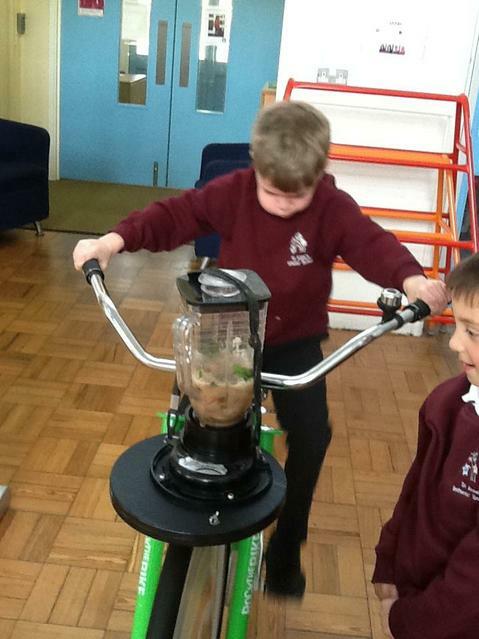 Lots of us could not believe that there was spinach in our smoothie! 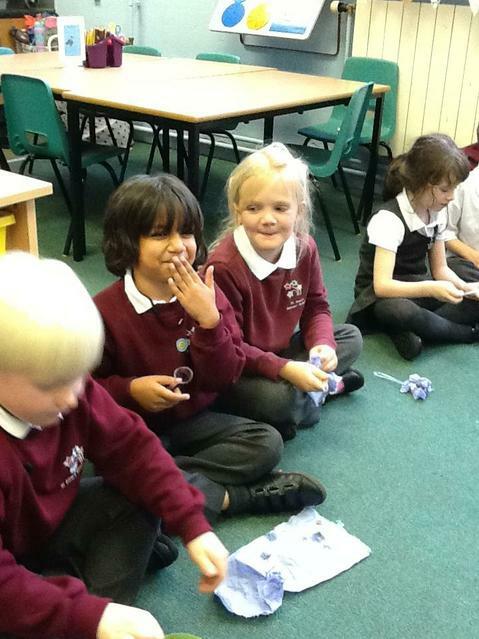 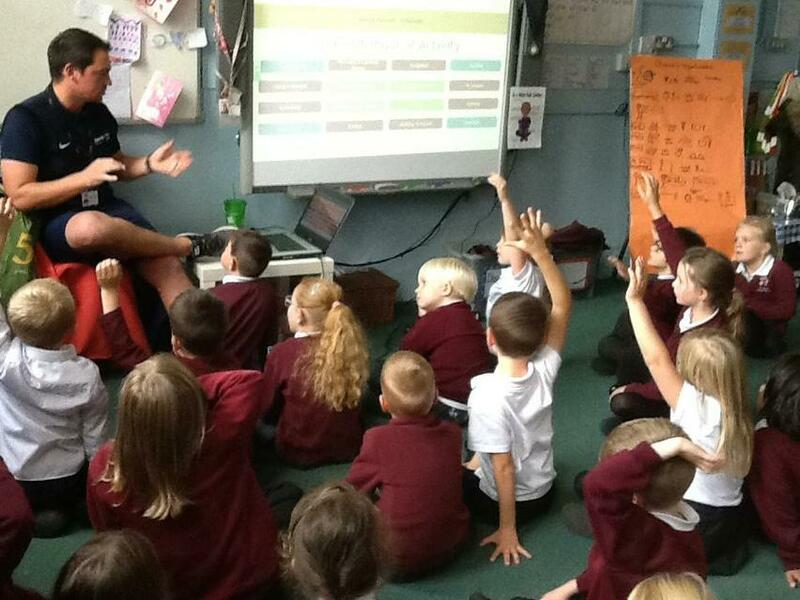 Today, Year 2 had a visit from Mr Andrews from Sports Plus Scheme. 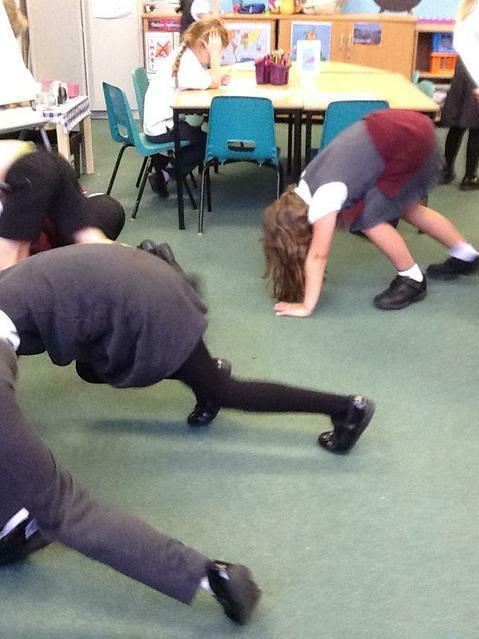 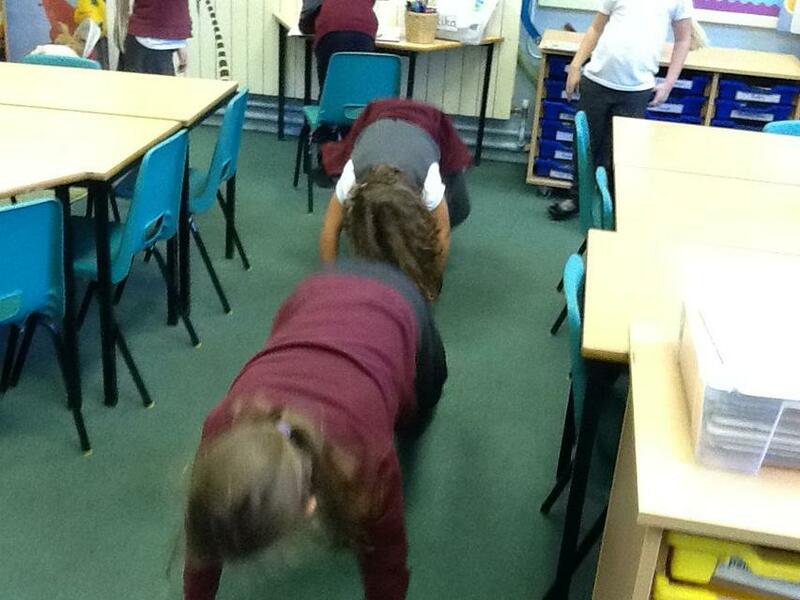 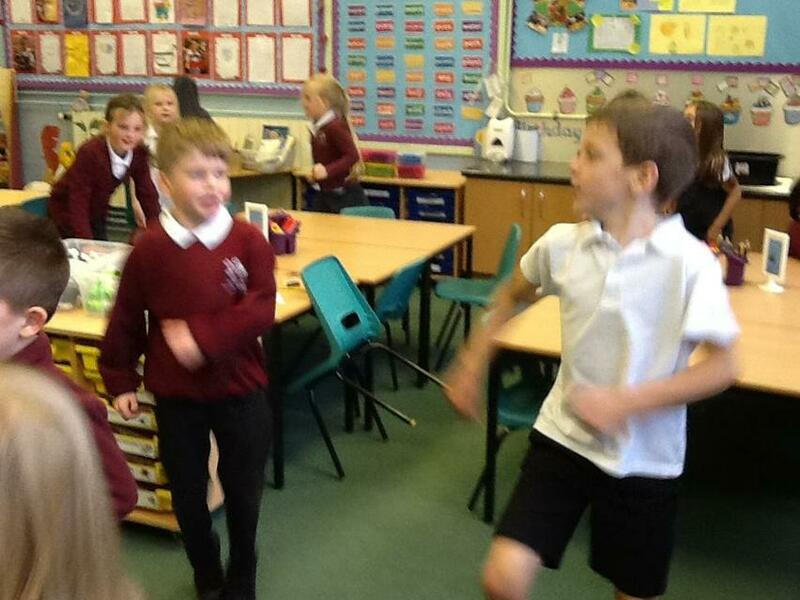 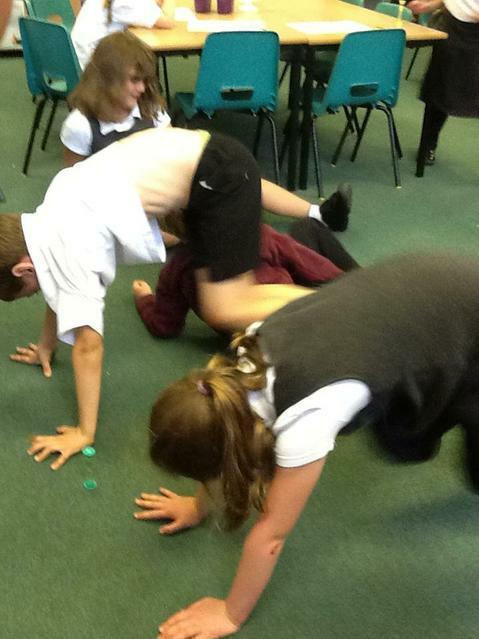 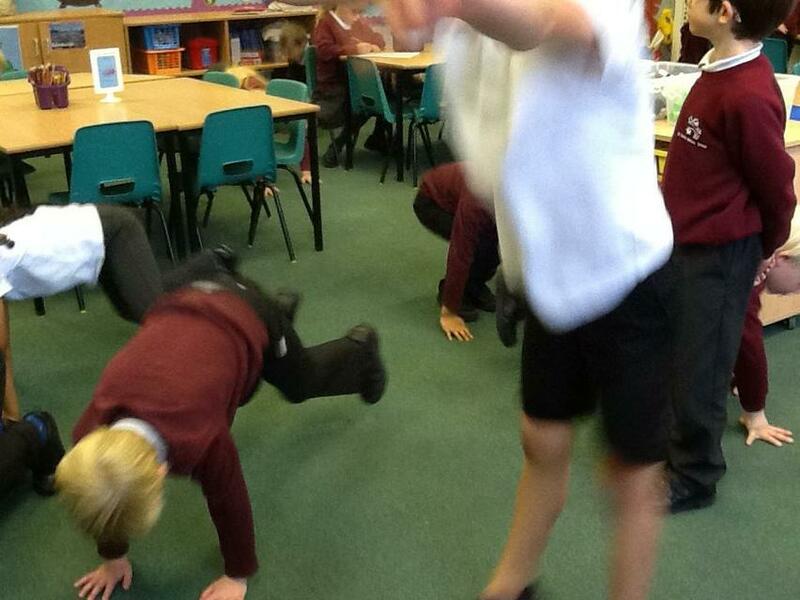 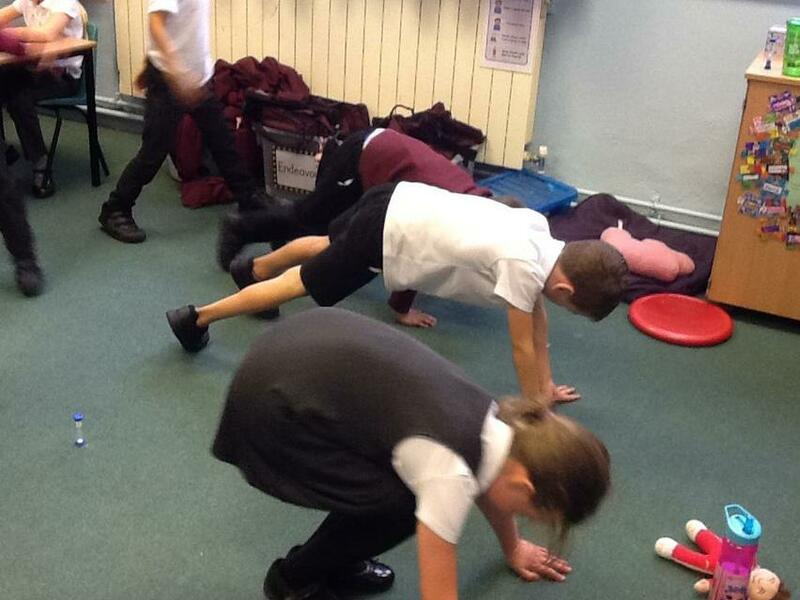 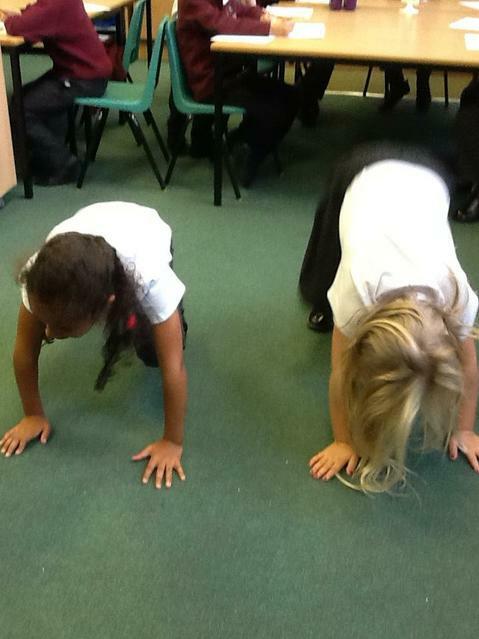 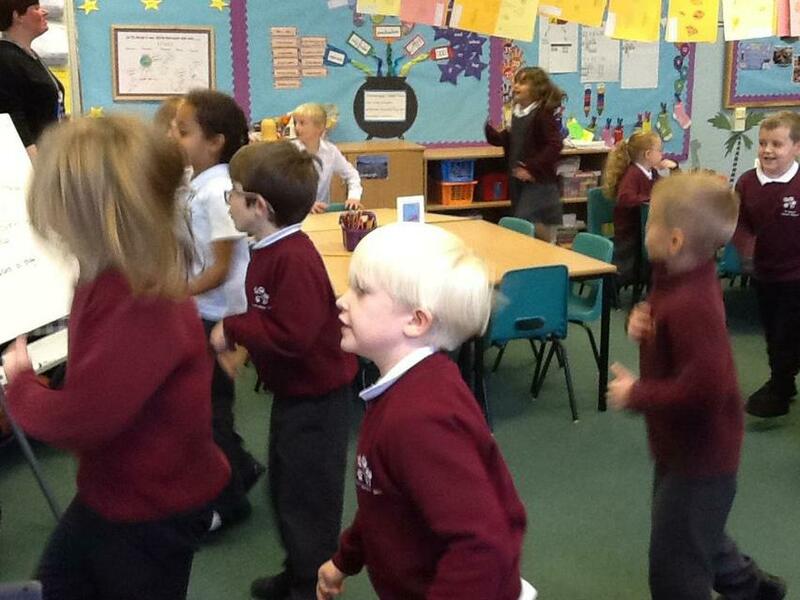 He spoke to the children about the benefits of exercise and the affect it has on our bodies. 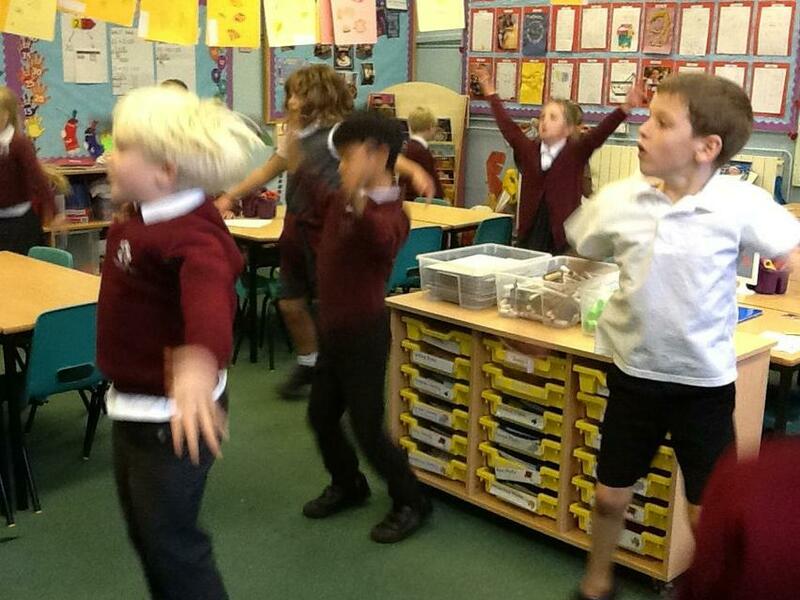 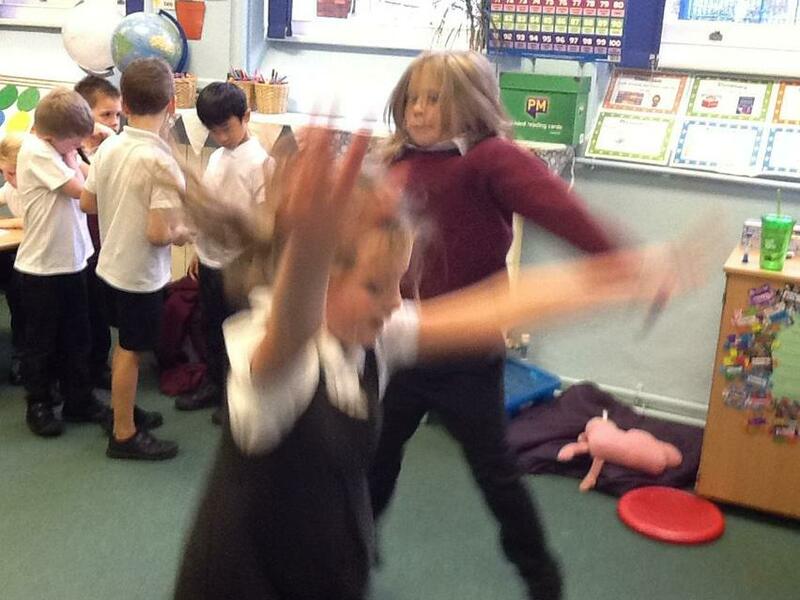 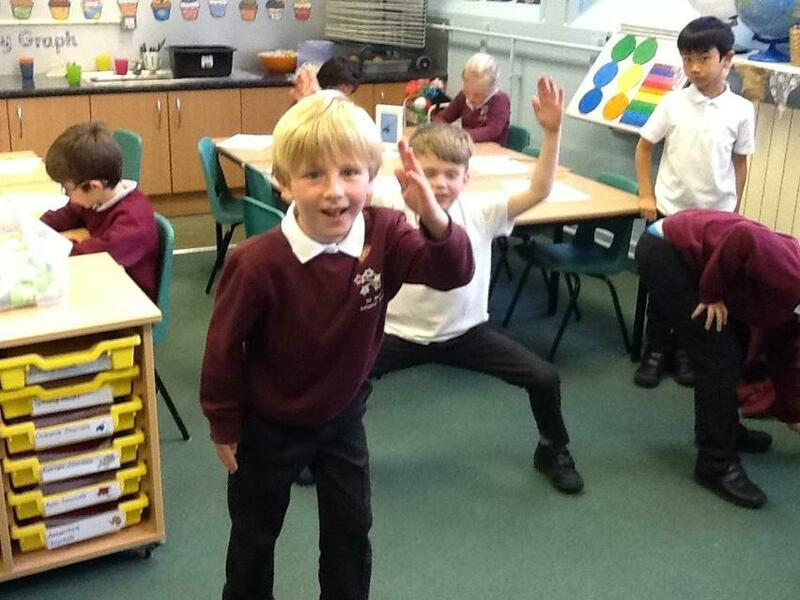 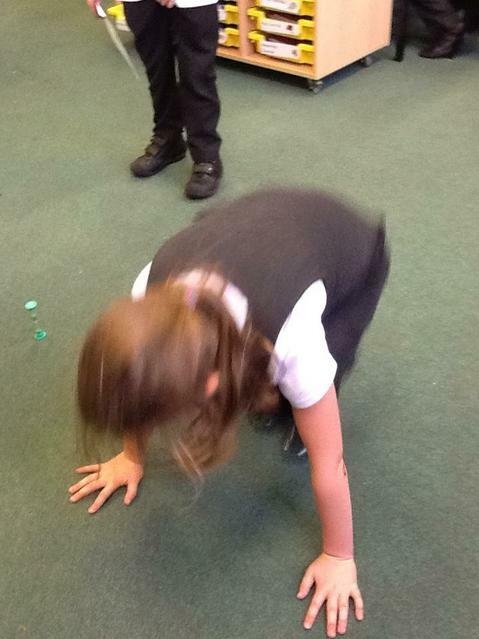 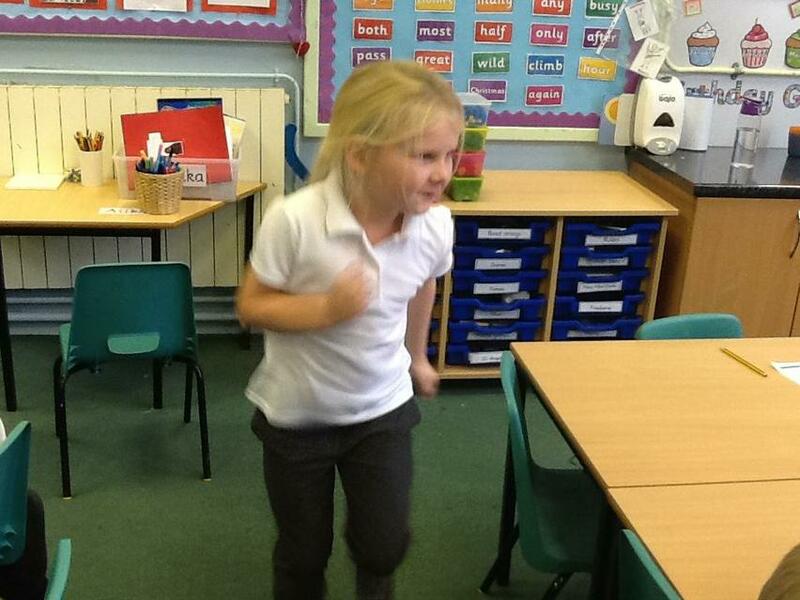 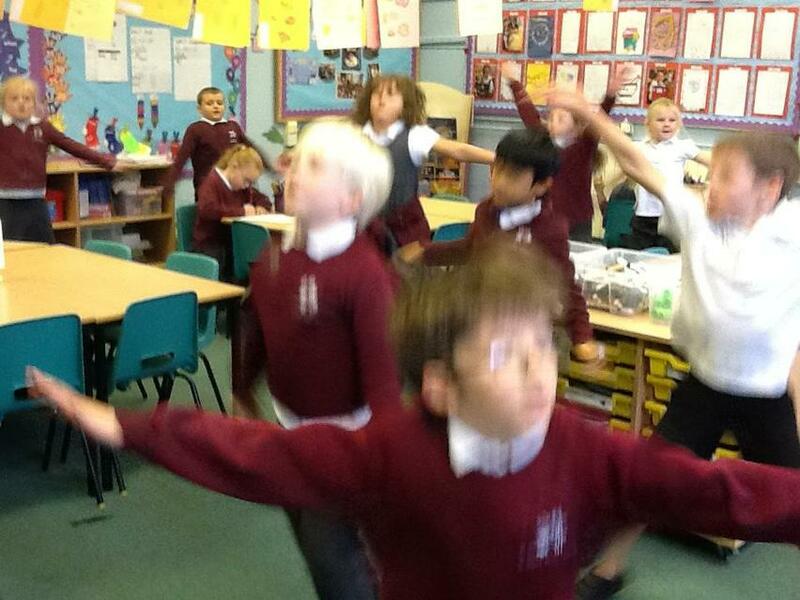 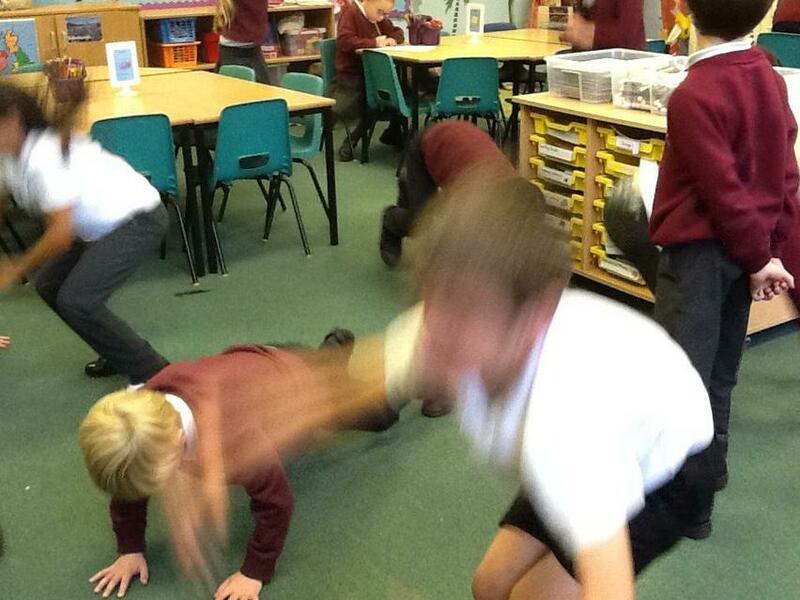 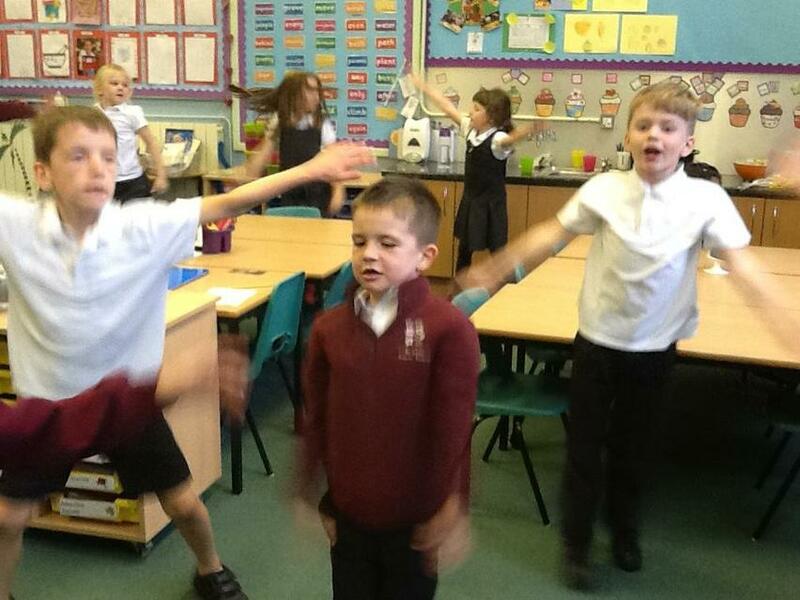 After that, Jupiter Class tested how many of a given exercise they could do in 1 minute and recorded the affect it had on their body. 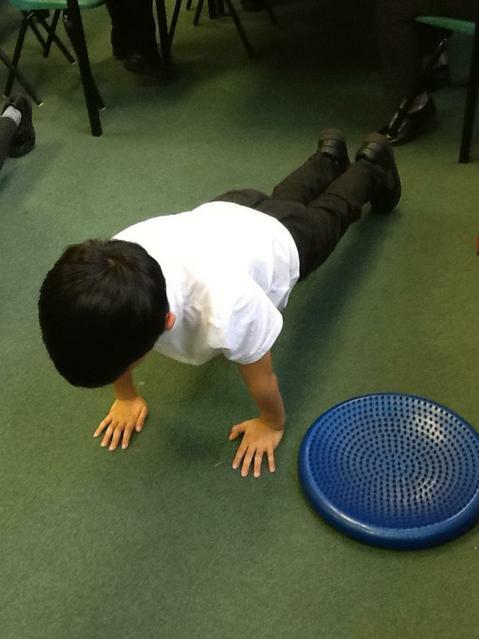 What knowledgeable athletes we now are! 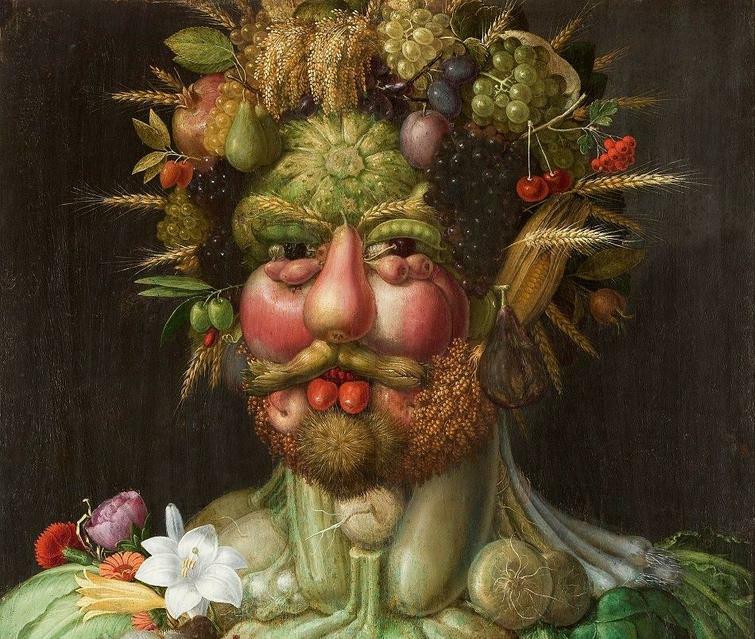 We have been exploring the famous Italian artist Giuseppe Arcimboldo who paints portraits from fruit, vegetables and flowers. 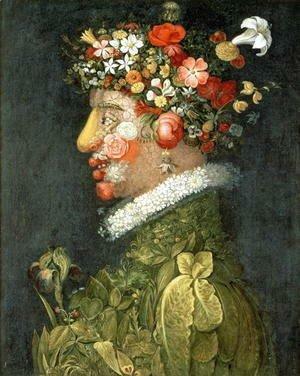 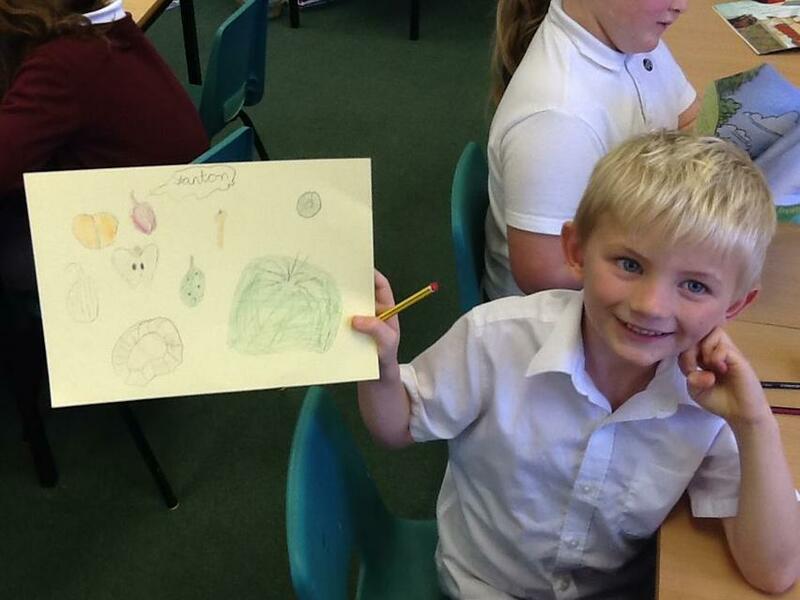 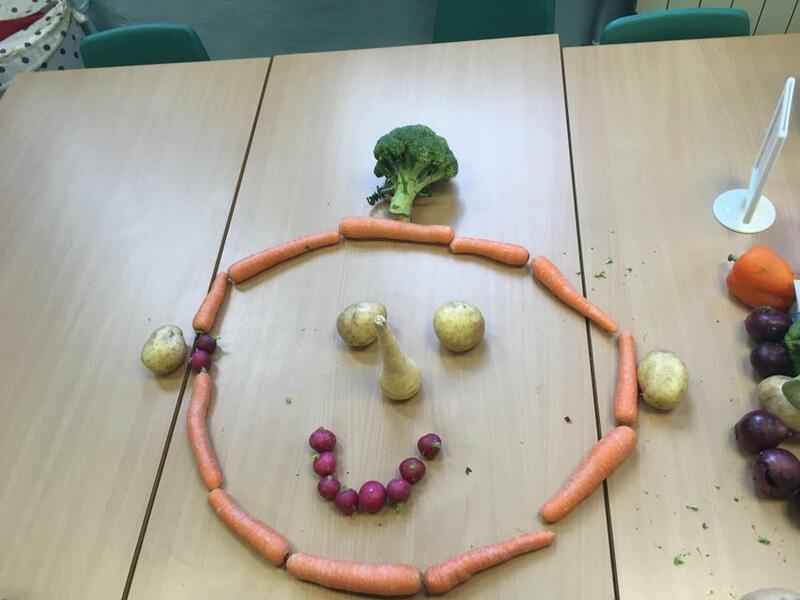 Jupiter Class created portraits inspires by Giuseppe Arcimboldo. 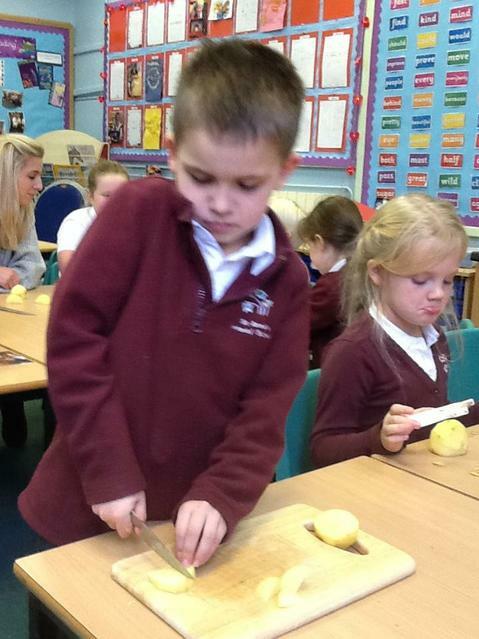 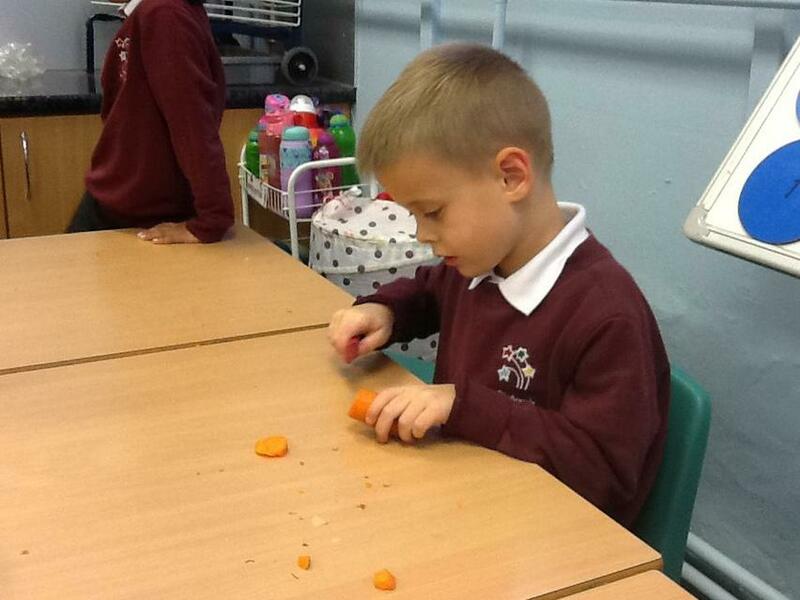 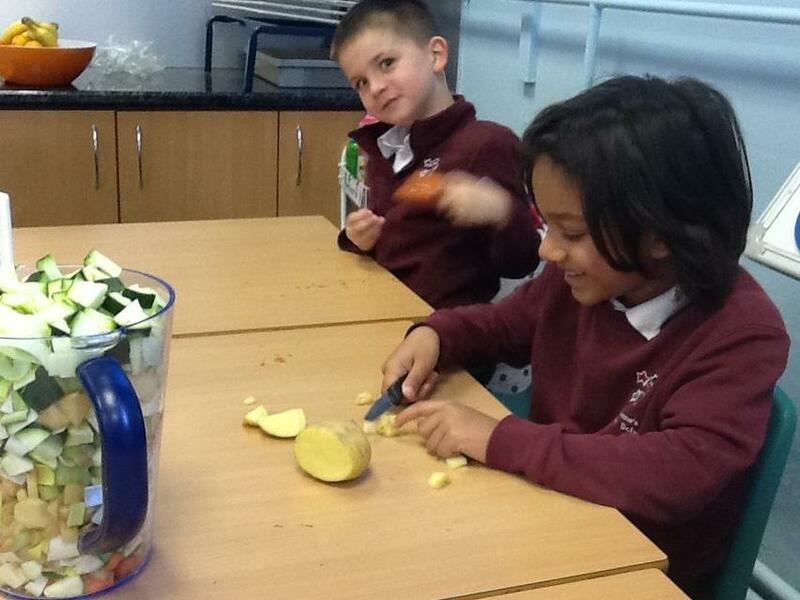 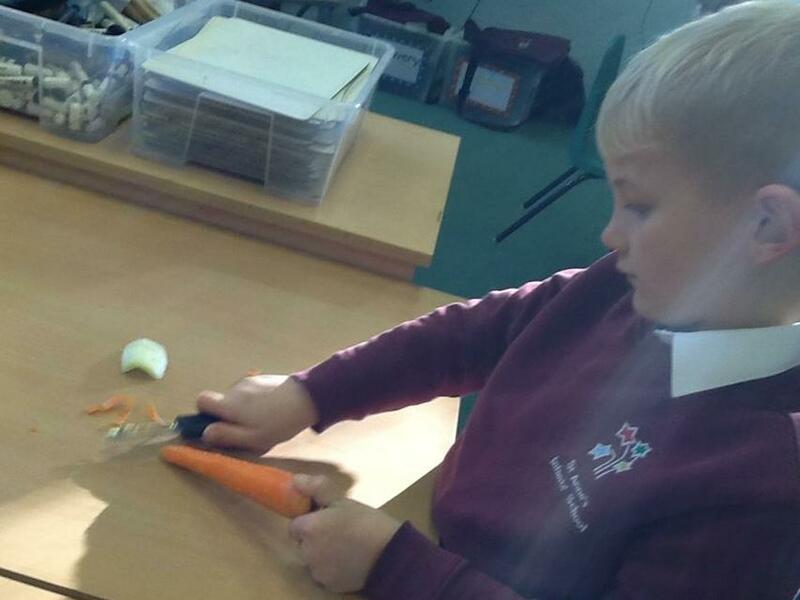 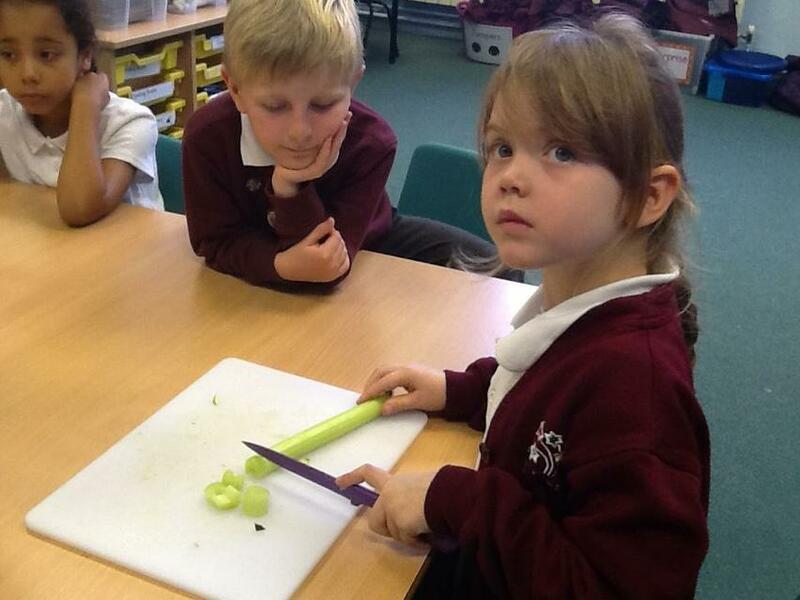 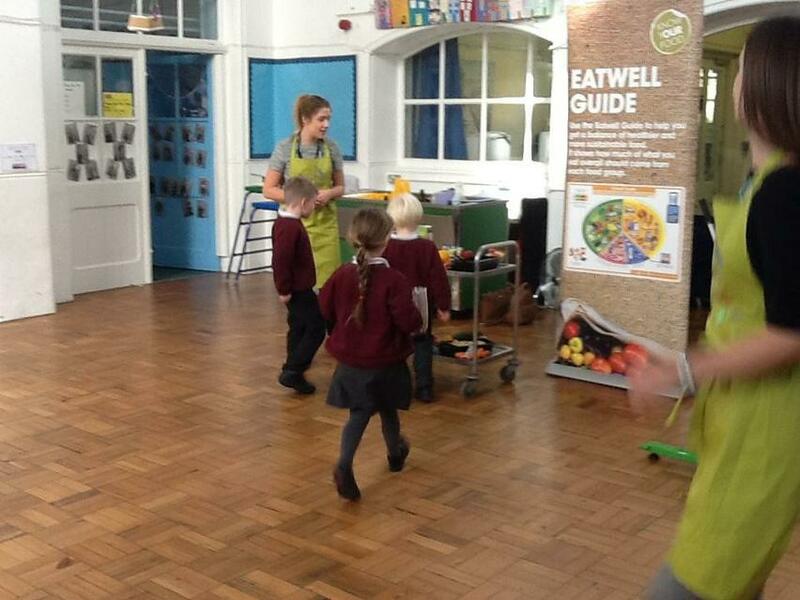 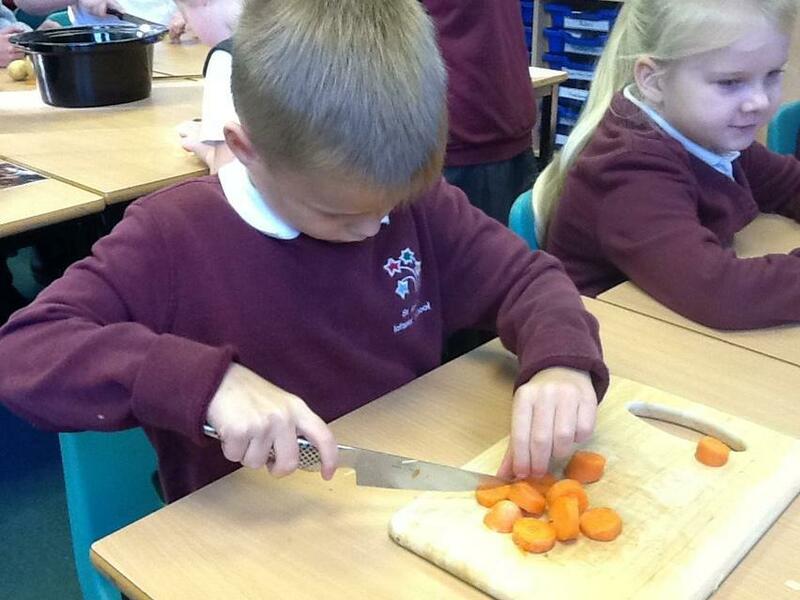 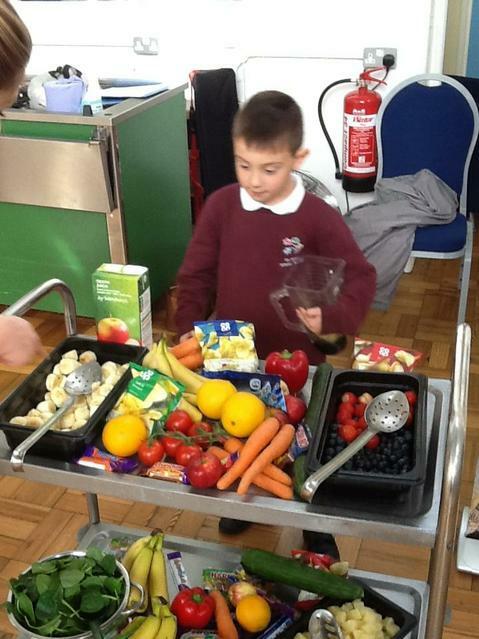 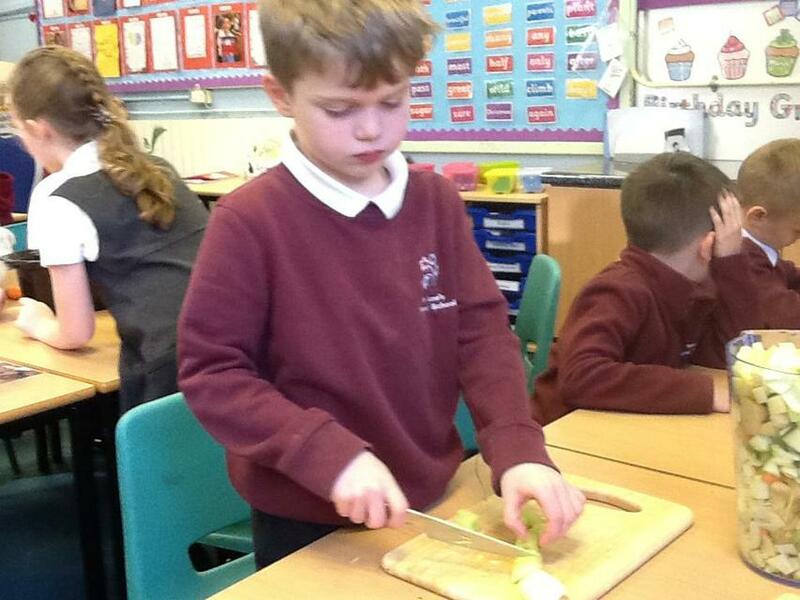 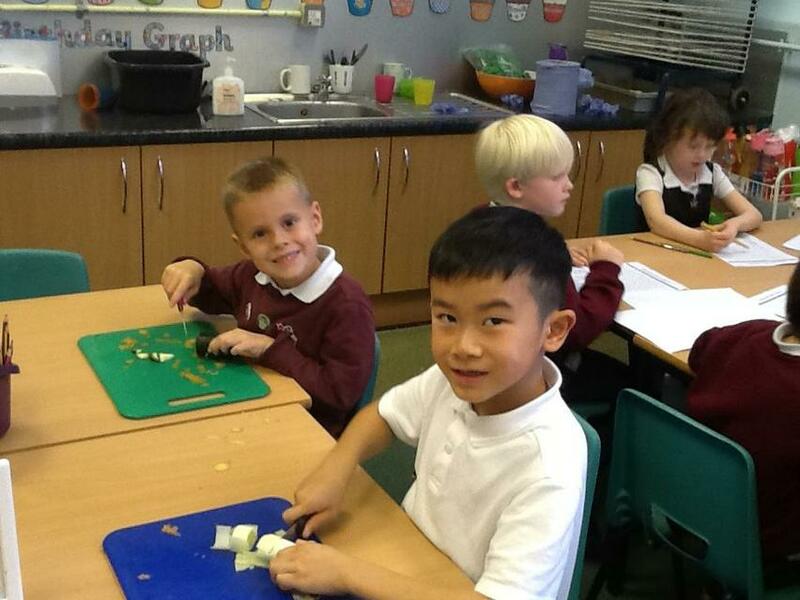 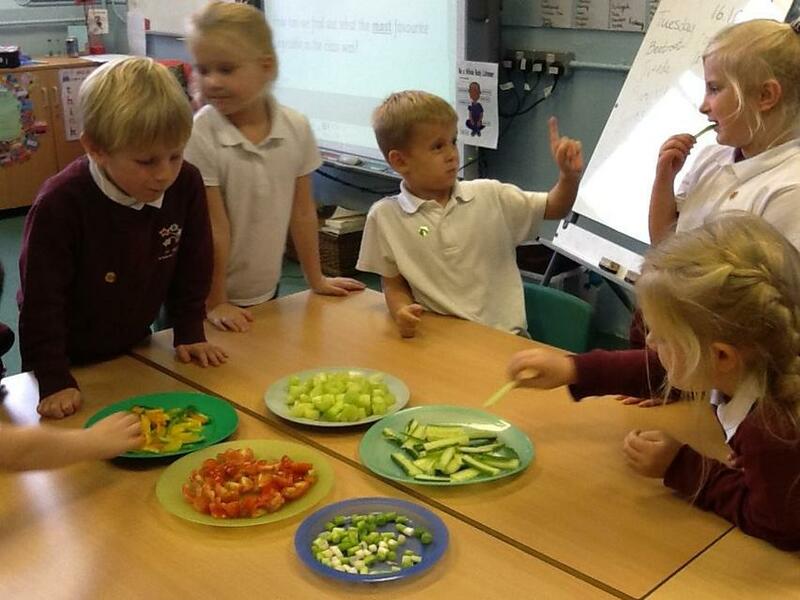 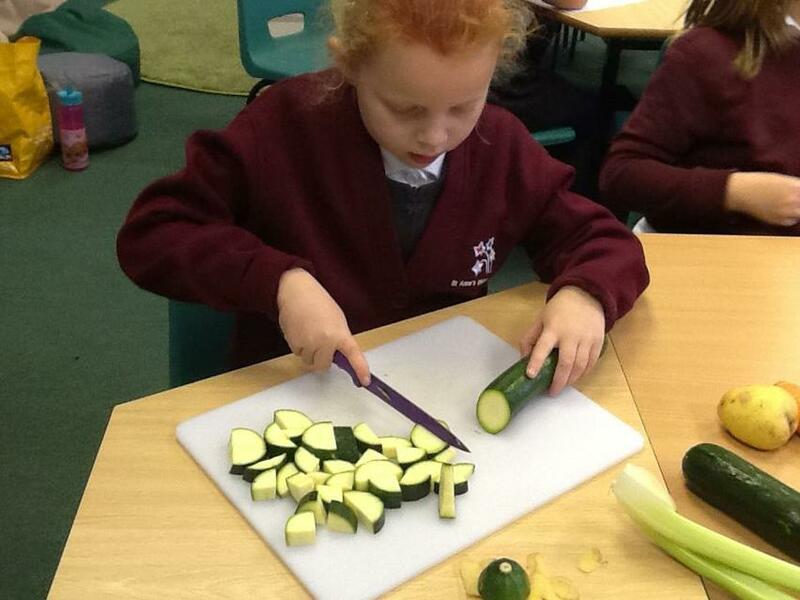 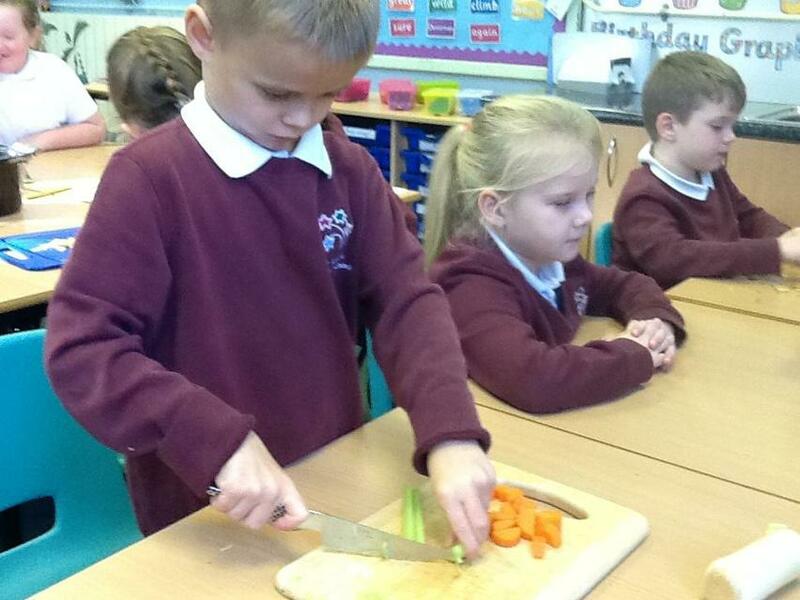 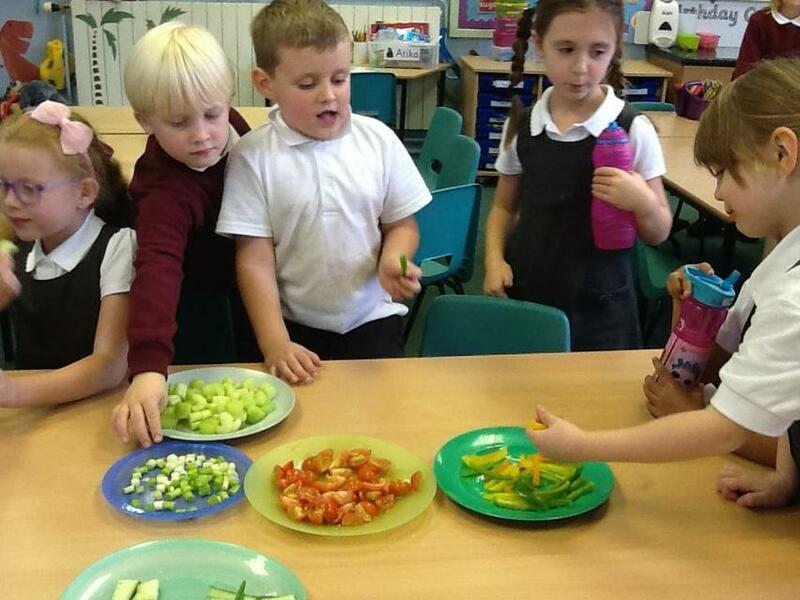 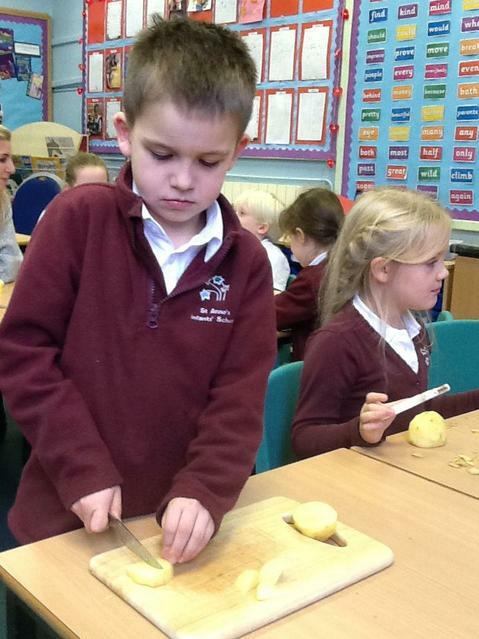 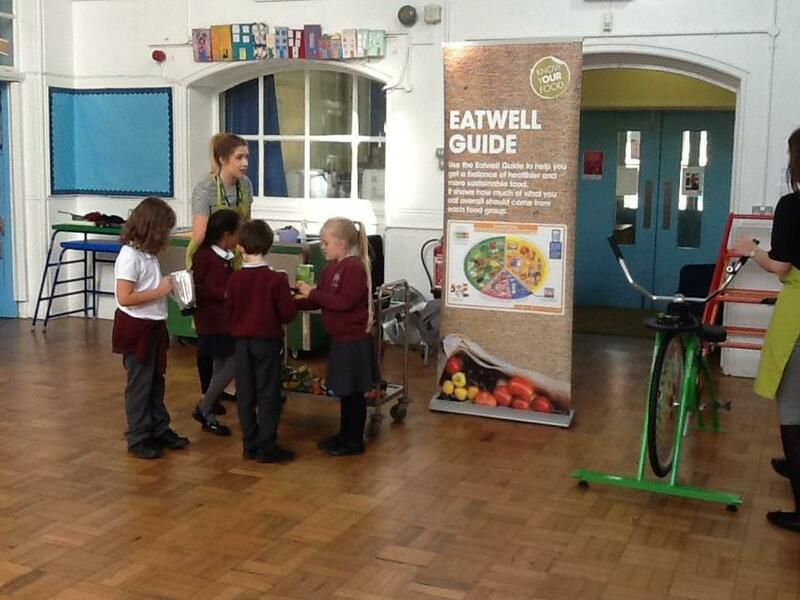 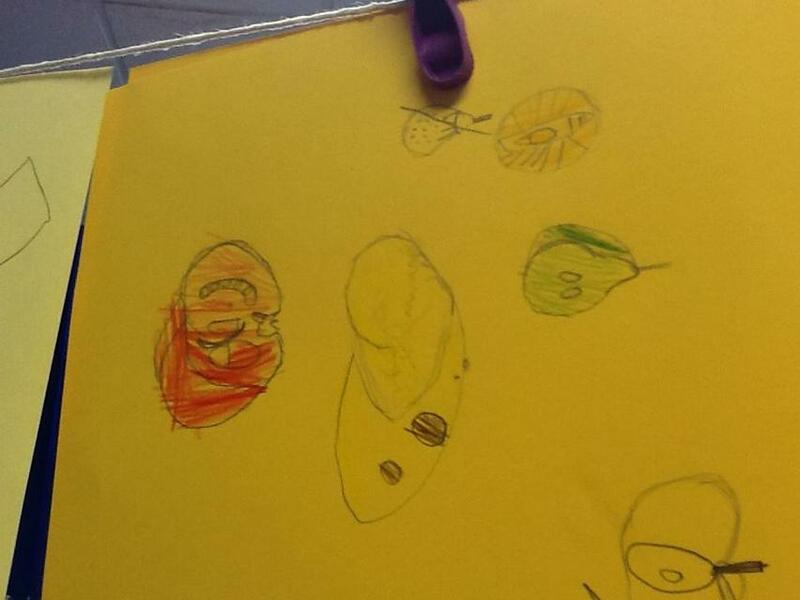 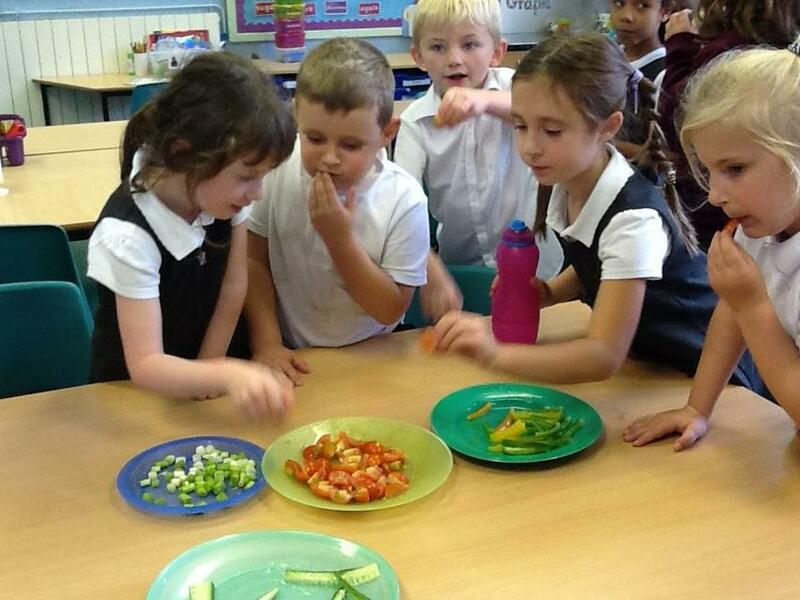 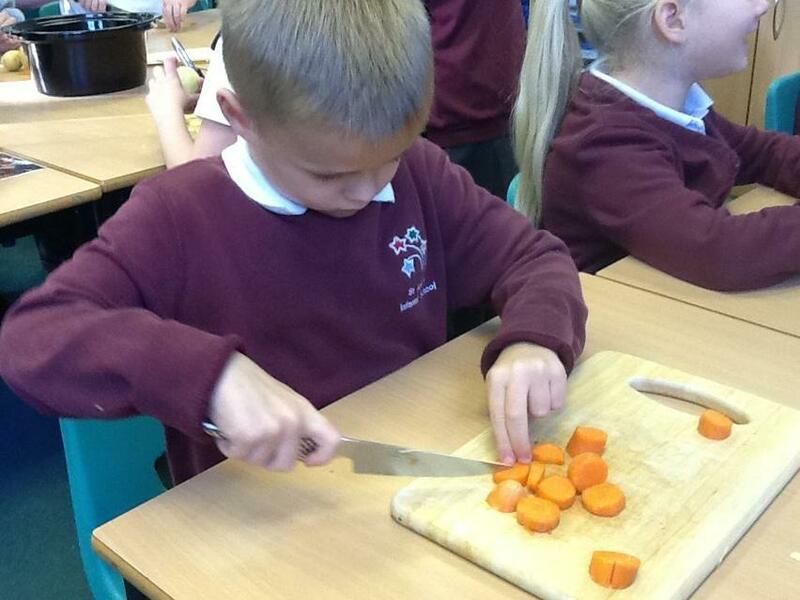 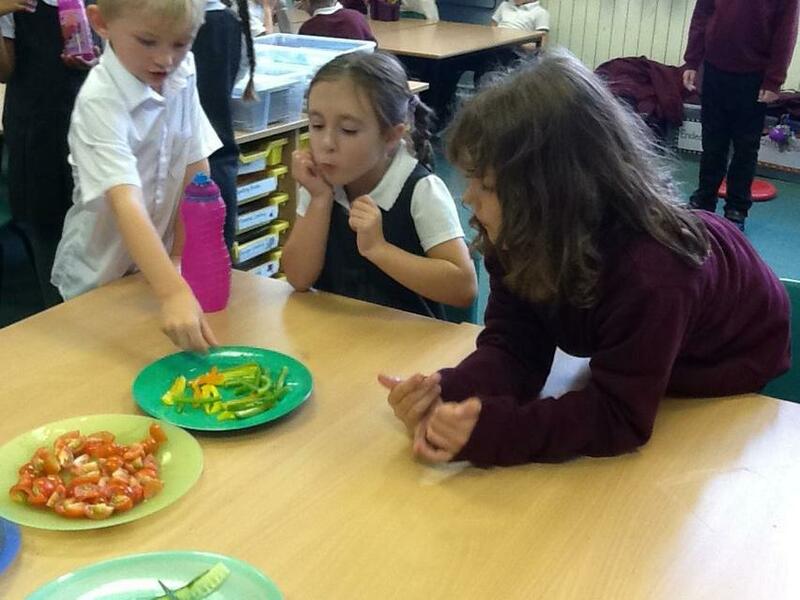 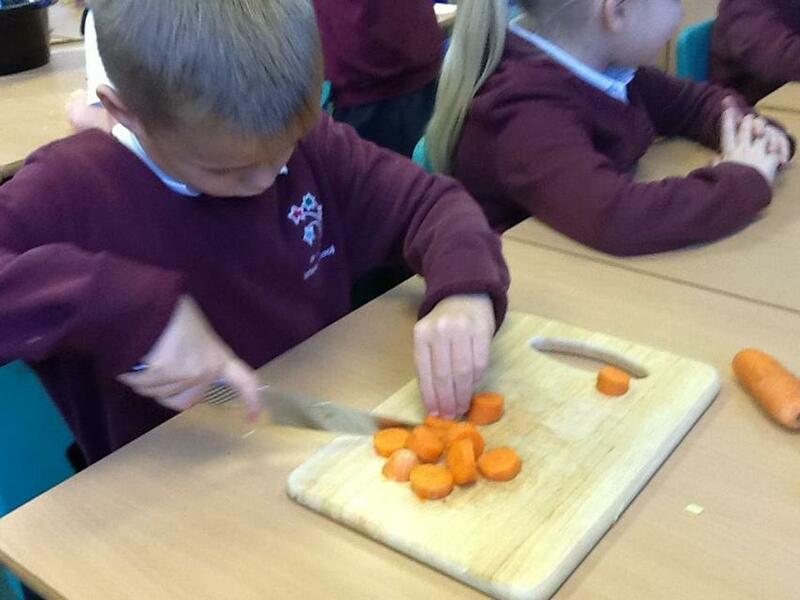 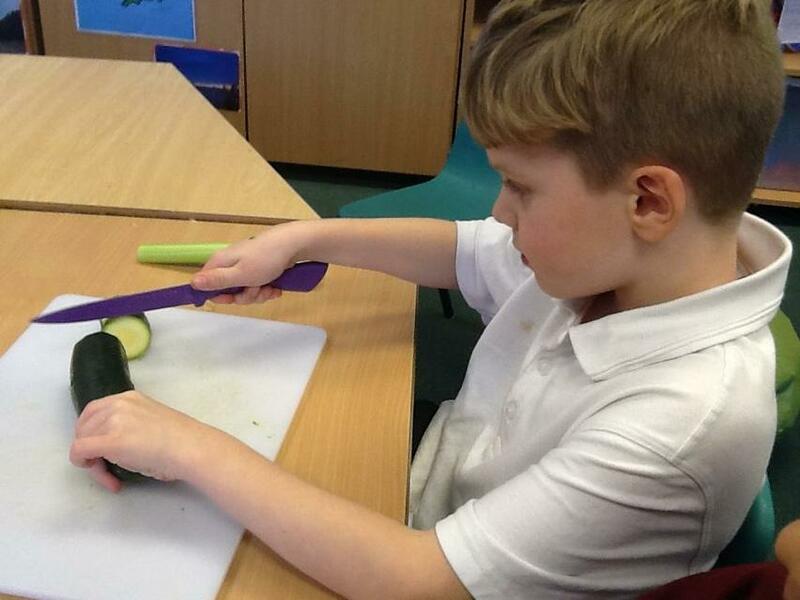 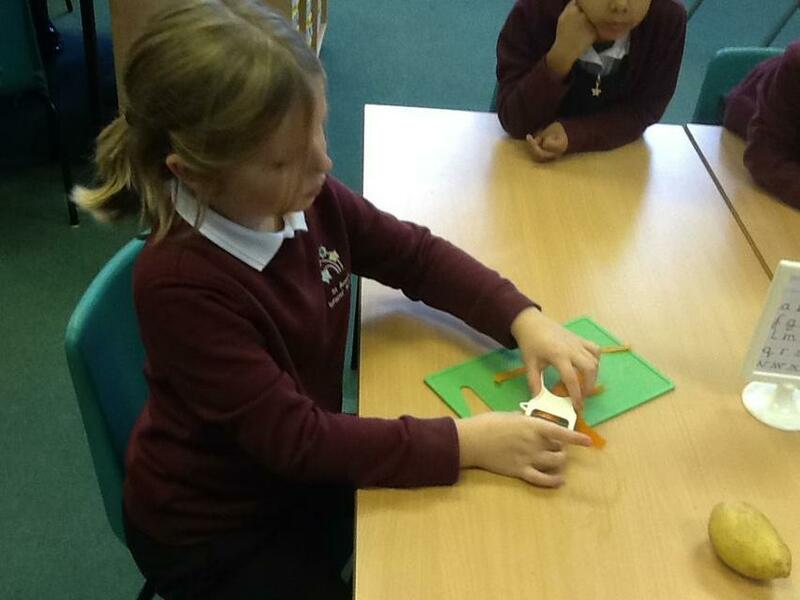 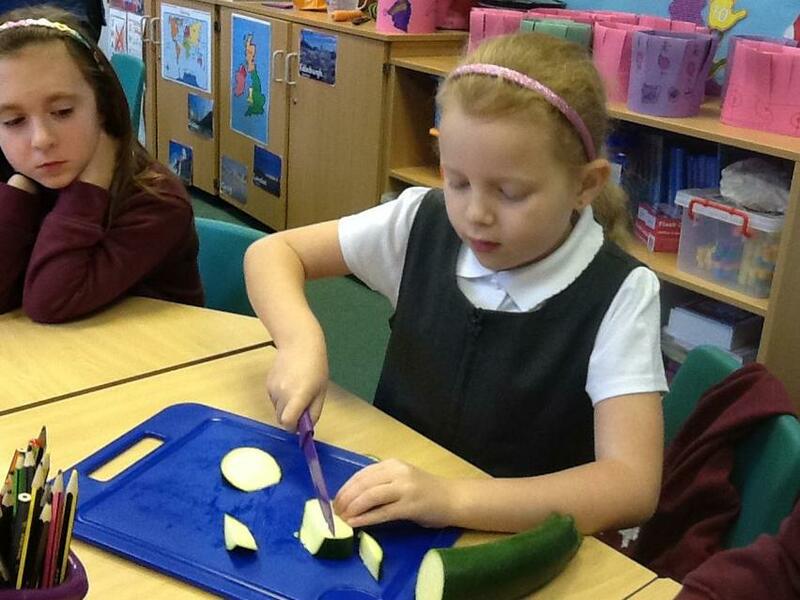 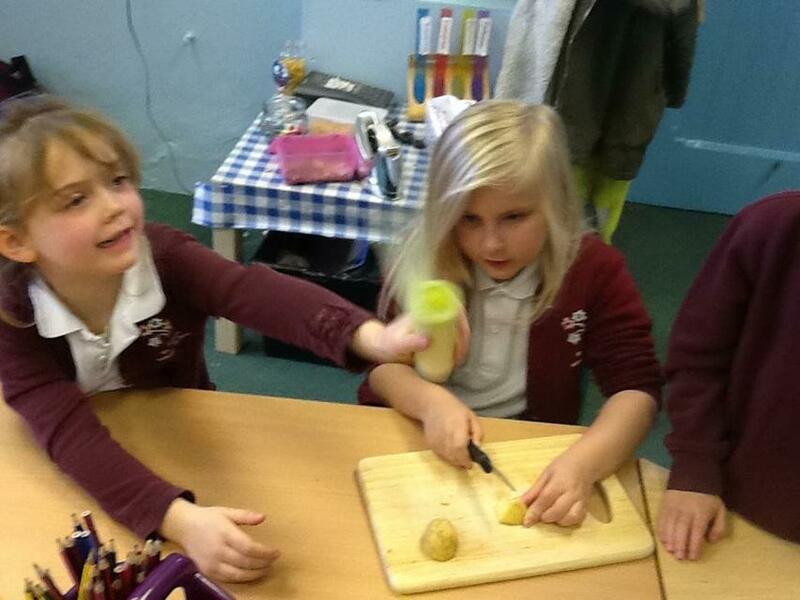 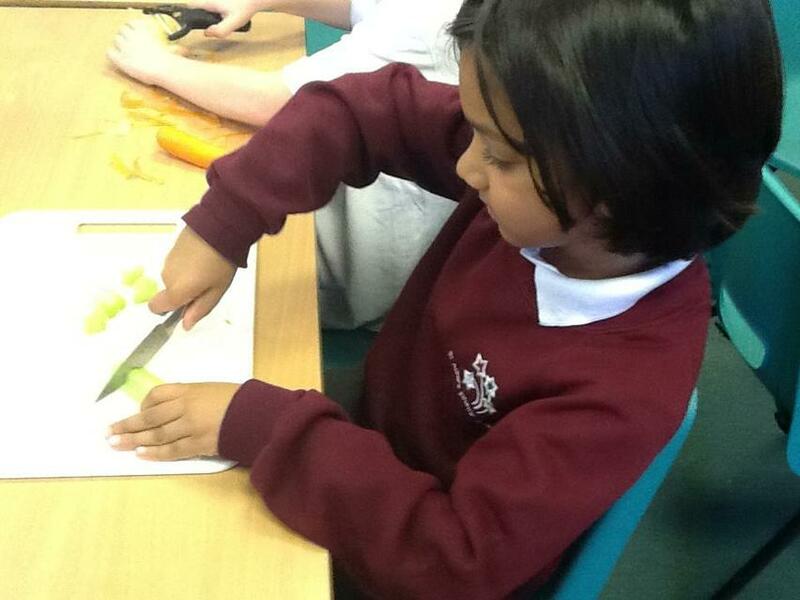 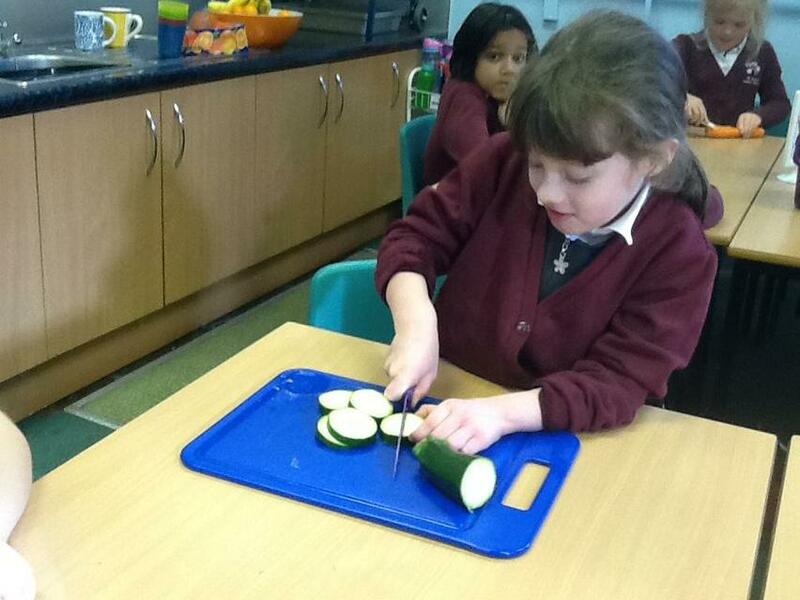 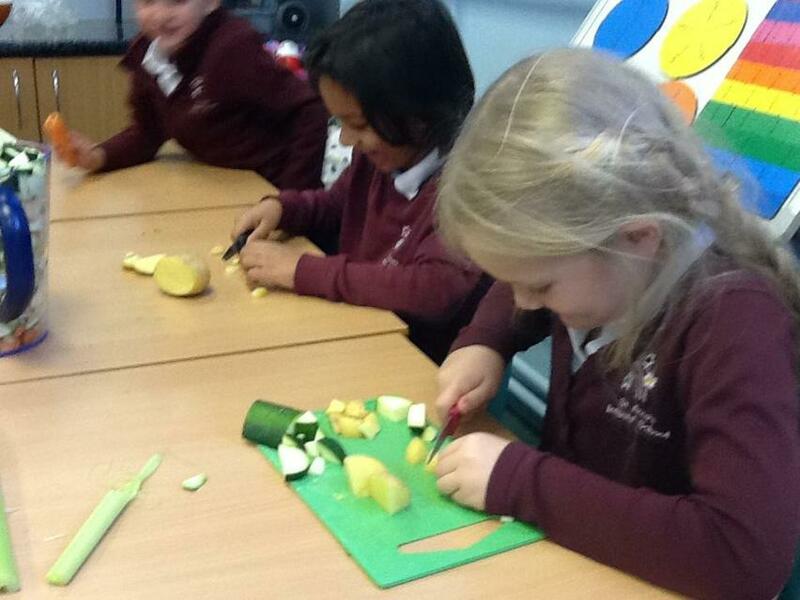 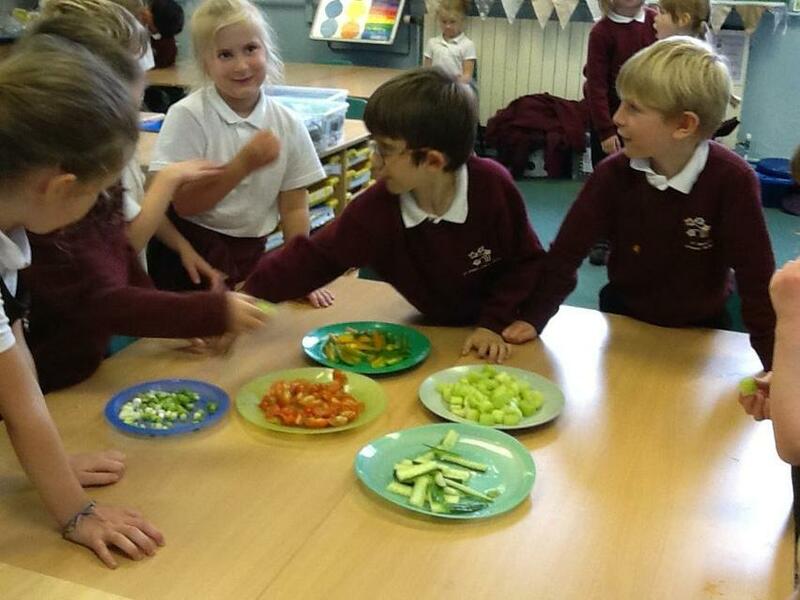 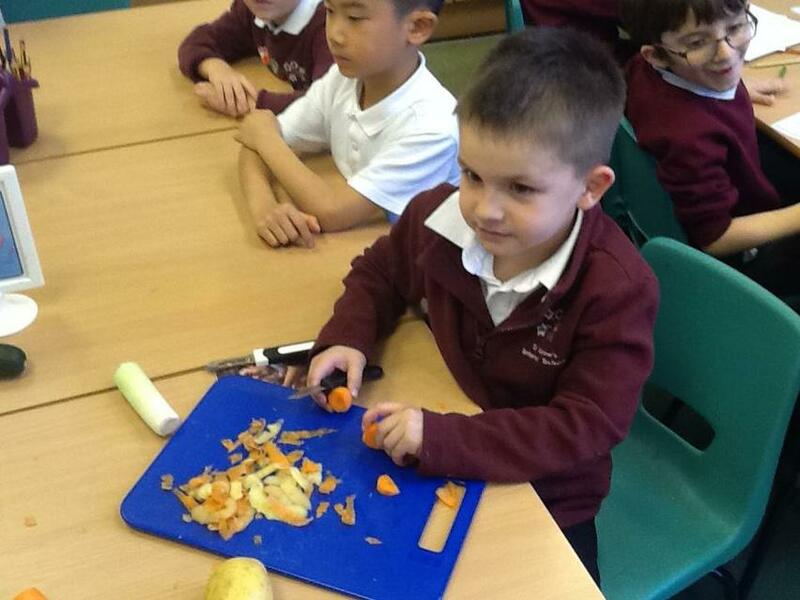 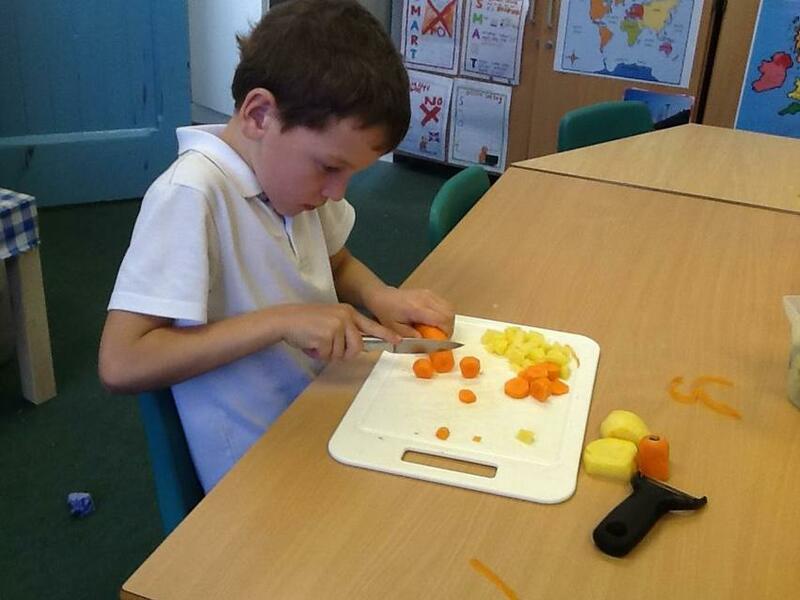 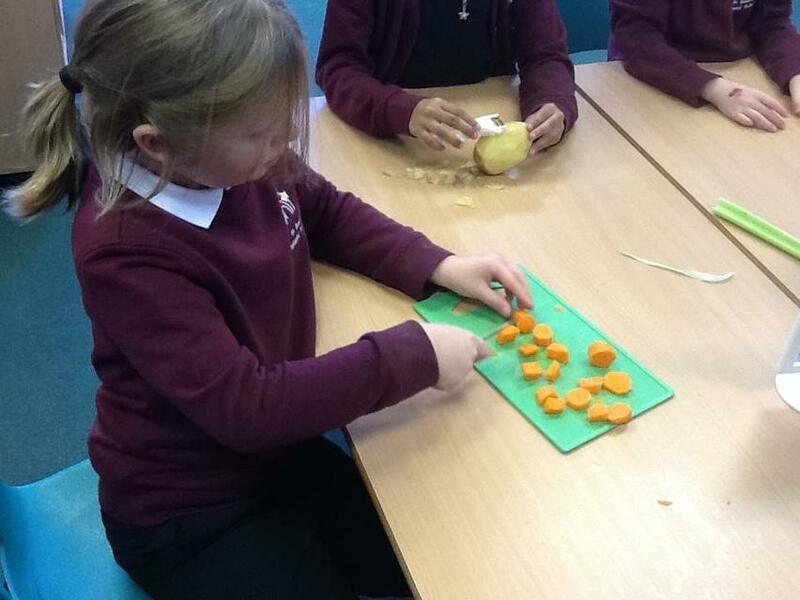 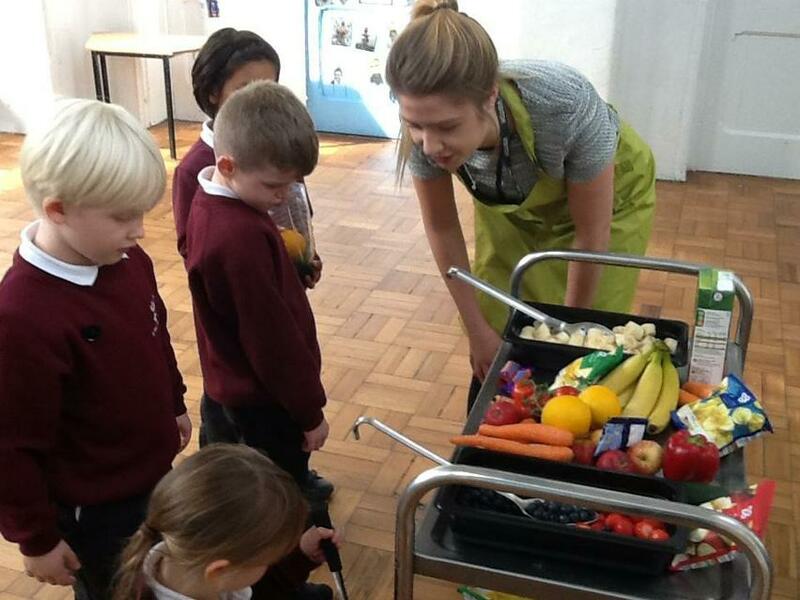 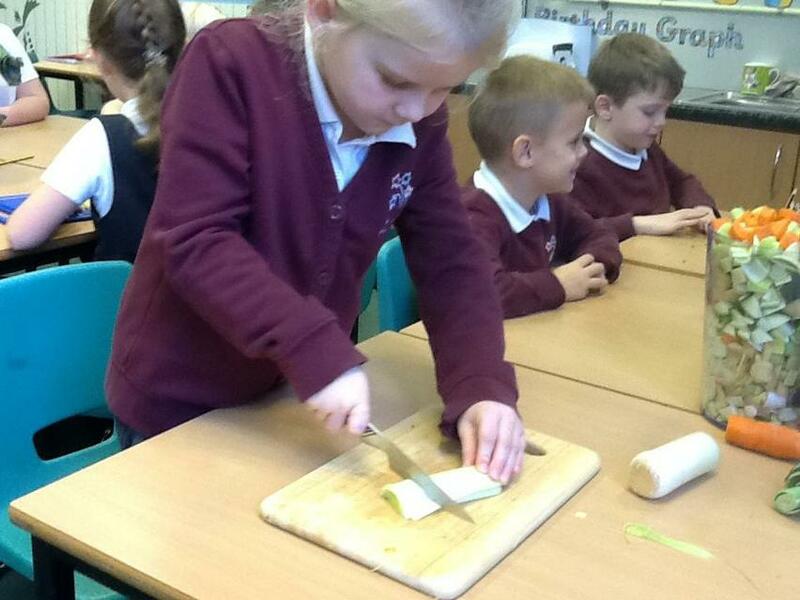 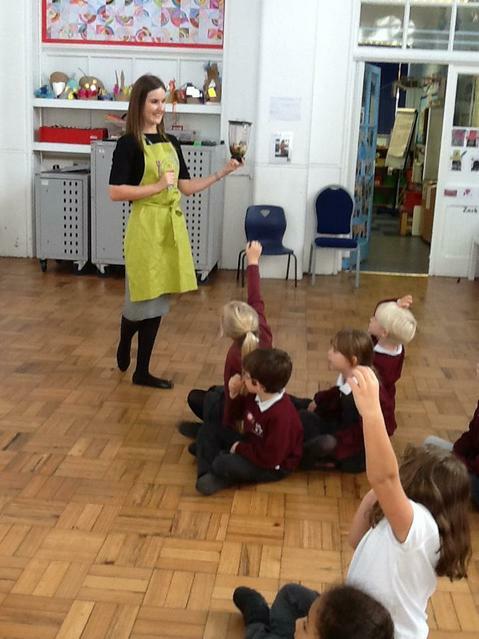 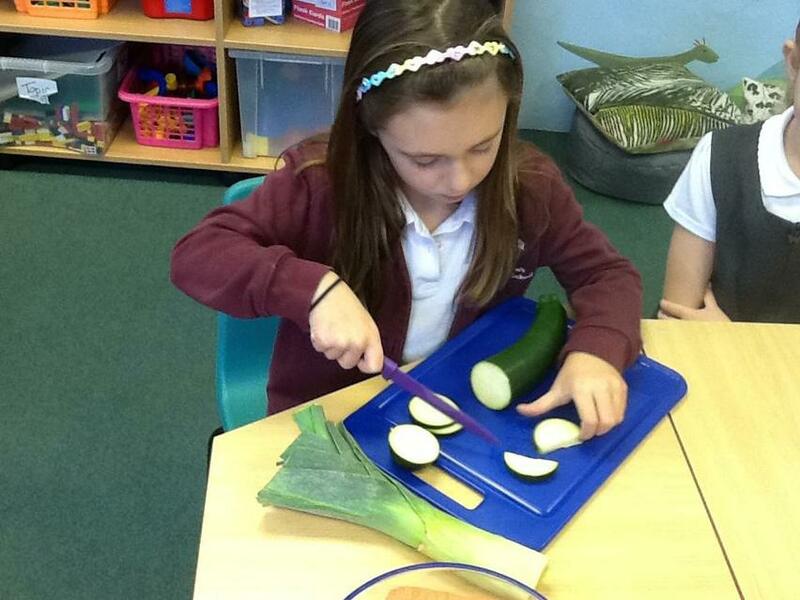 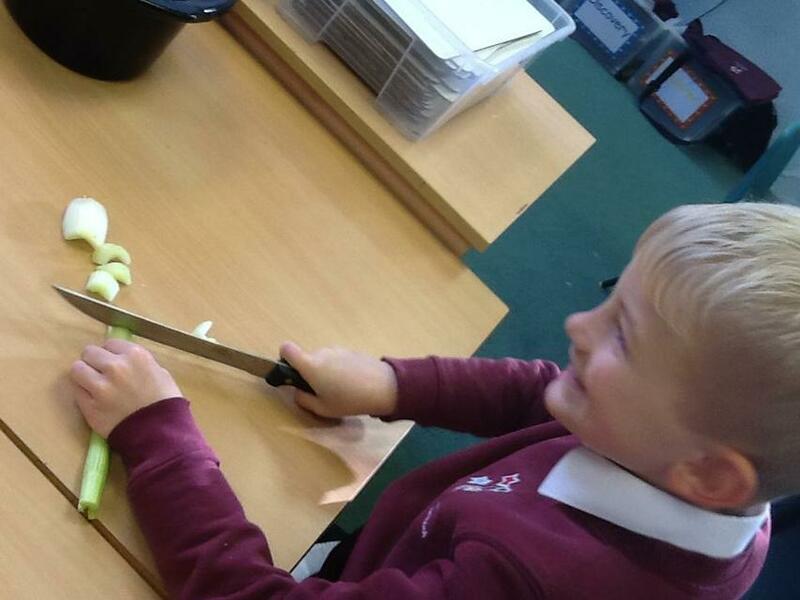 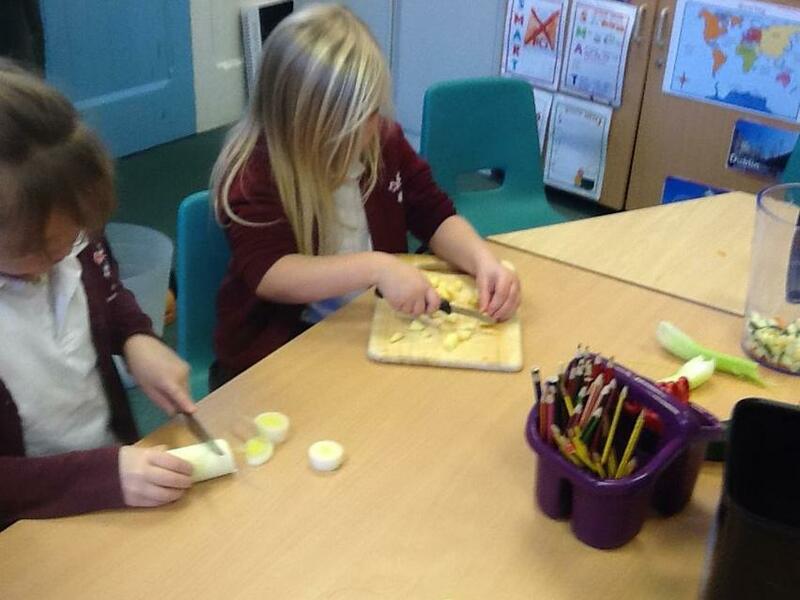 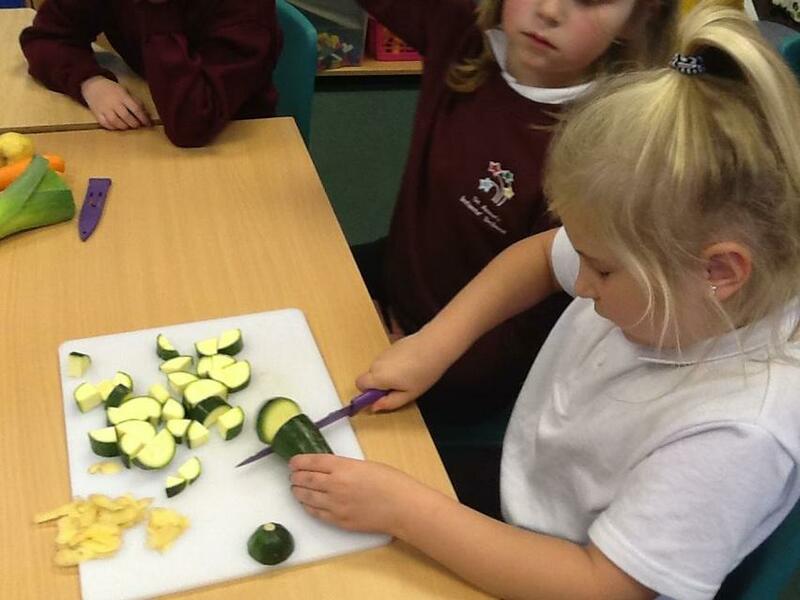 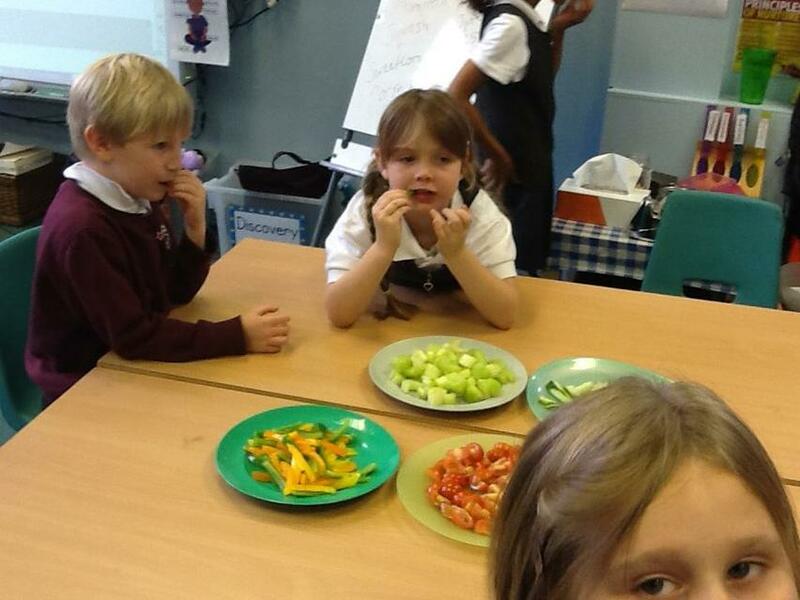 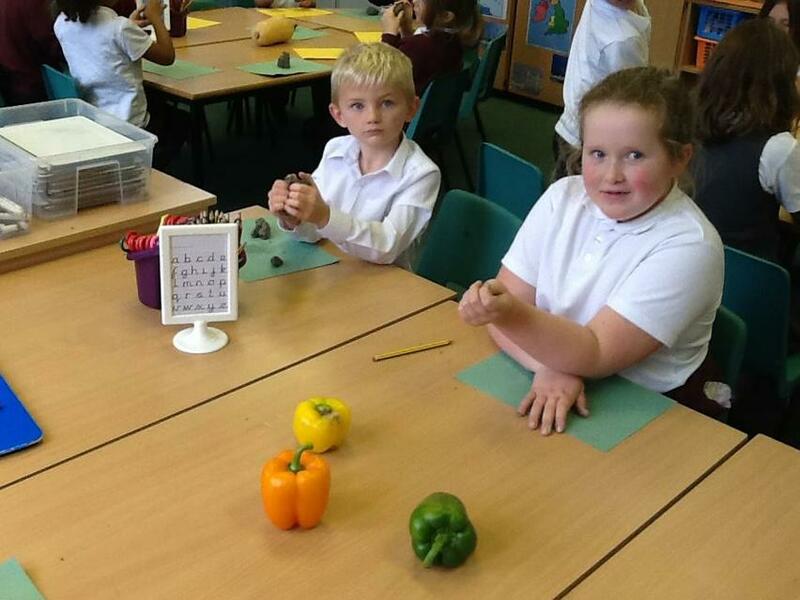 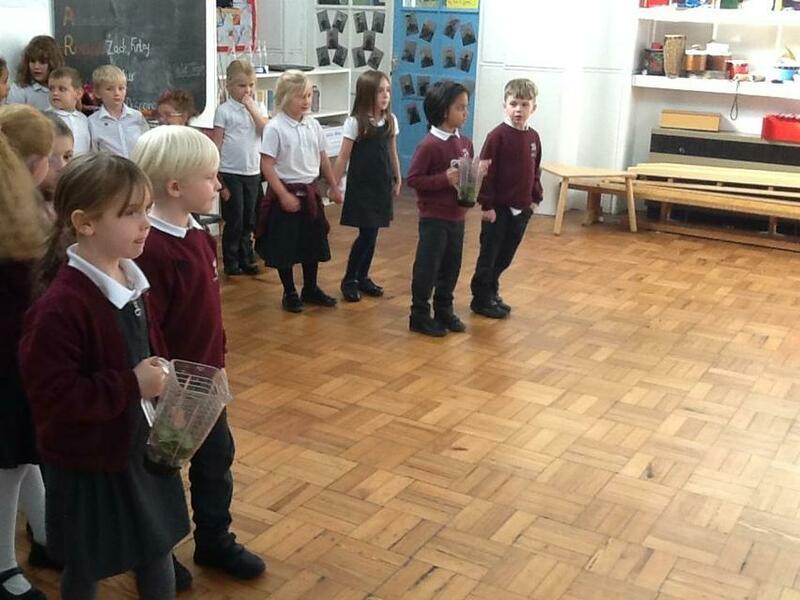 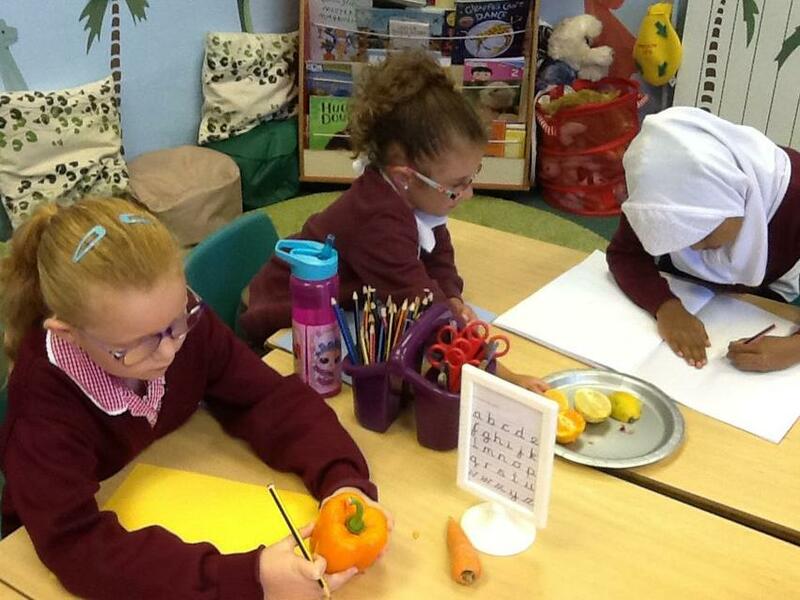 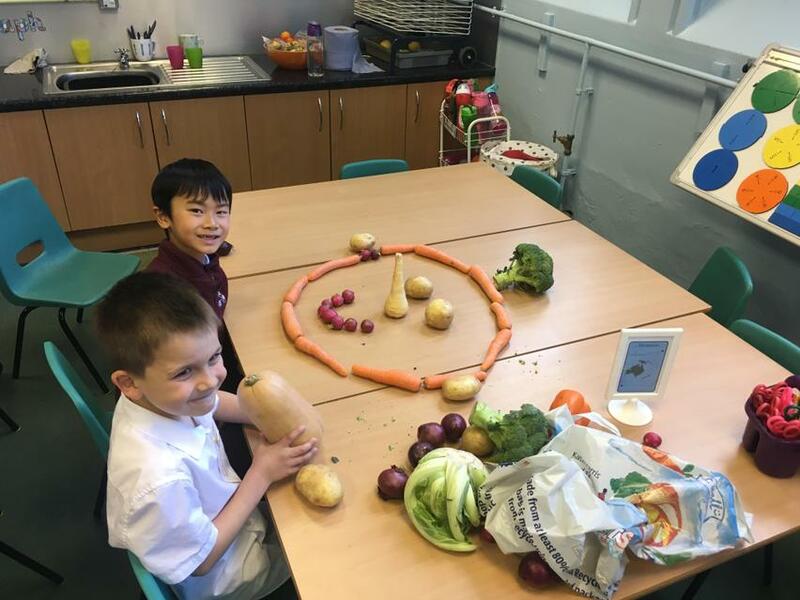 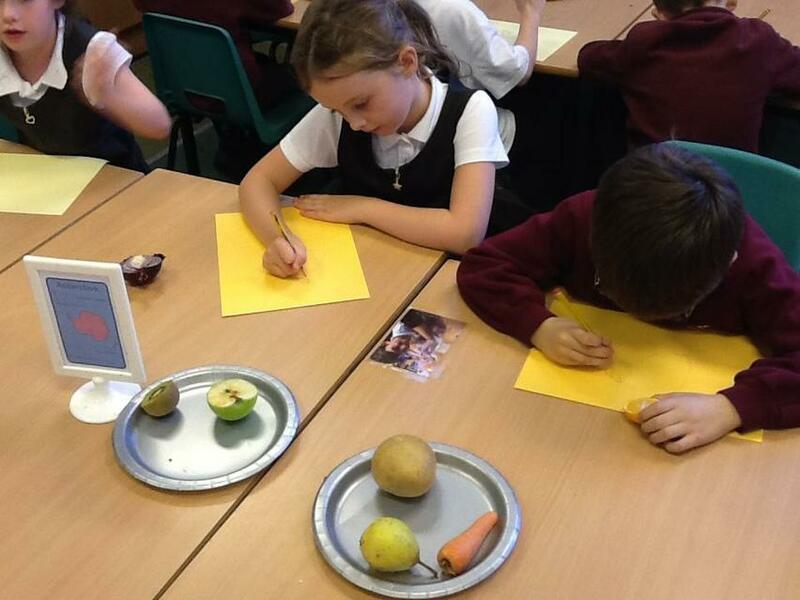 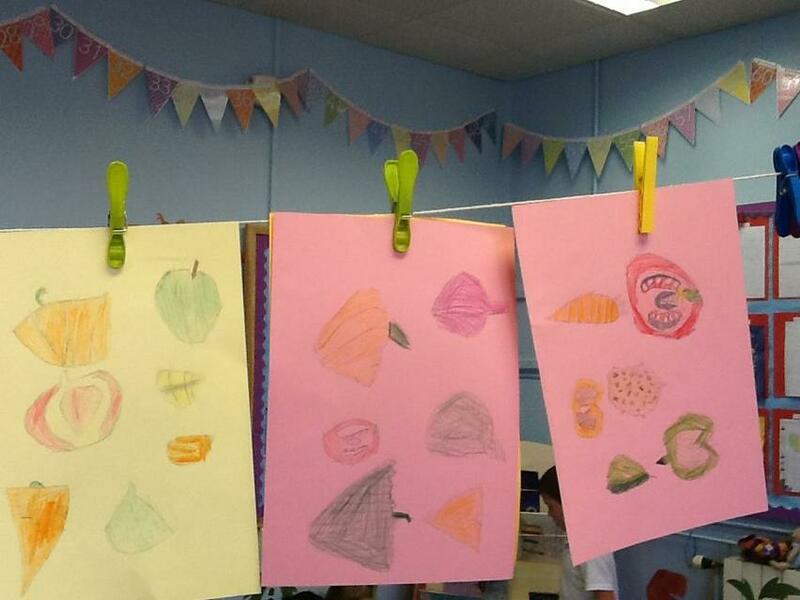 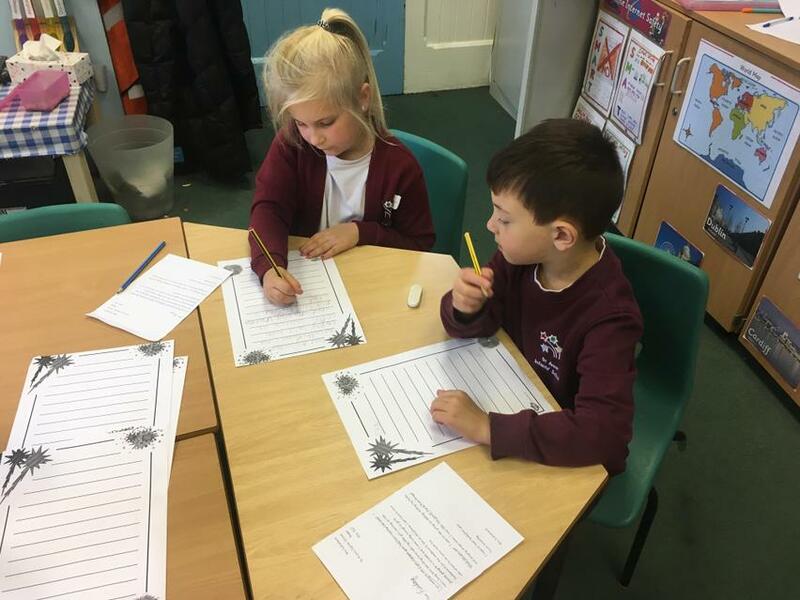 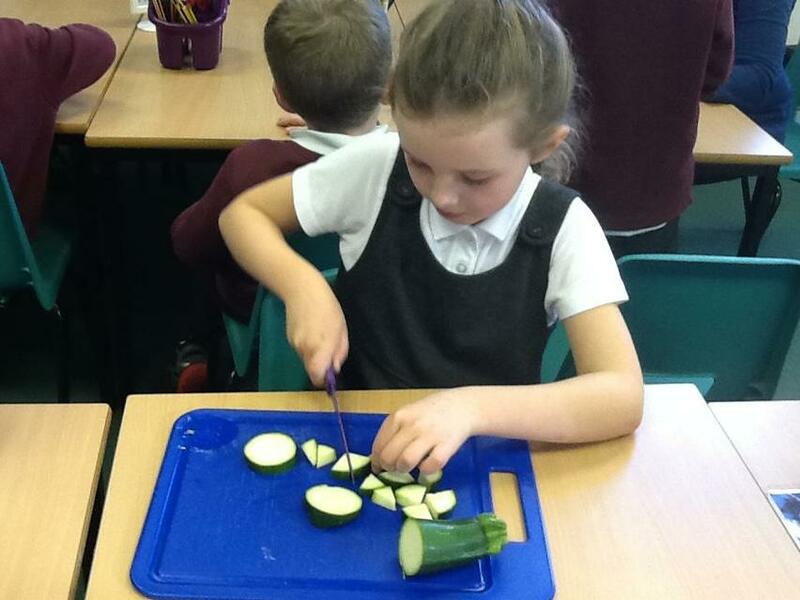 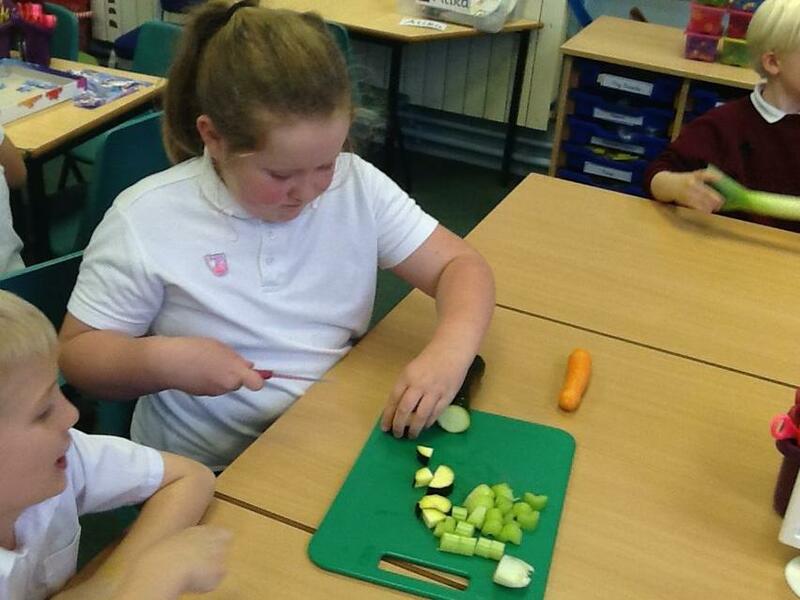 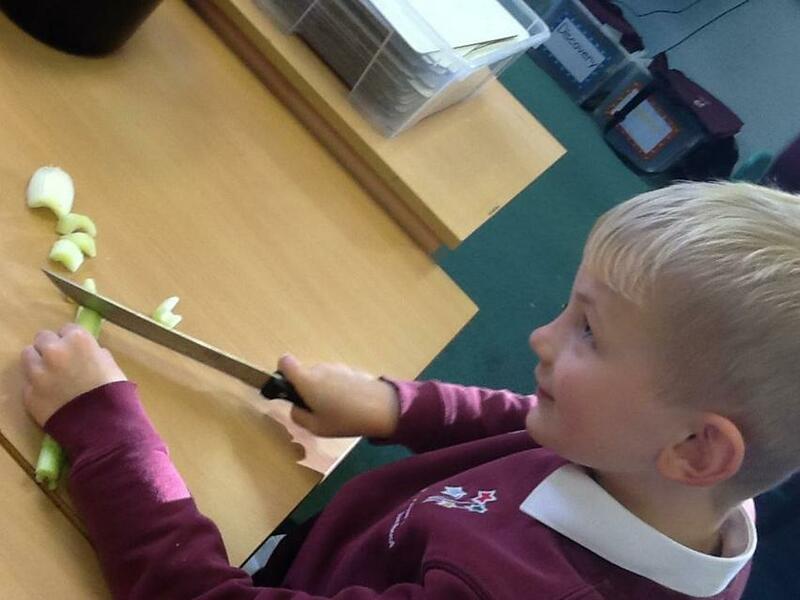 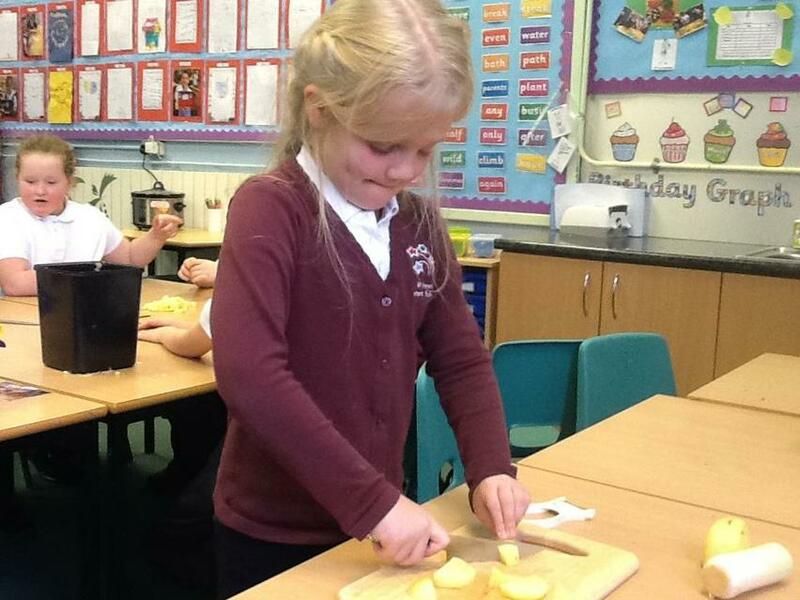 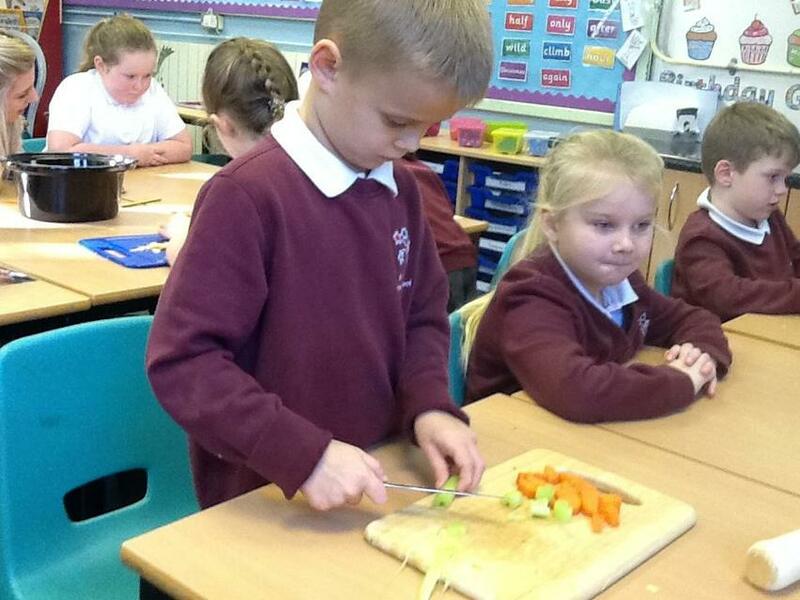 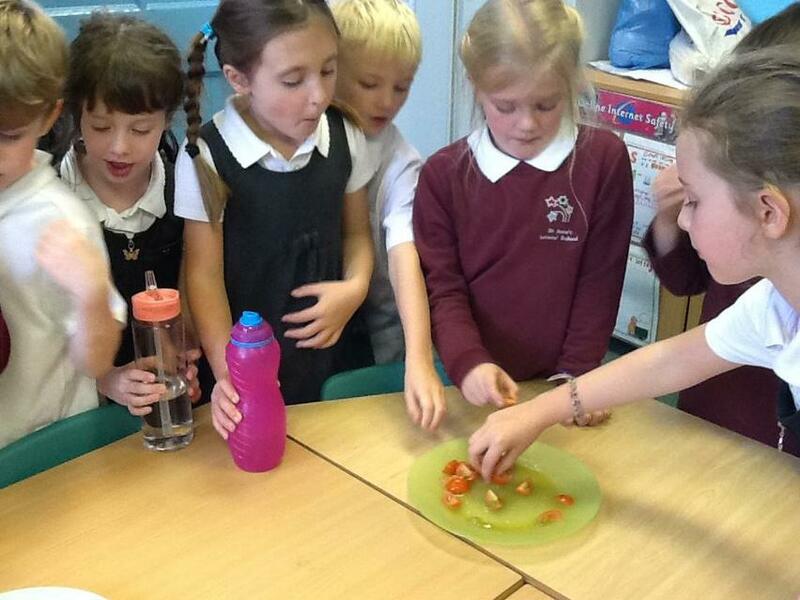 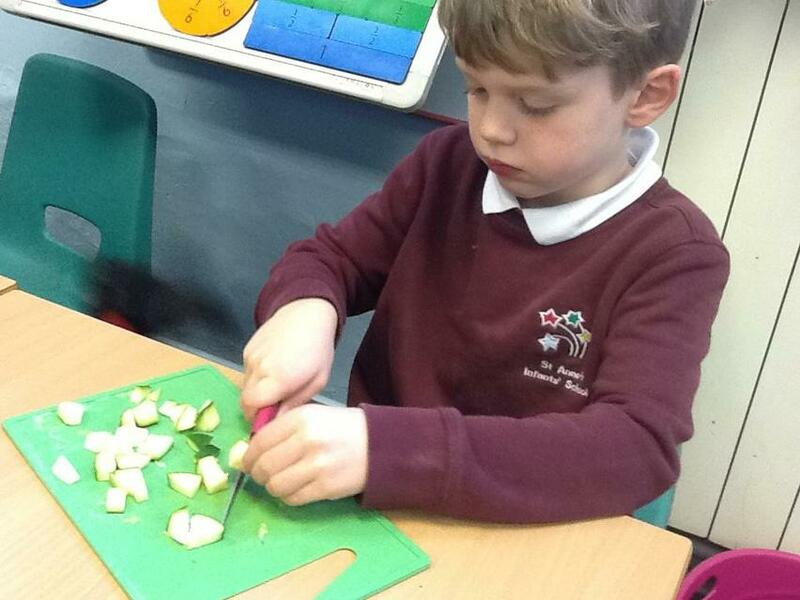 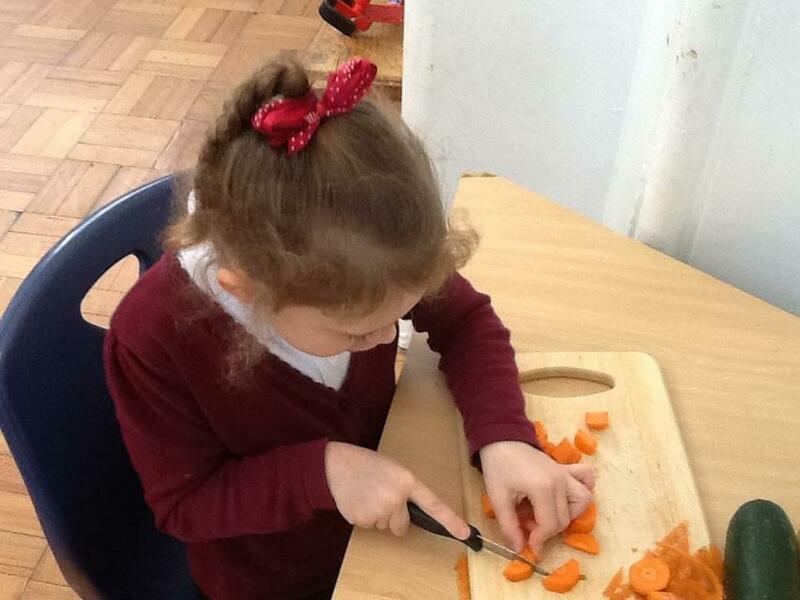 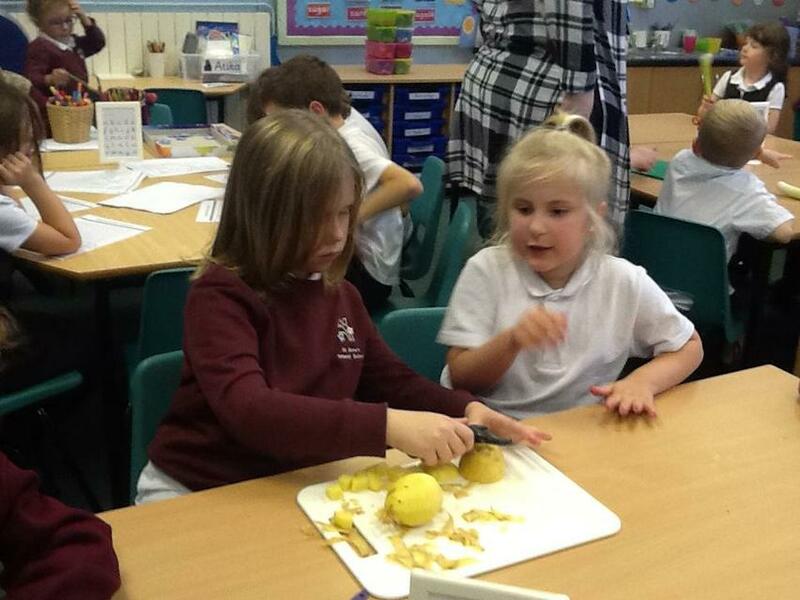 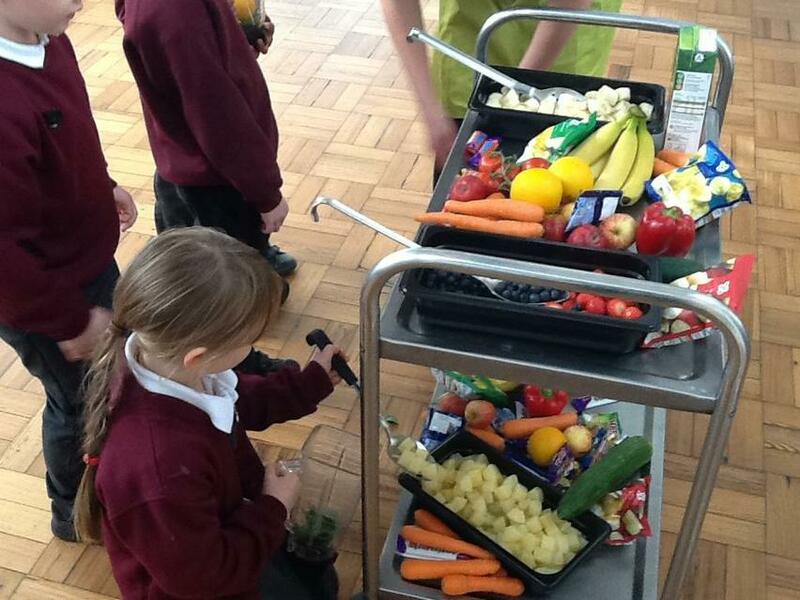 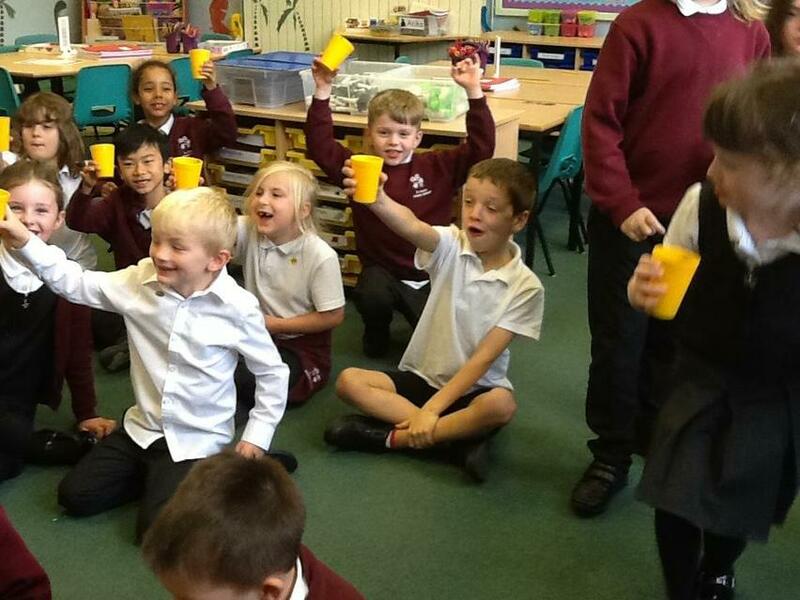 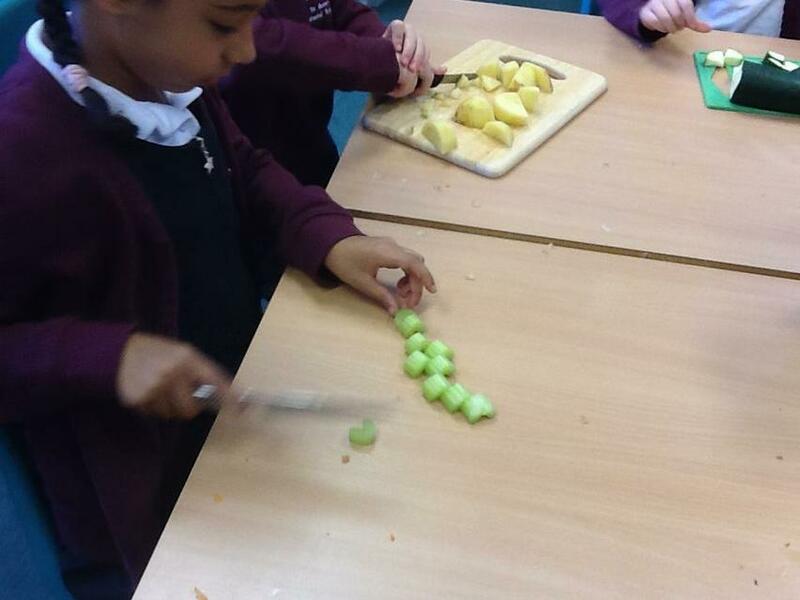 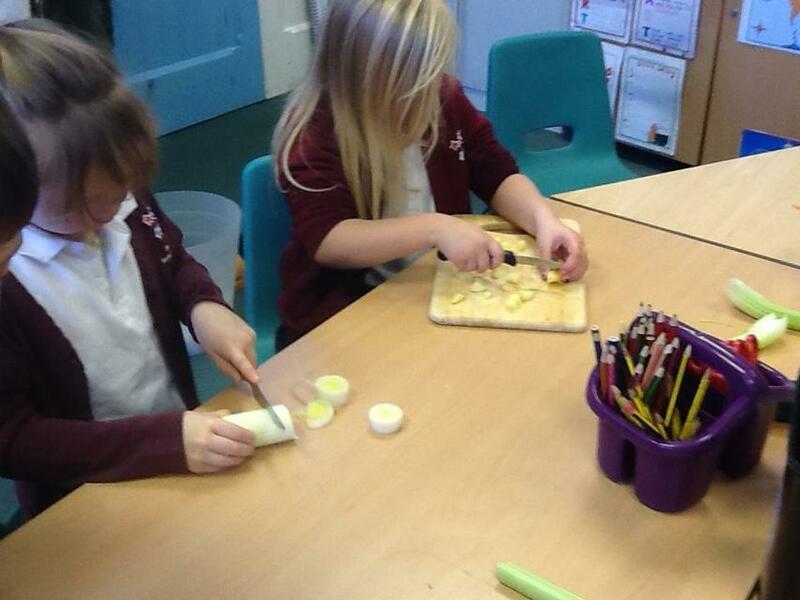 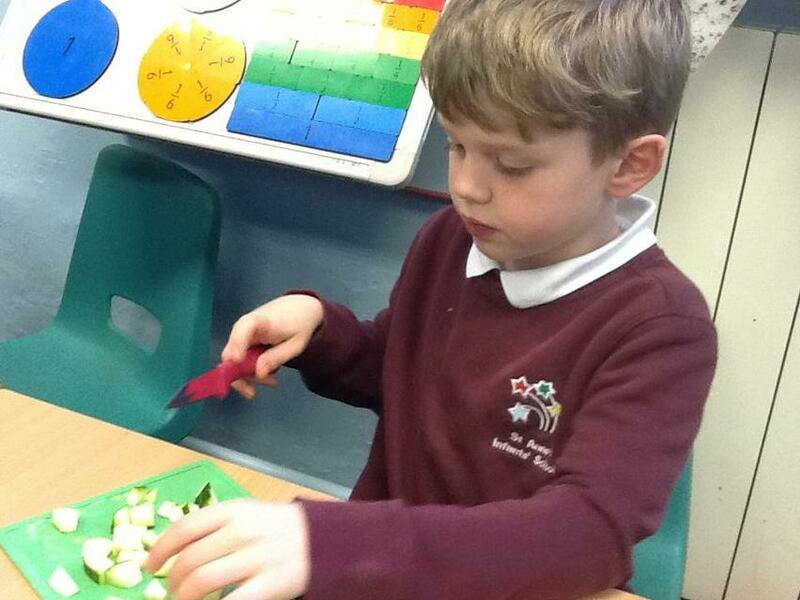 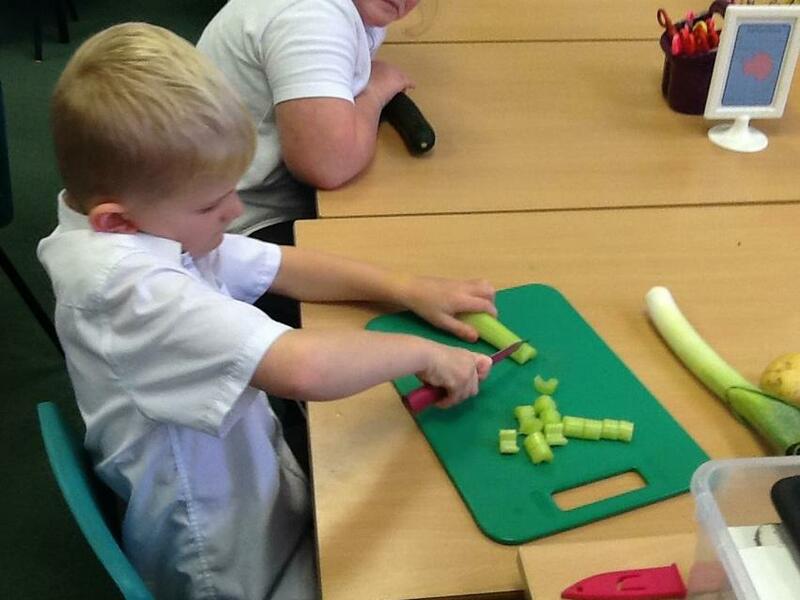 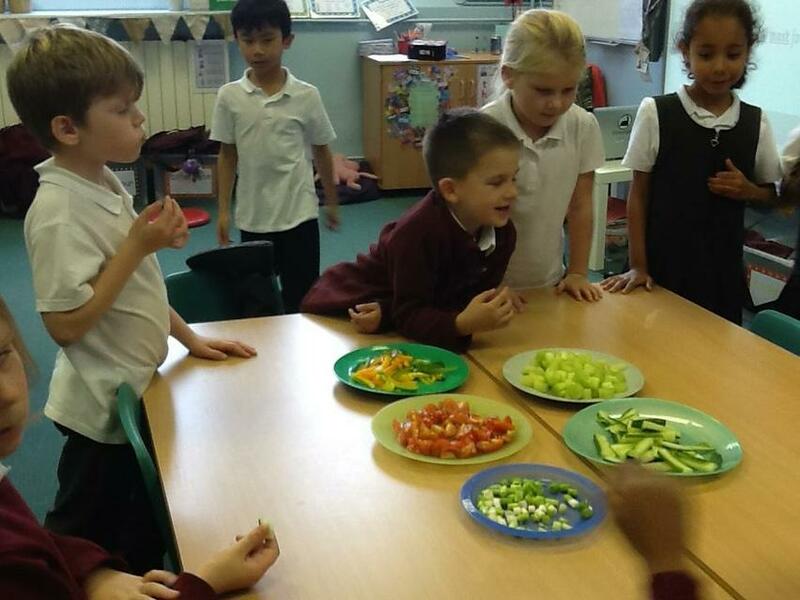 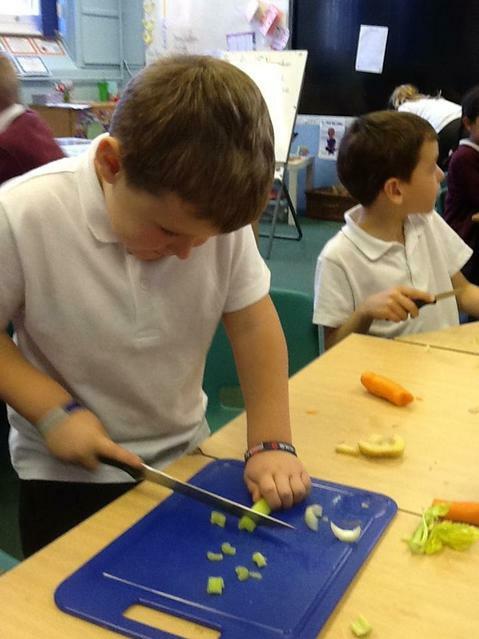 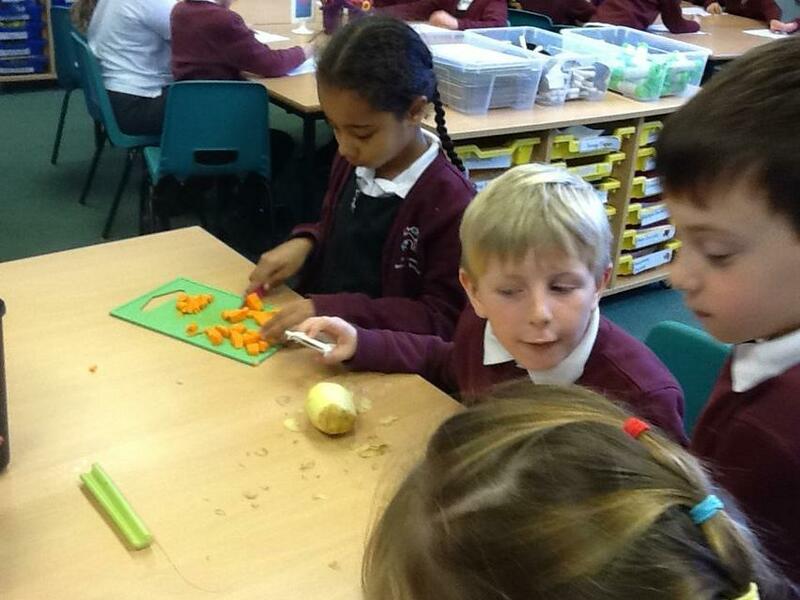 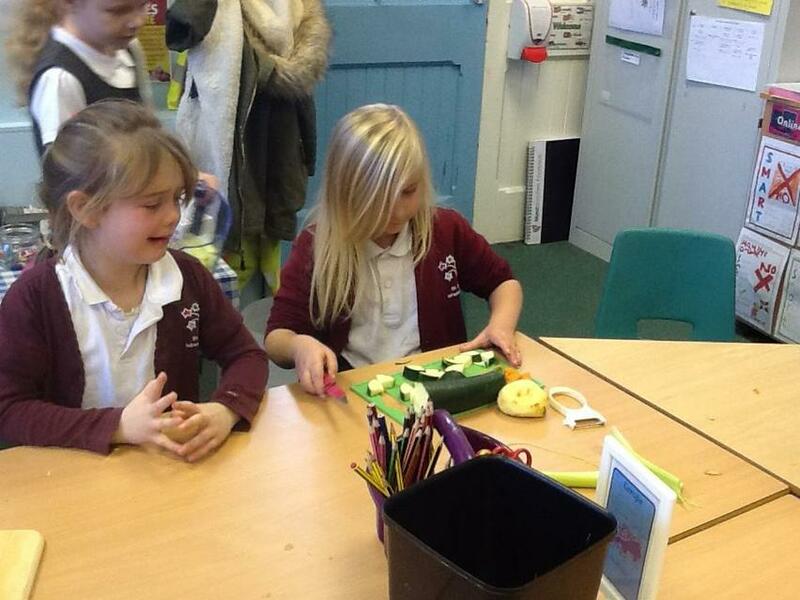 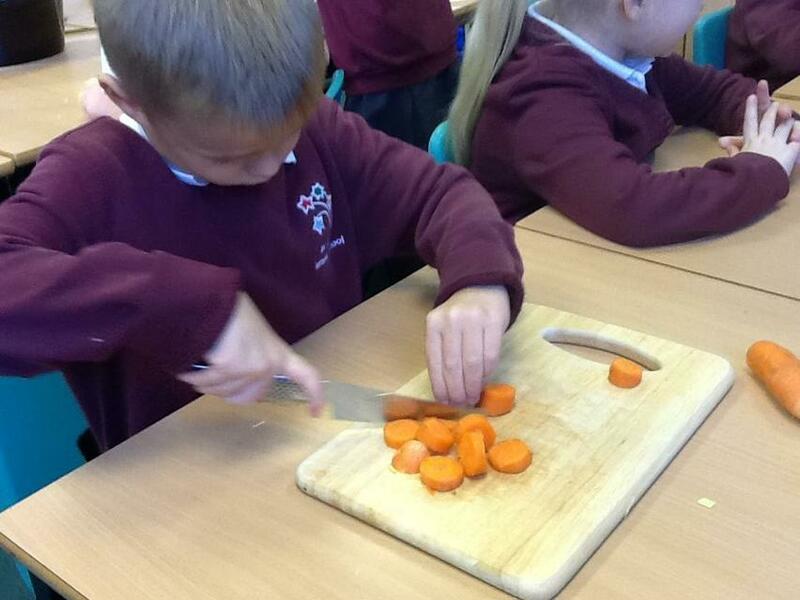 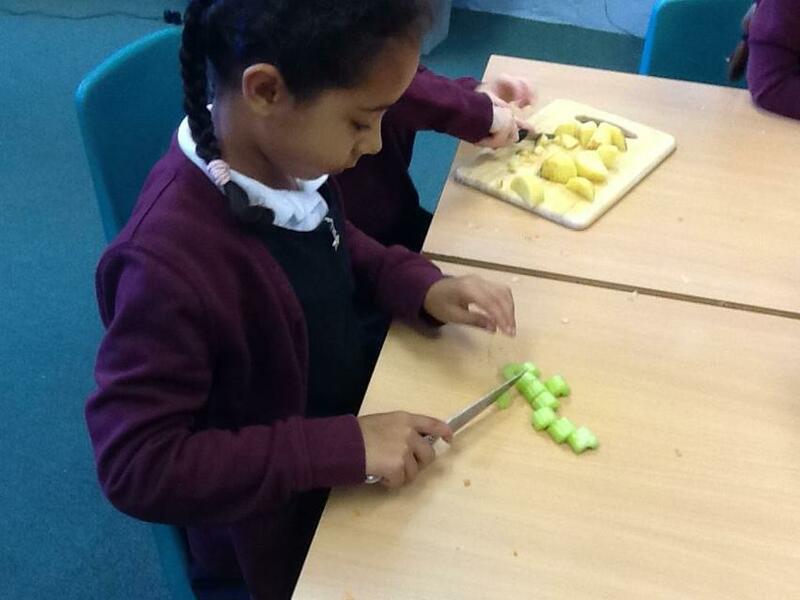 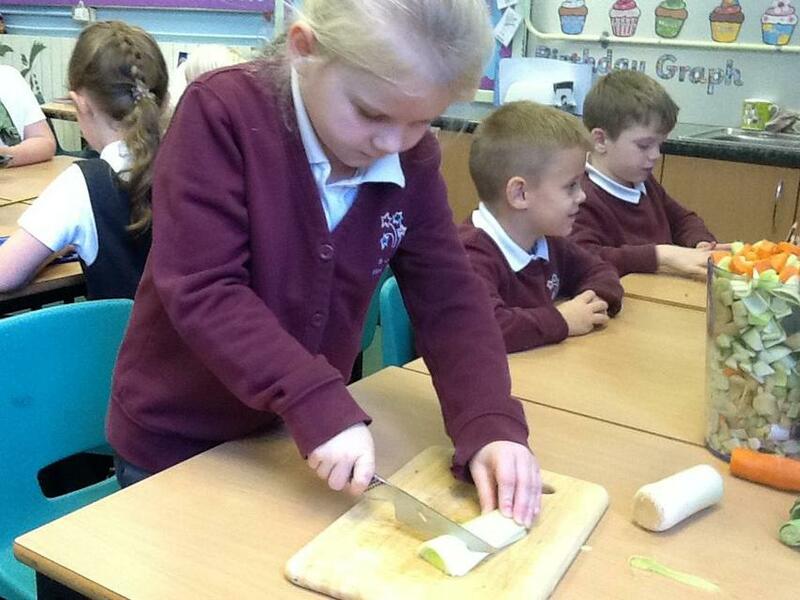 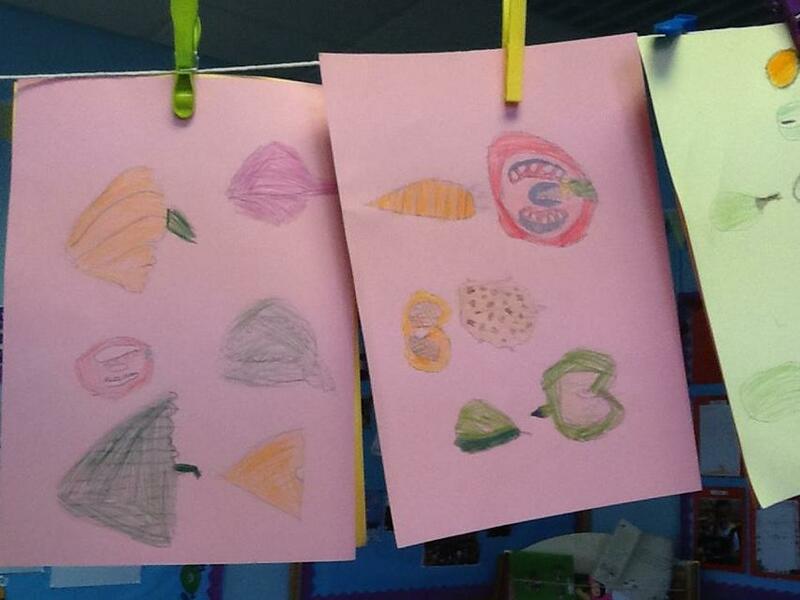 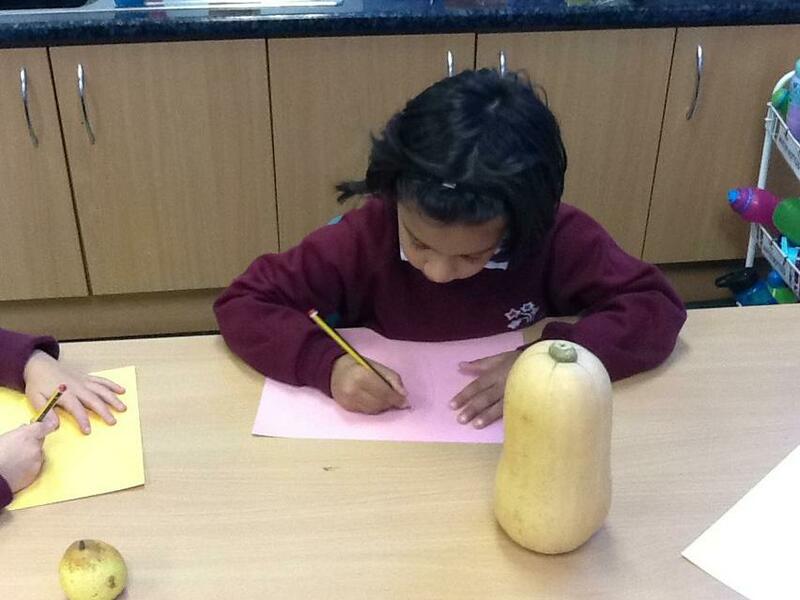 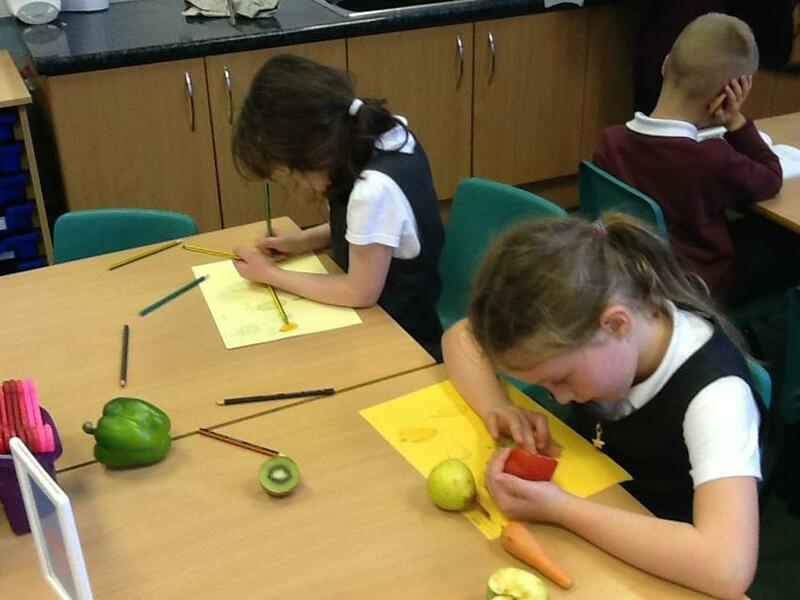 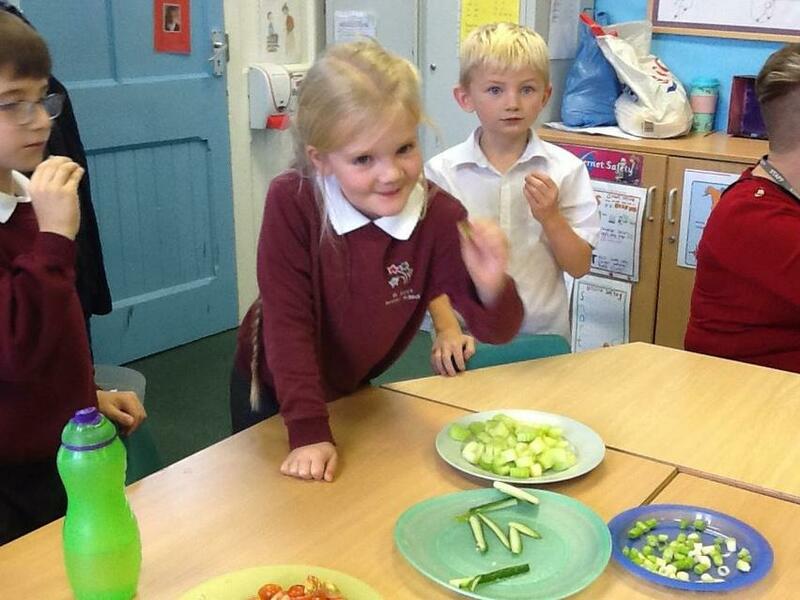 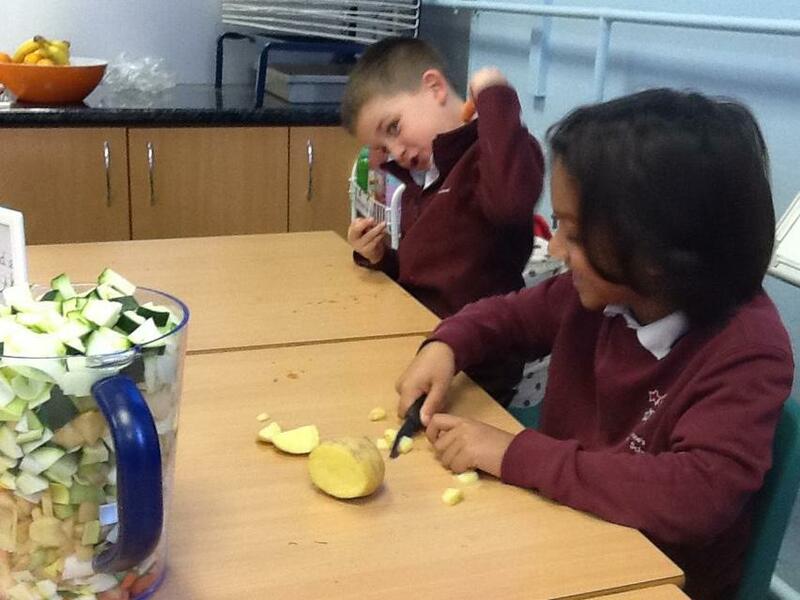 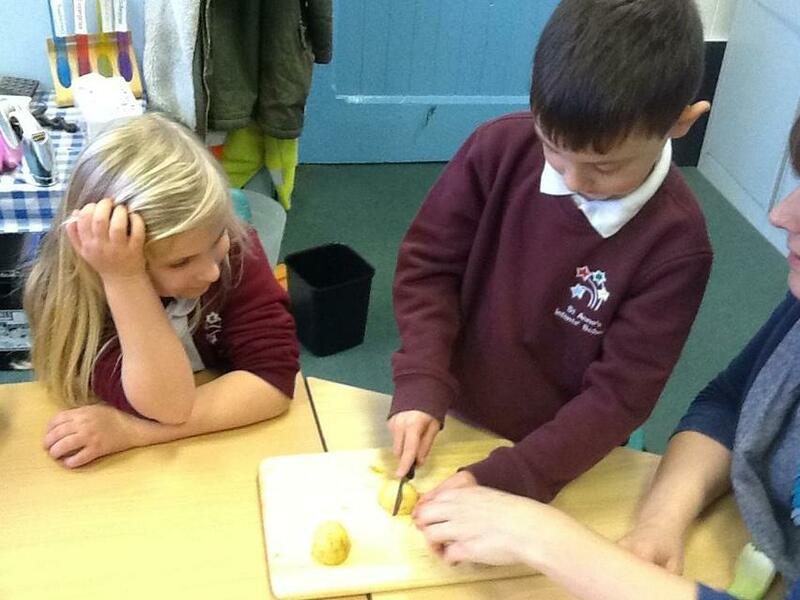 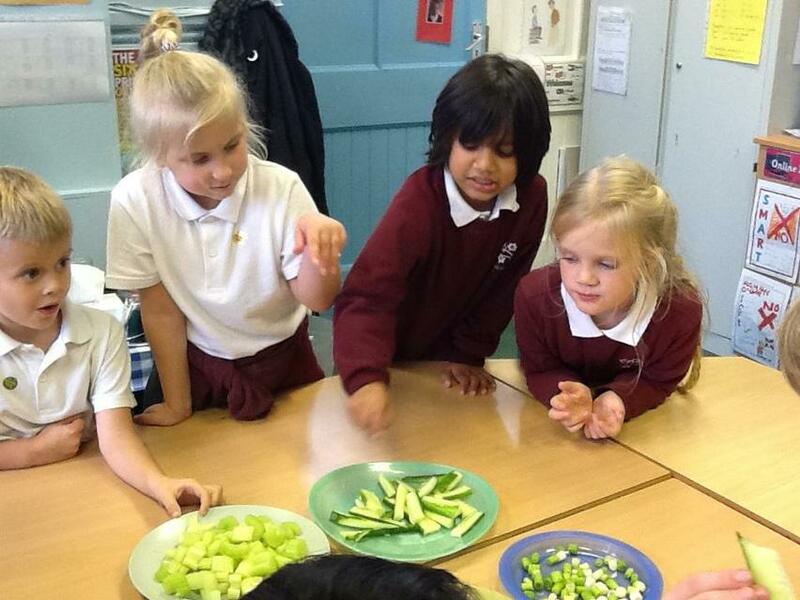 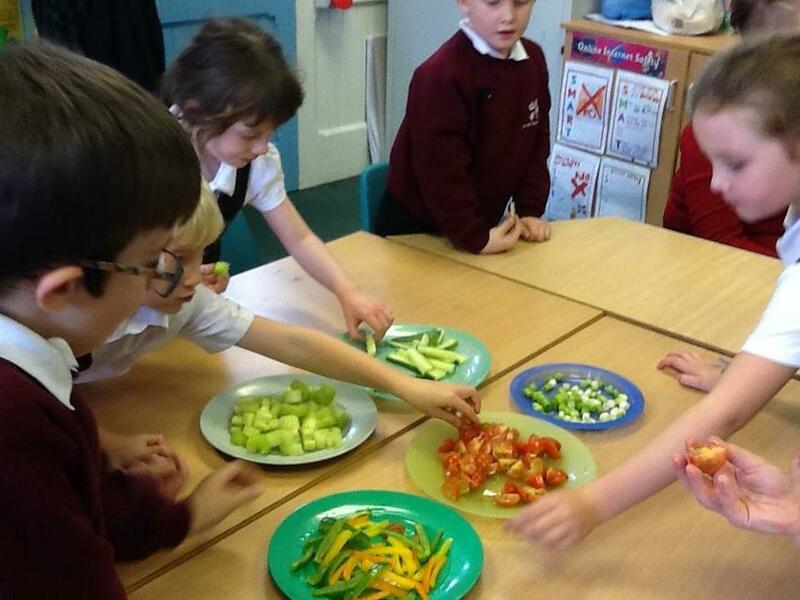 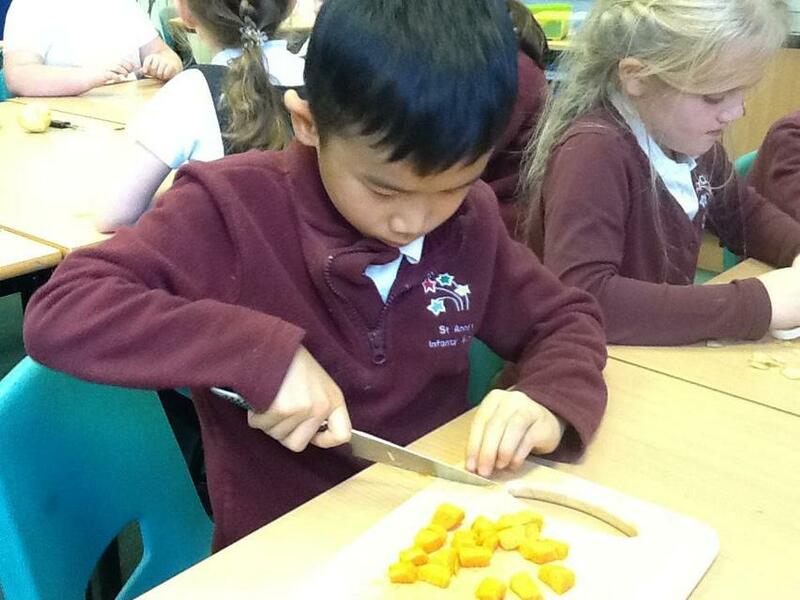 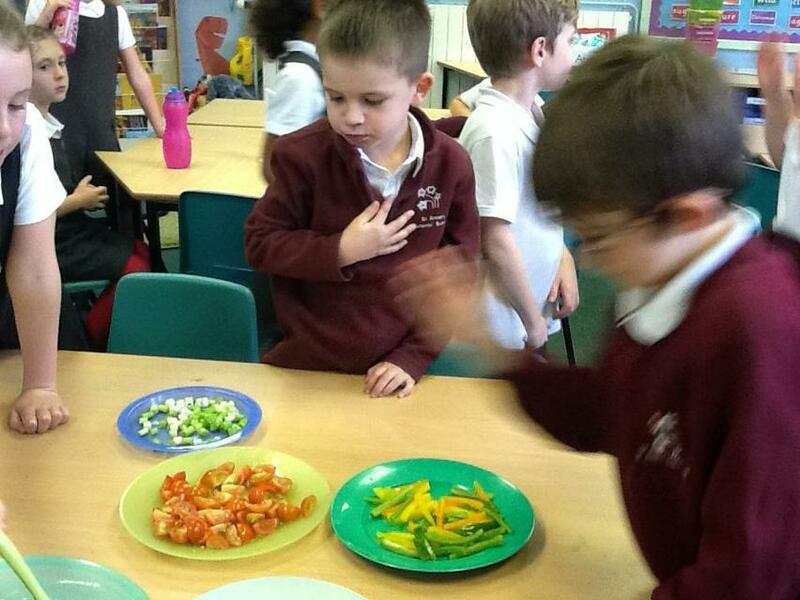 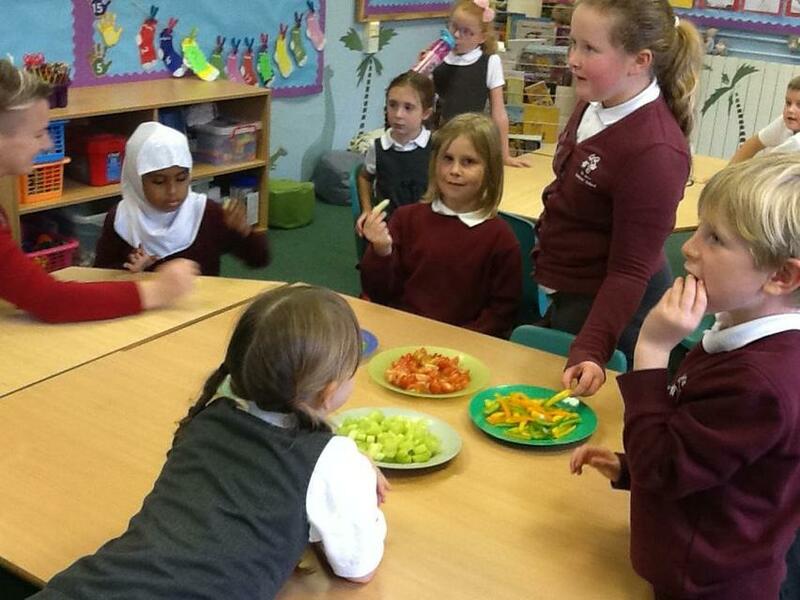 Today Year 2 used their knowledge of healthy food to choose and make a healthy dish! 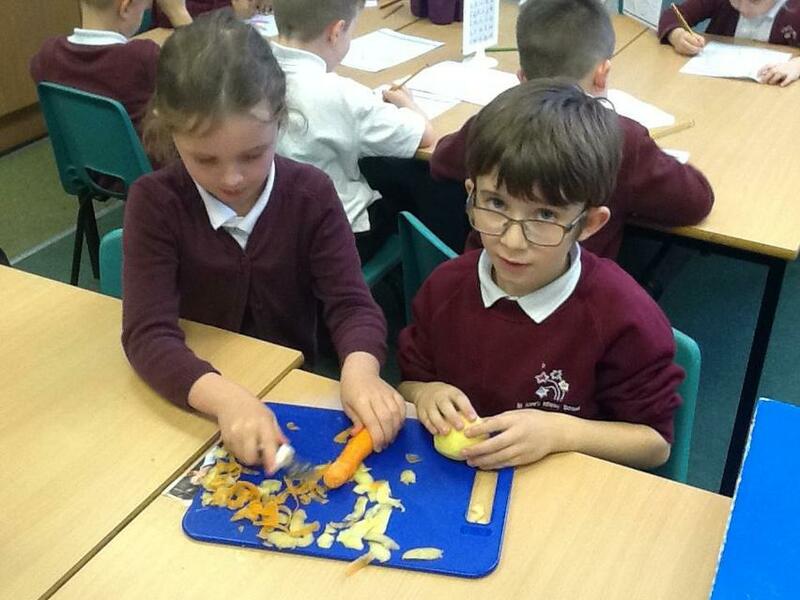 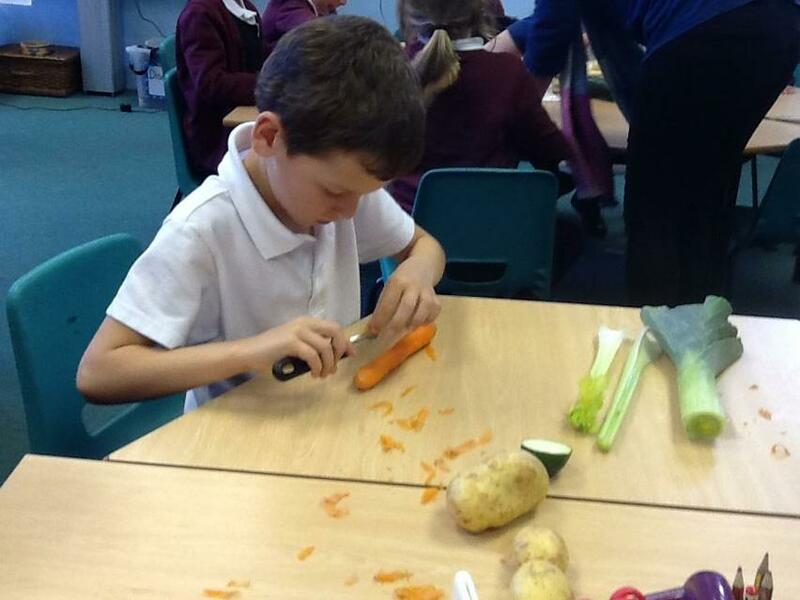 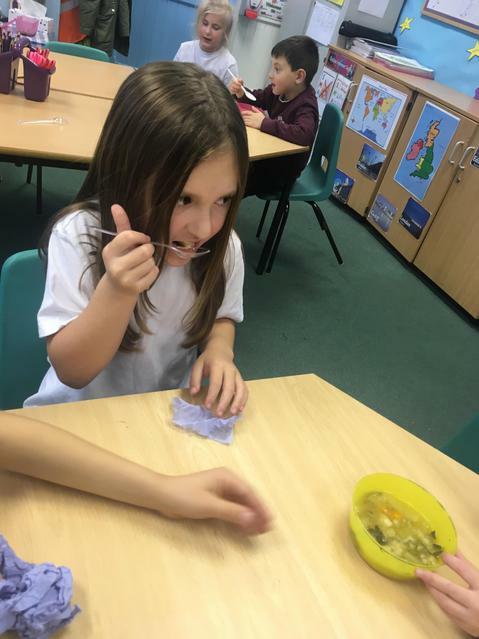 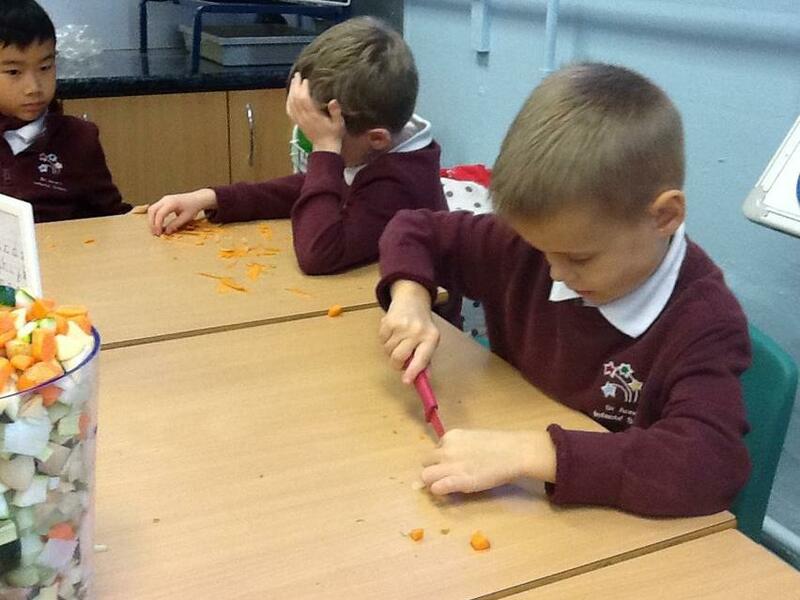 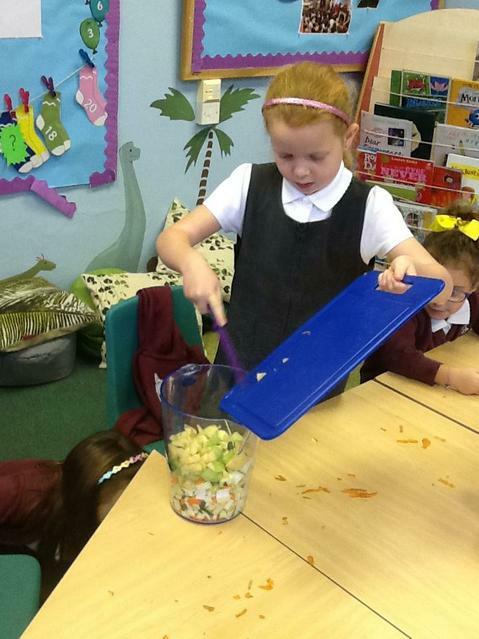 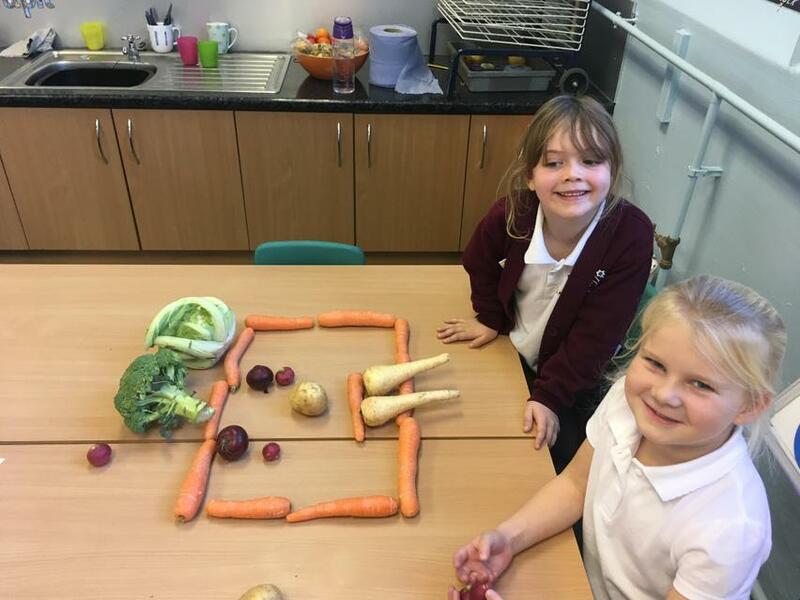 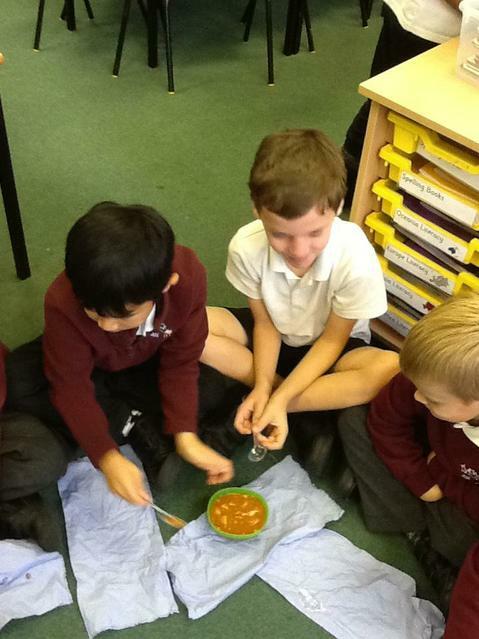 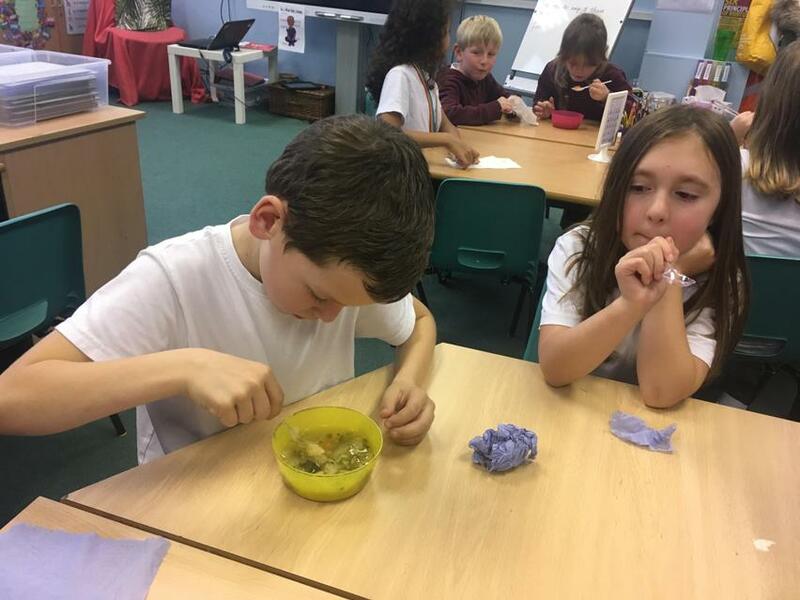 They voted as a class and chose to make a vegetable soup. 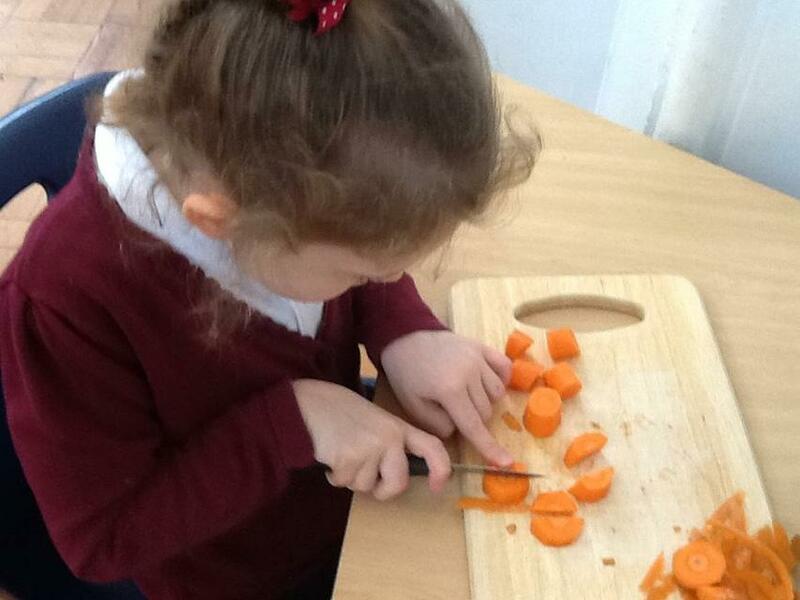 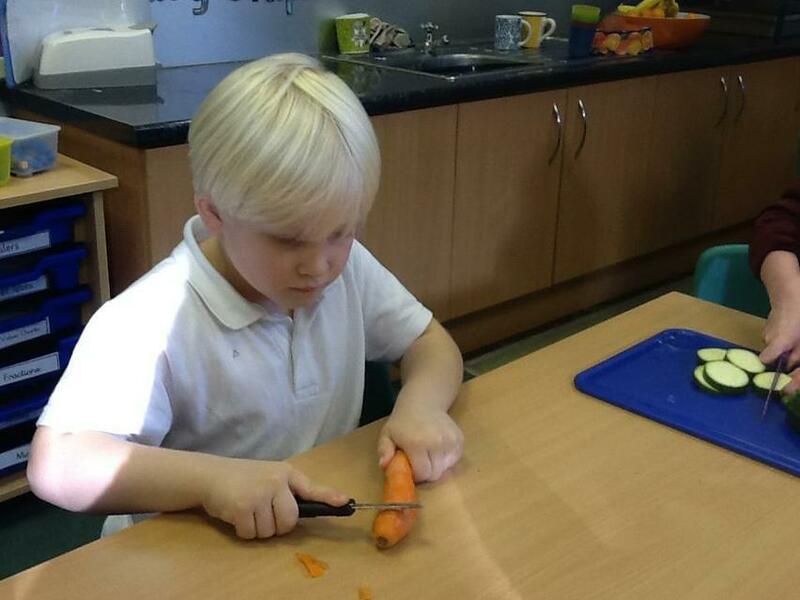 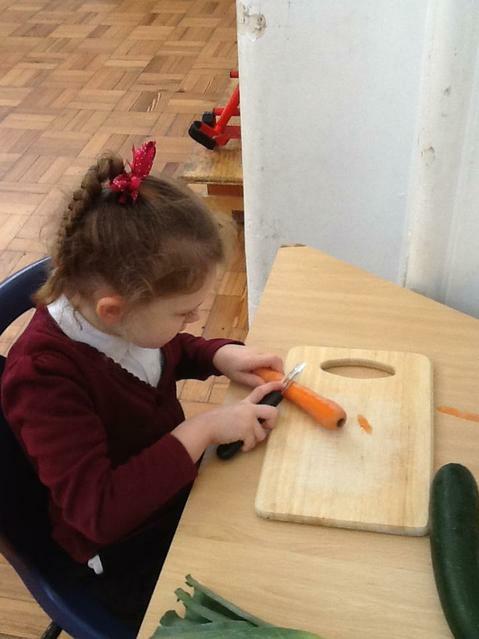 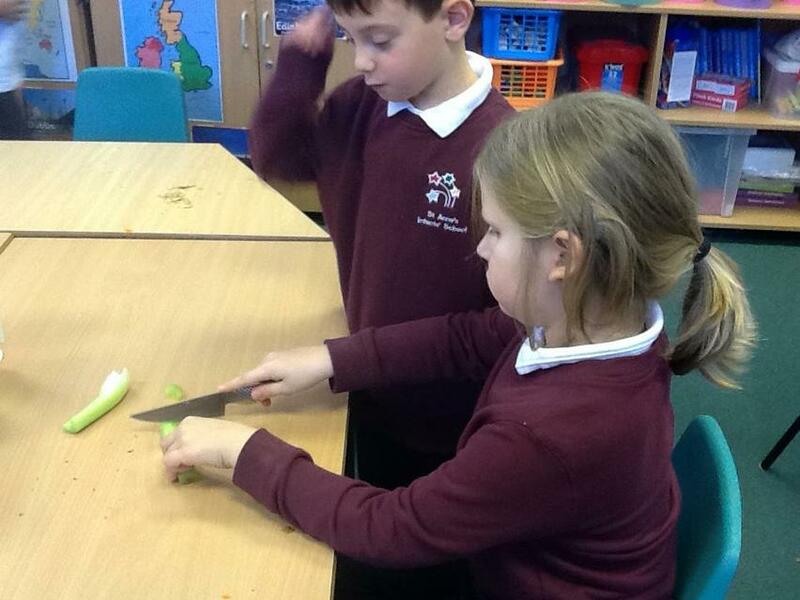 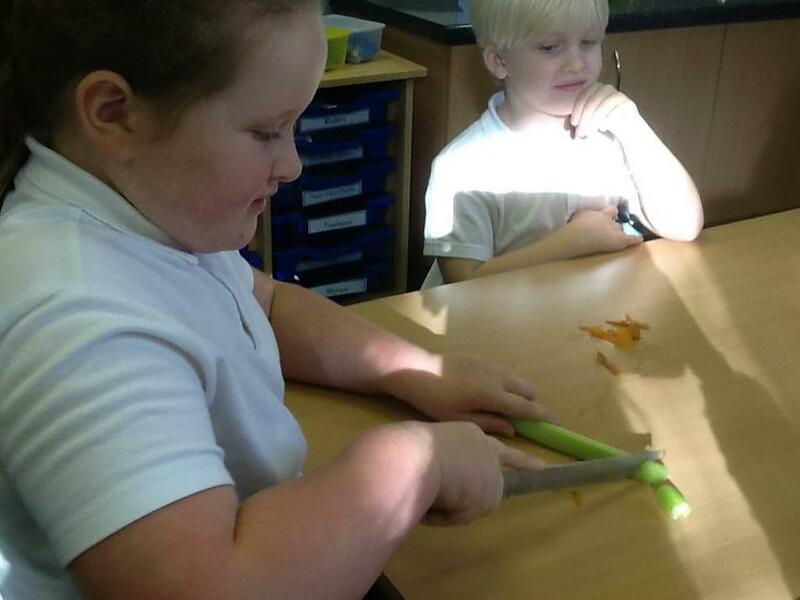 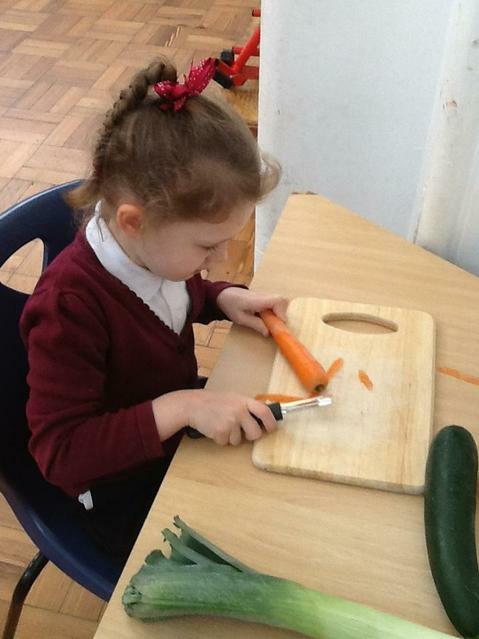 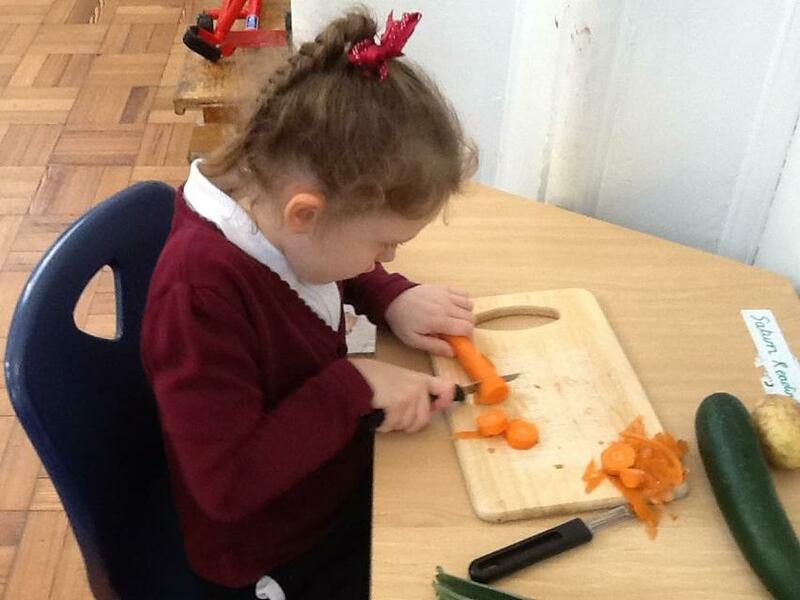 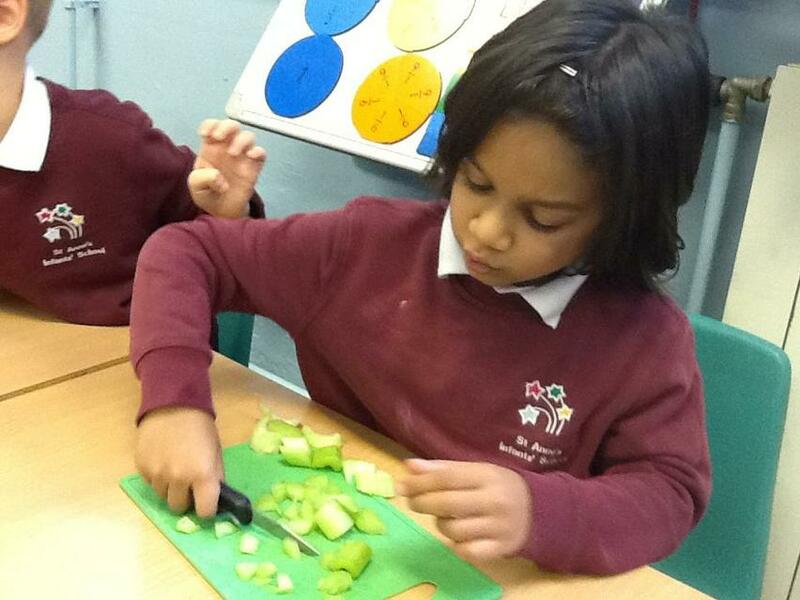 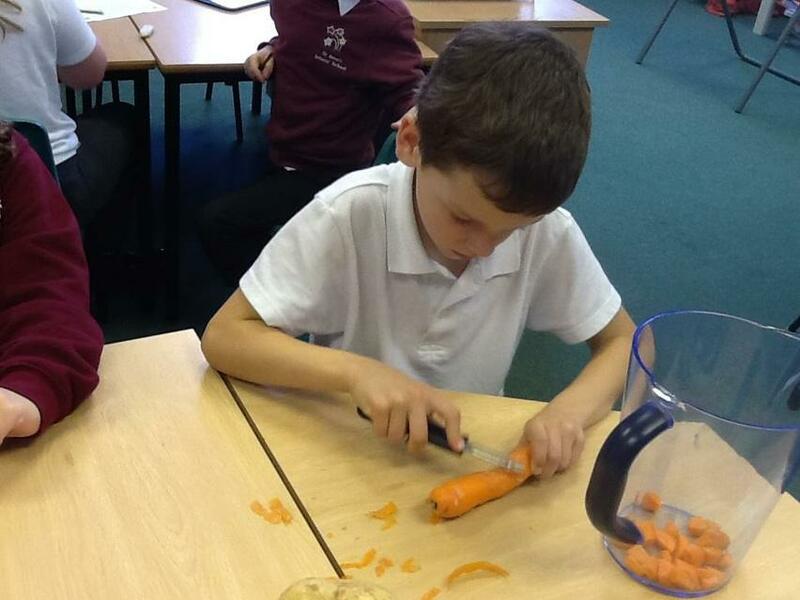 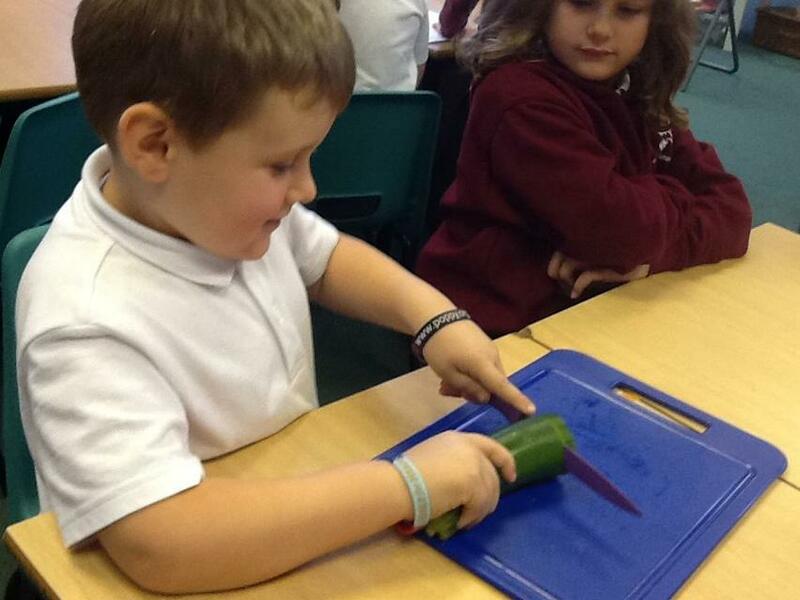 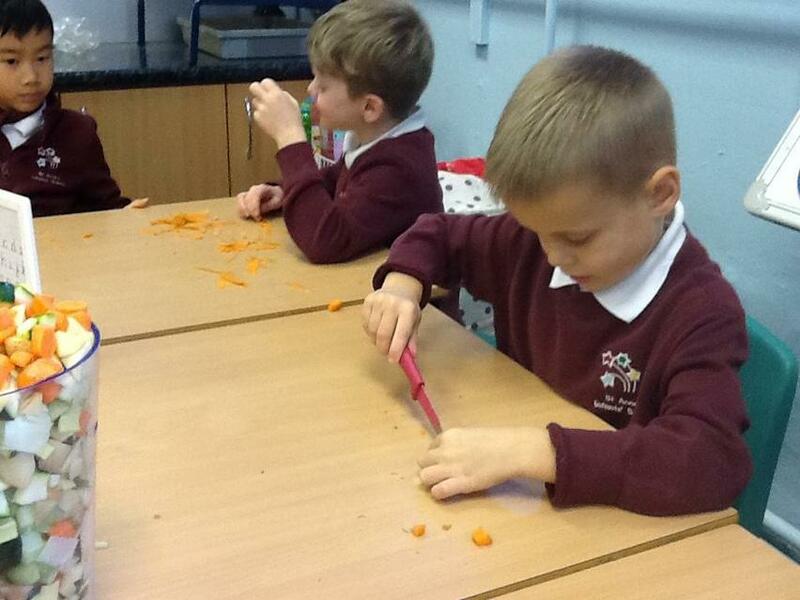 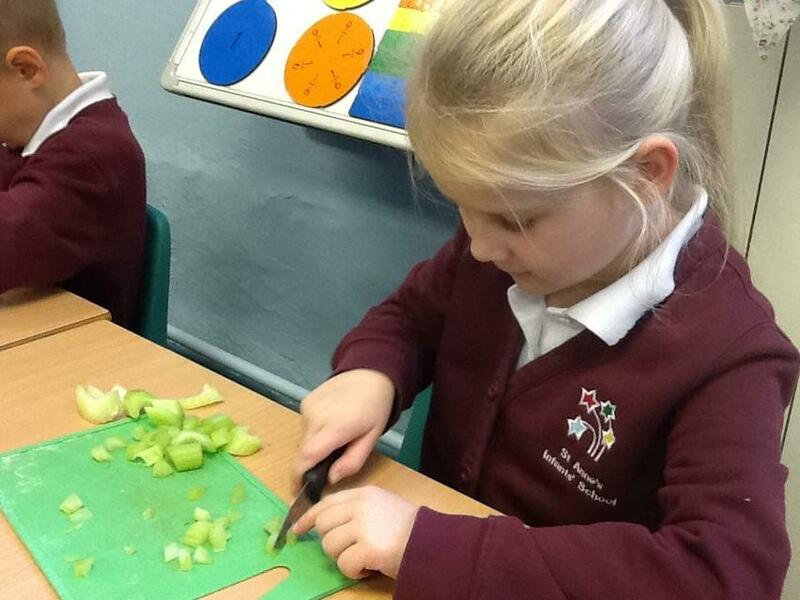 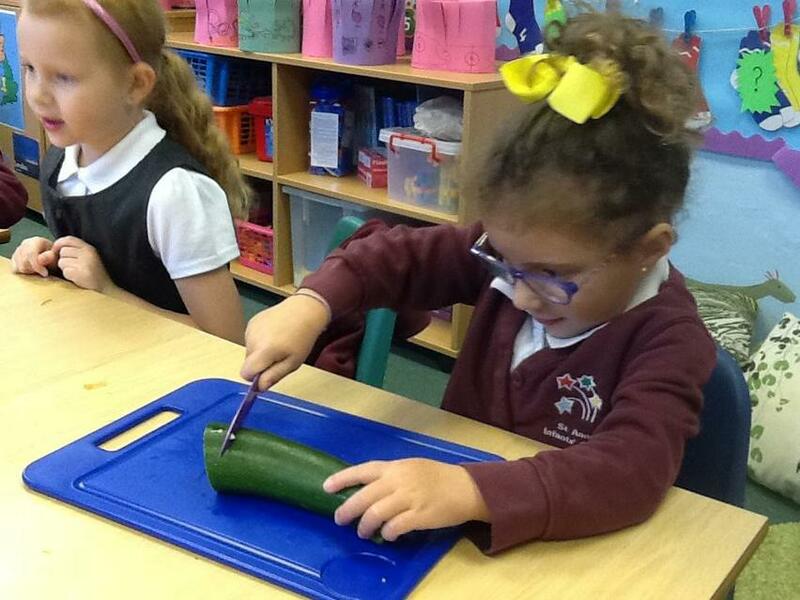 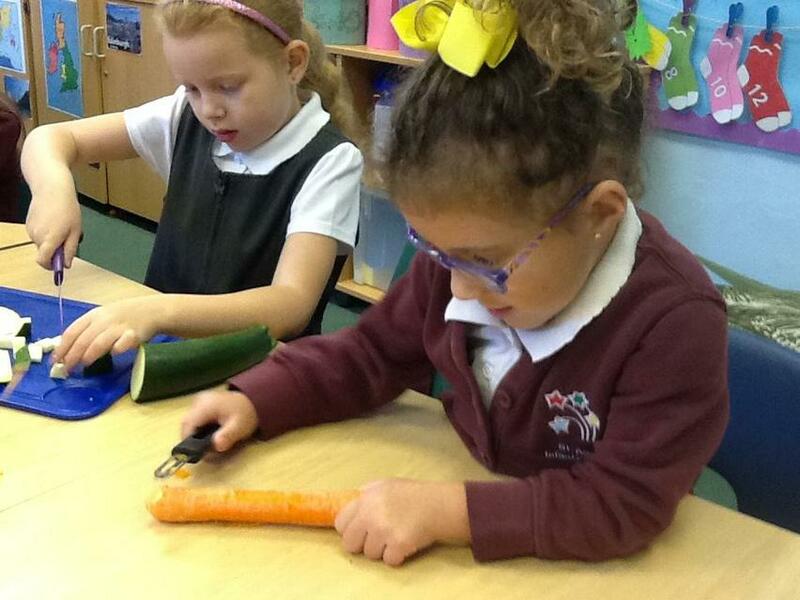 They learned how to safely use a knife to cut each vegetable into small pieces, and learned how to position their hands to keep safe. 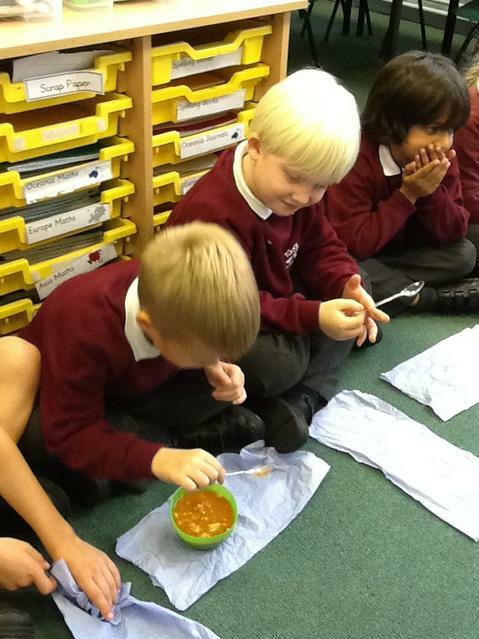 We're all excited to try the soup tomorrow!! 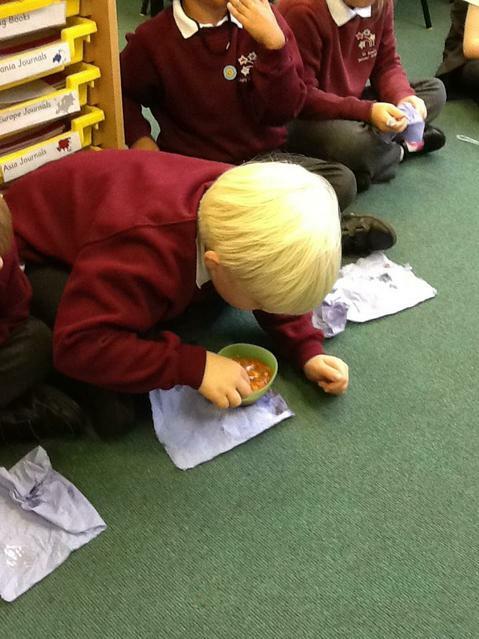 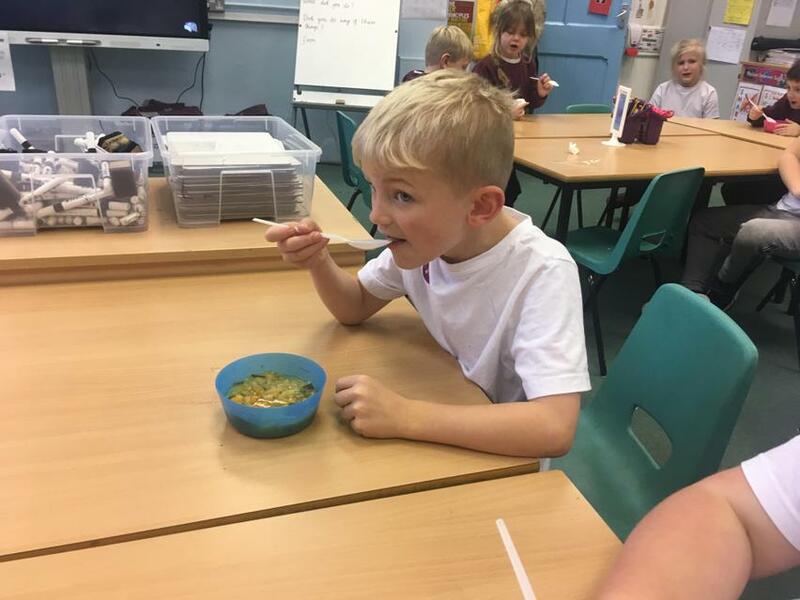 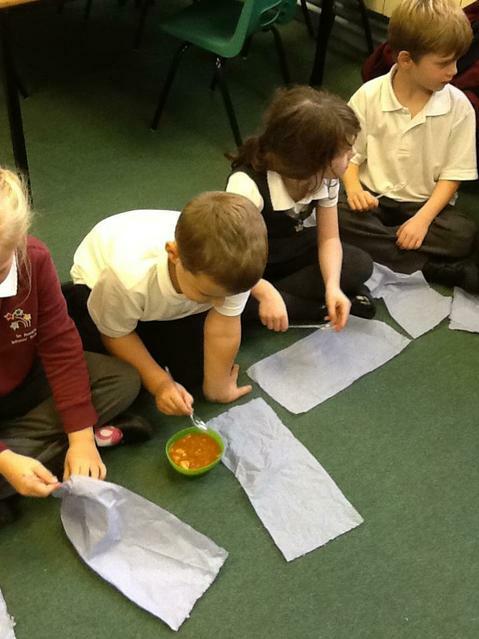 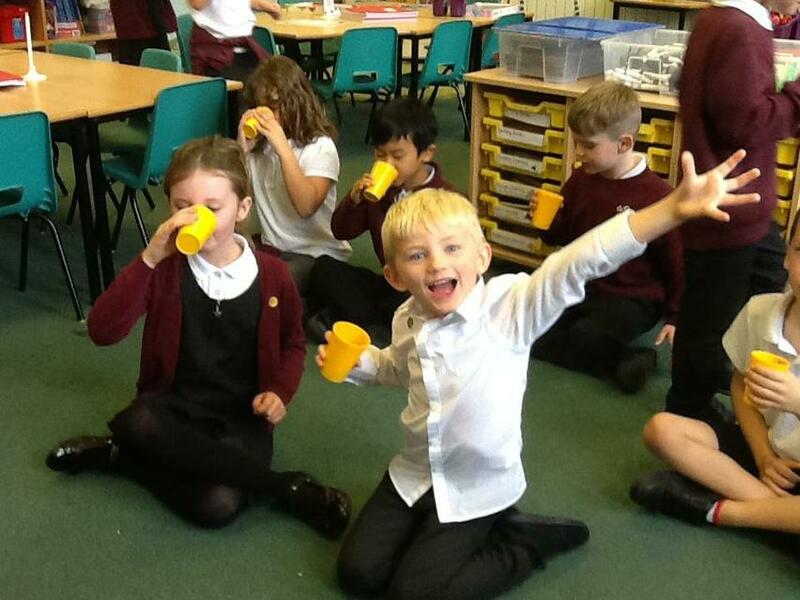 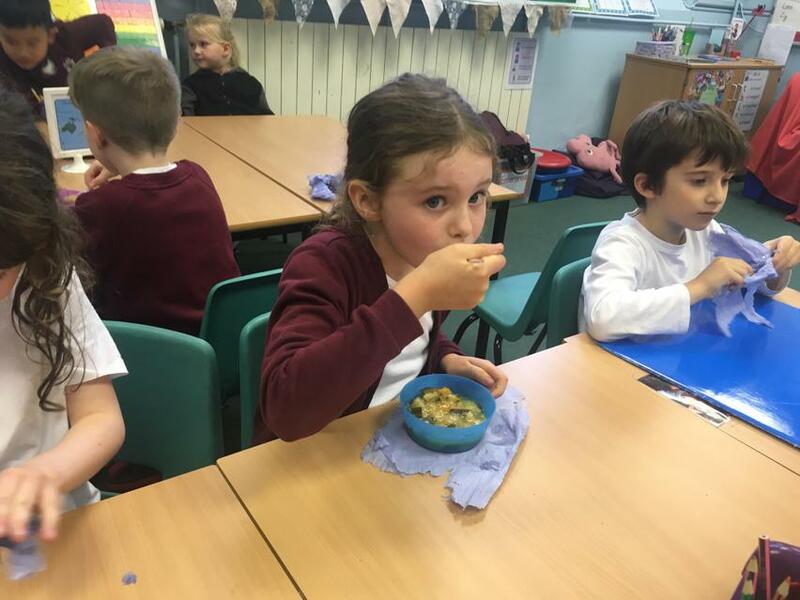 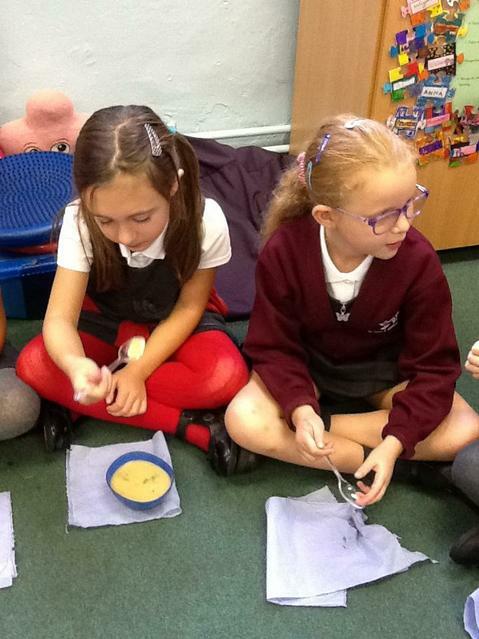 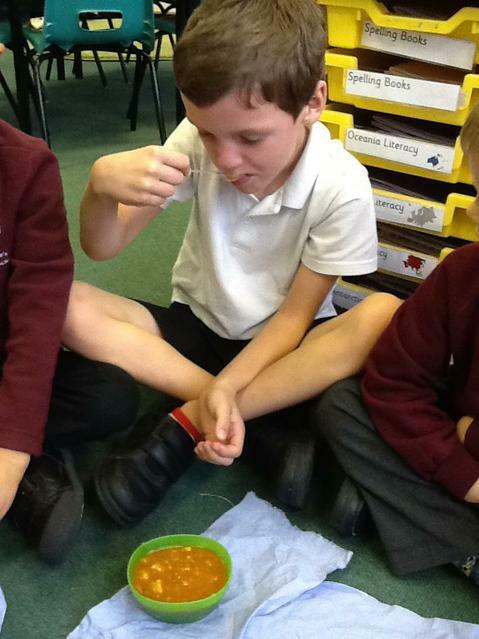 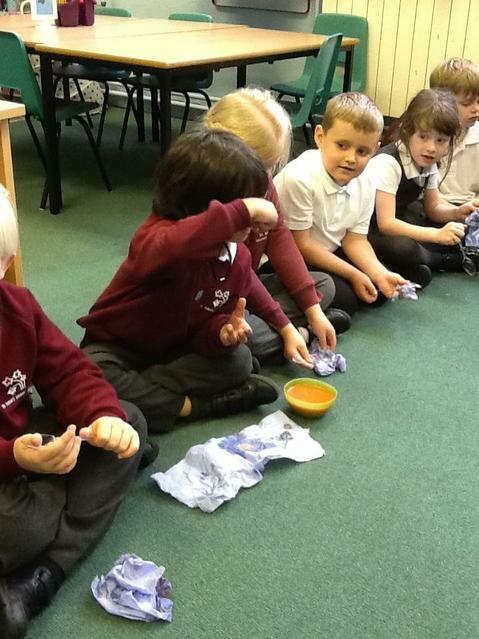 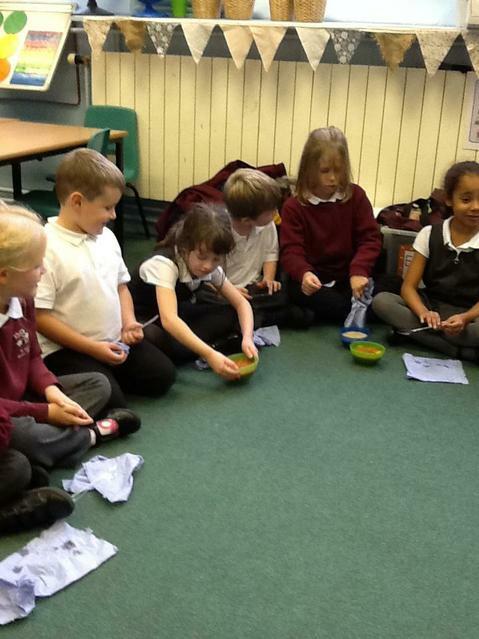 We tasted our trial soup today! 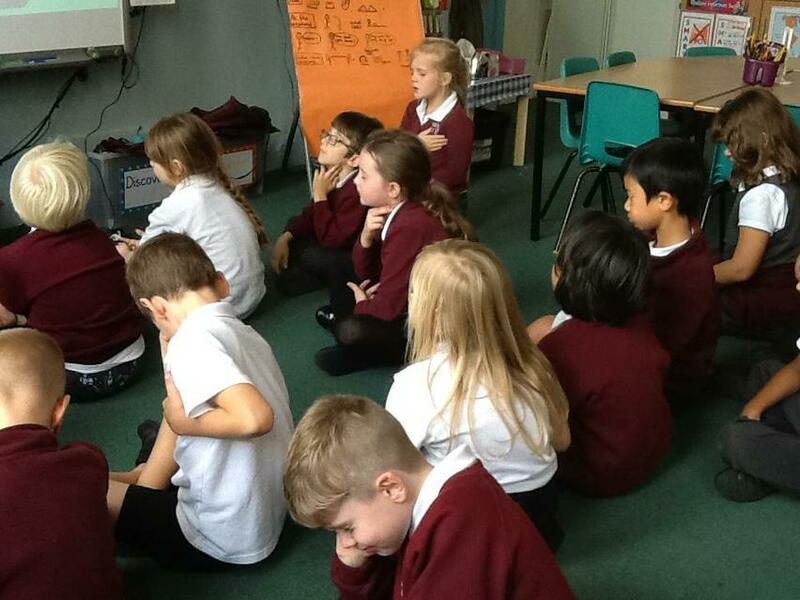 We then evaluated what we liked about it, and what we could do to improve it. 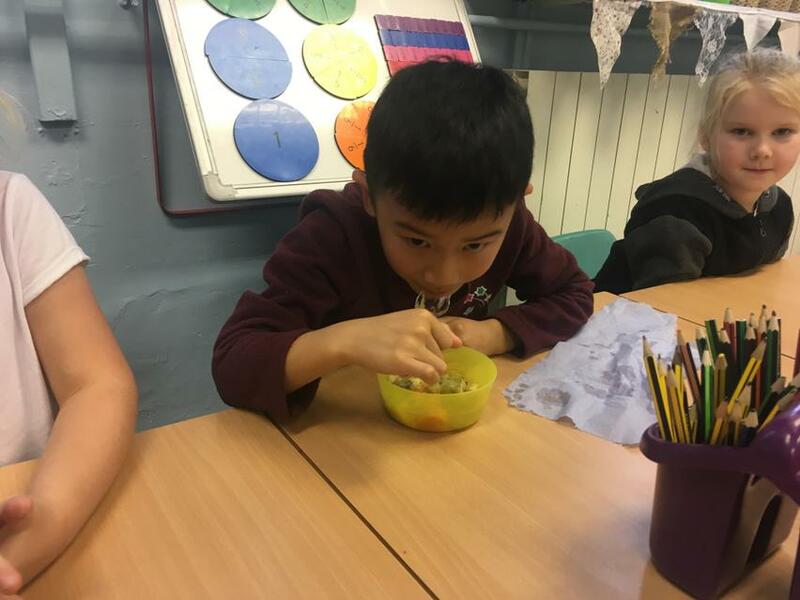 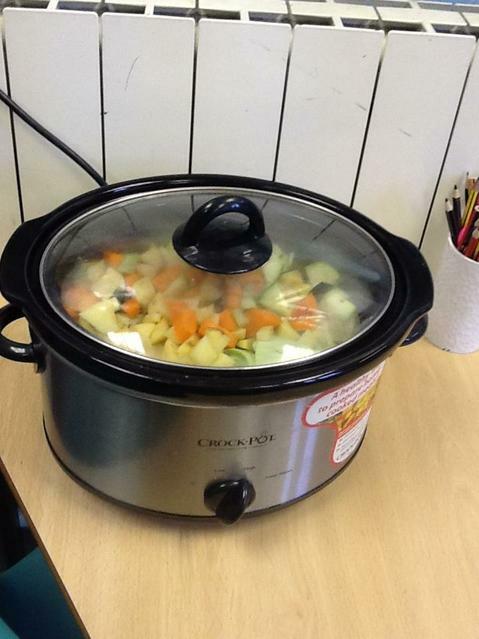 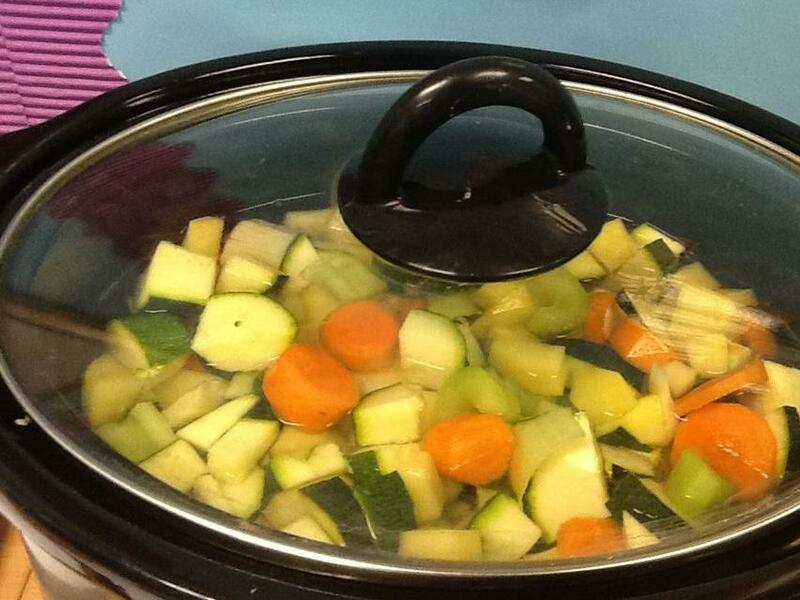 As engineers we have tweaked our vegetable soup recipe to make a new batch to serve to our grown ups tomorrow afternoon!